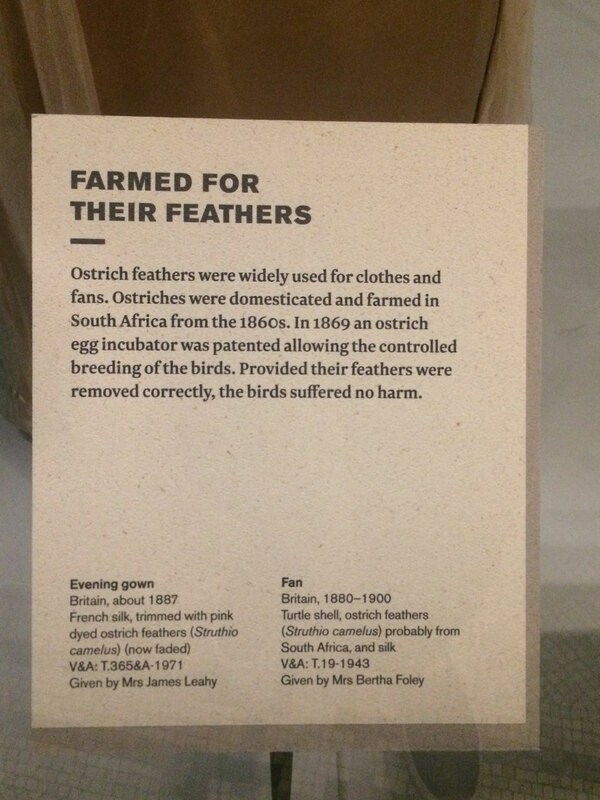 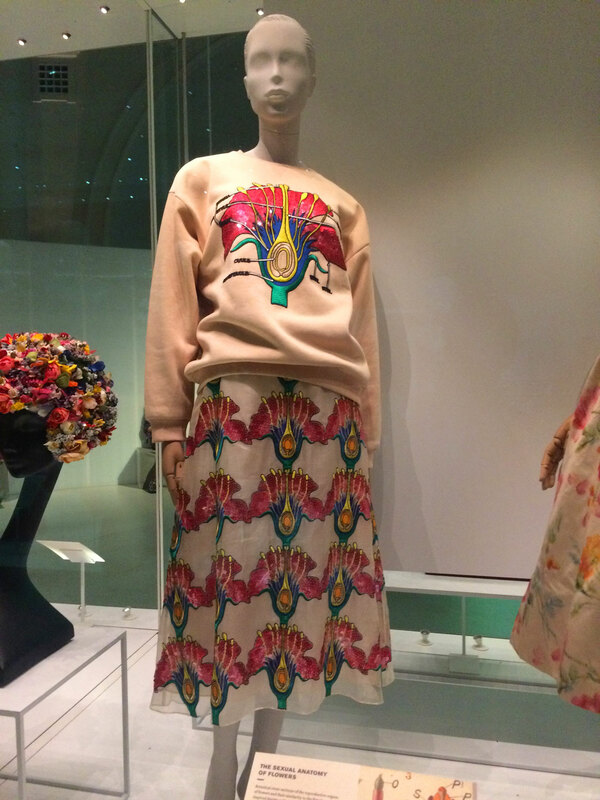 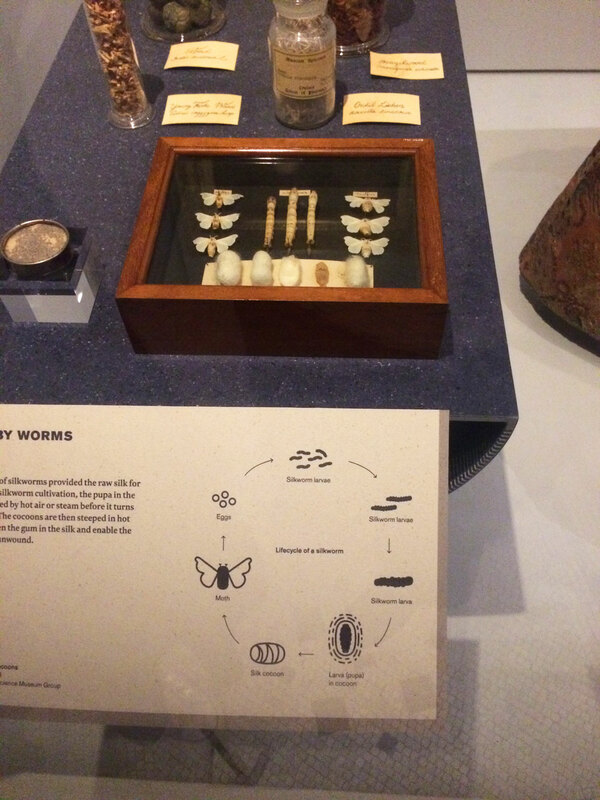 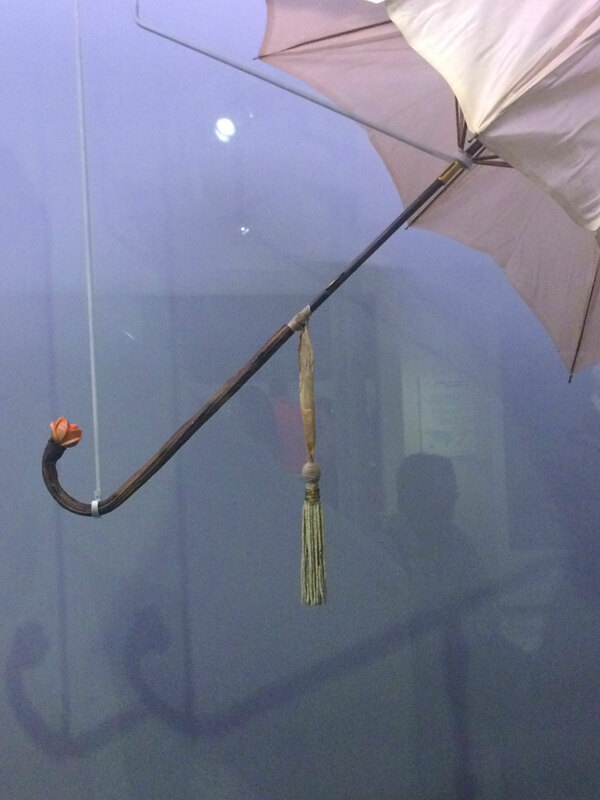 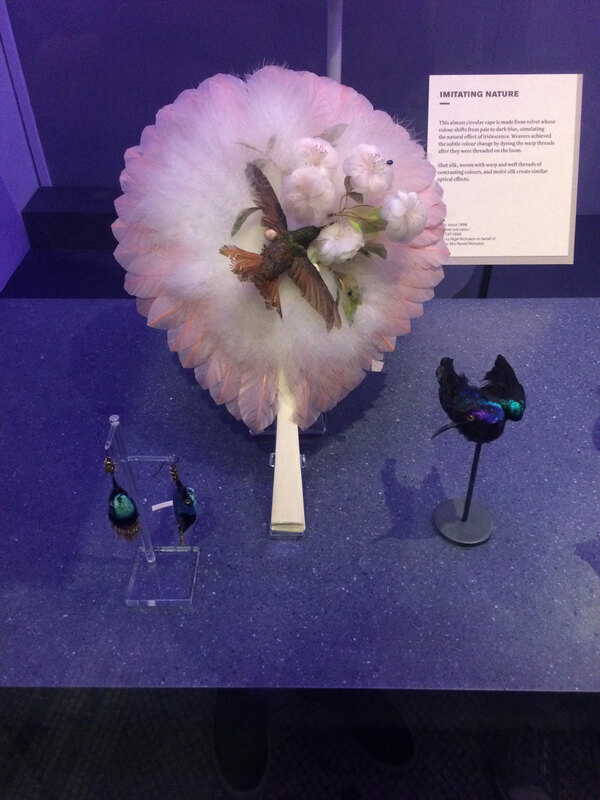 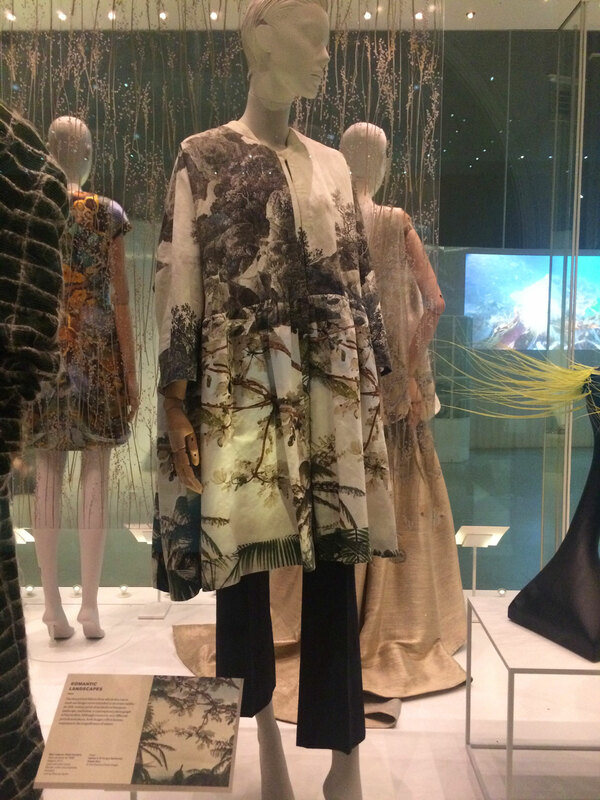 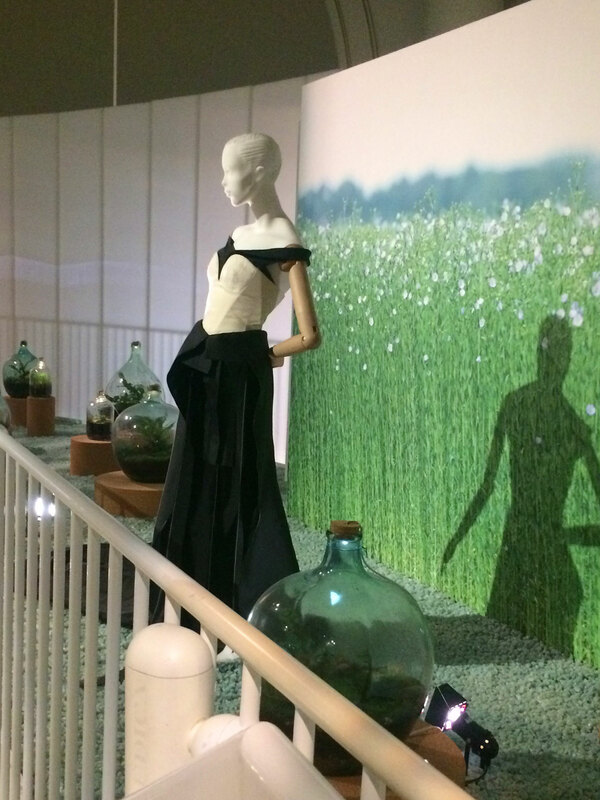 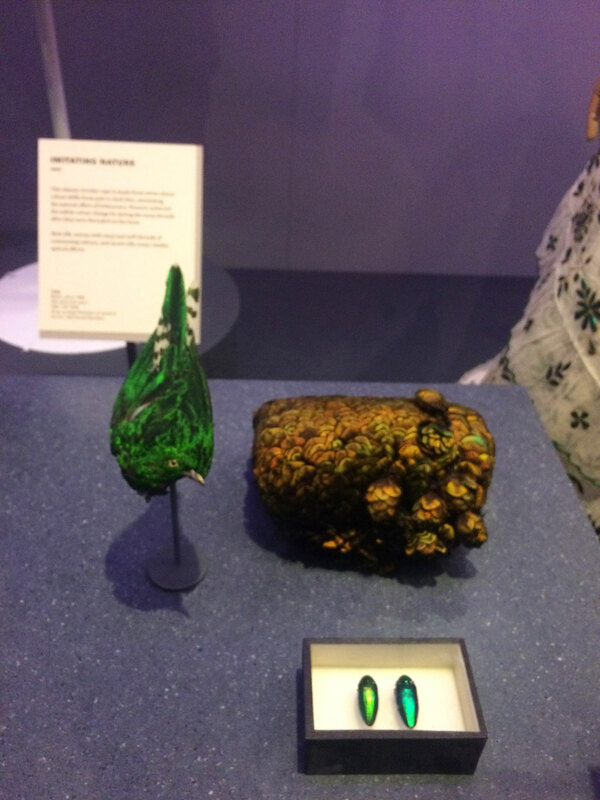 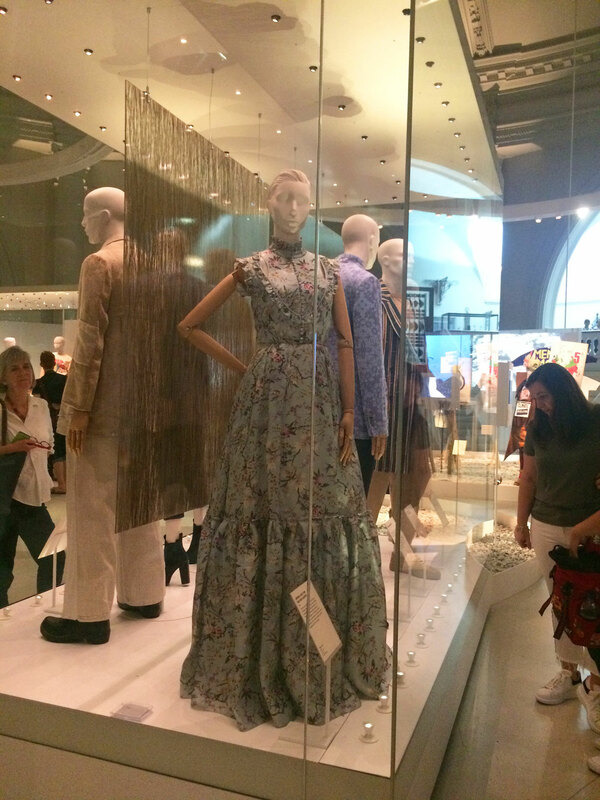 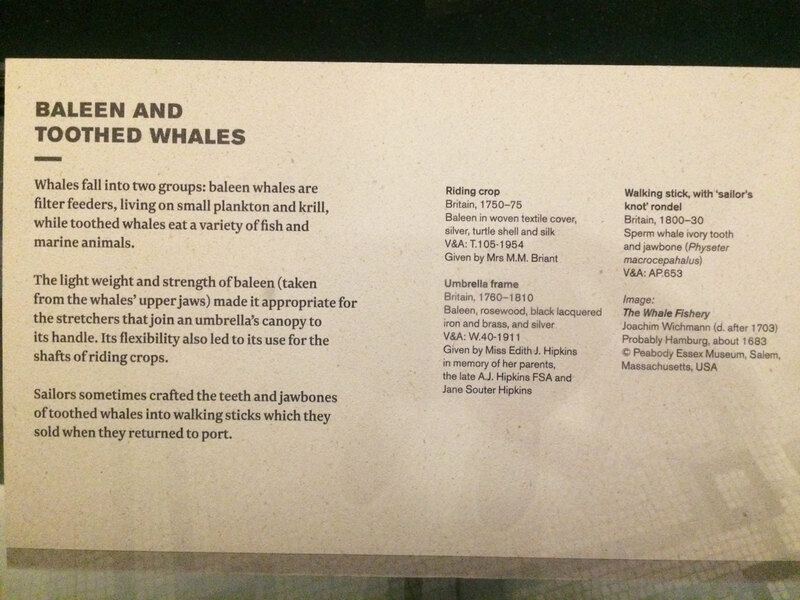 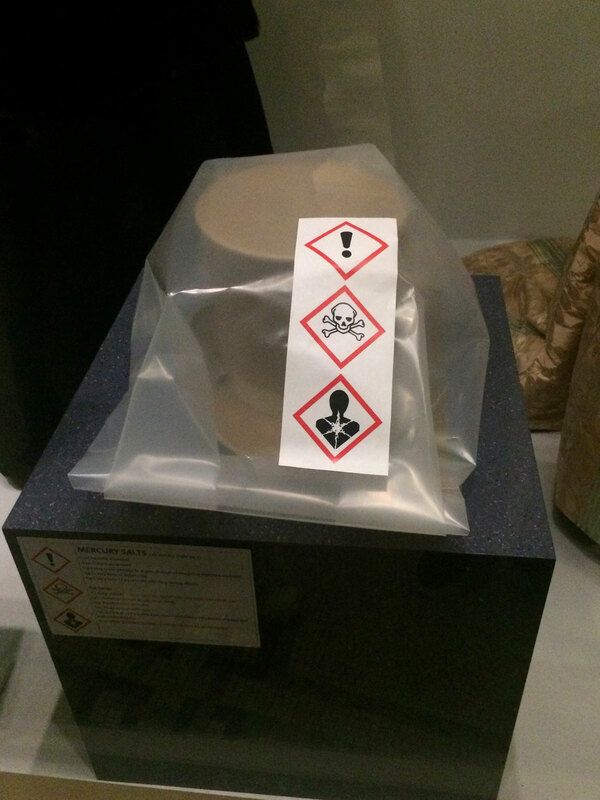 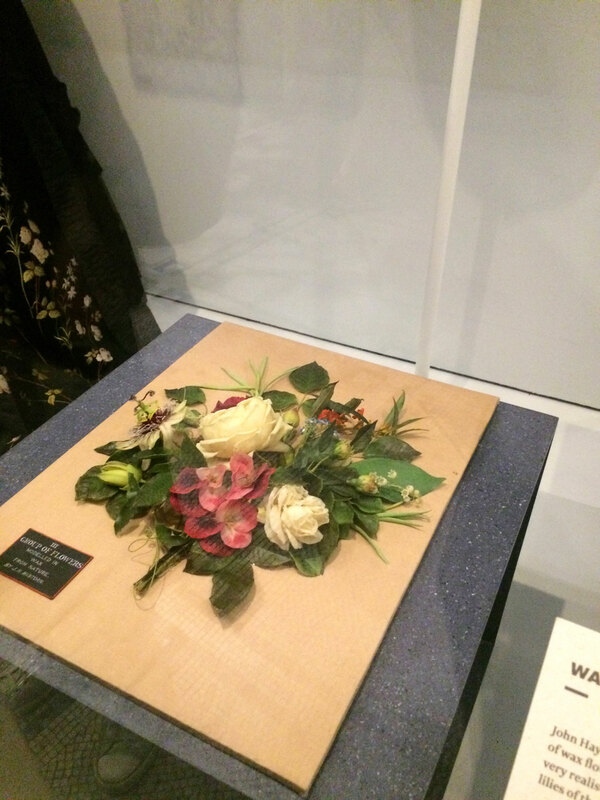 A couple of weekends ago I went to the Fashioned From Nature exhibition at the Victoria and Albert Museum in London. 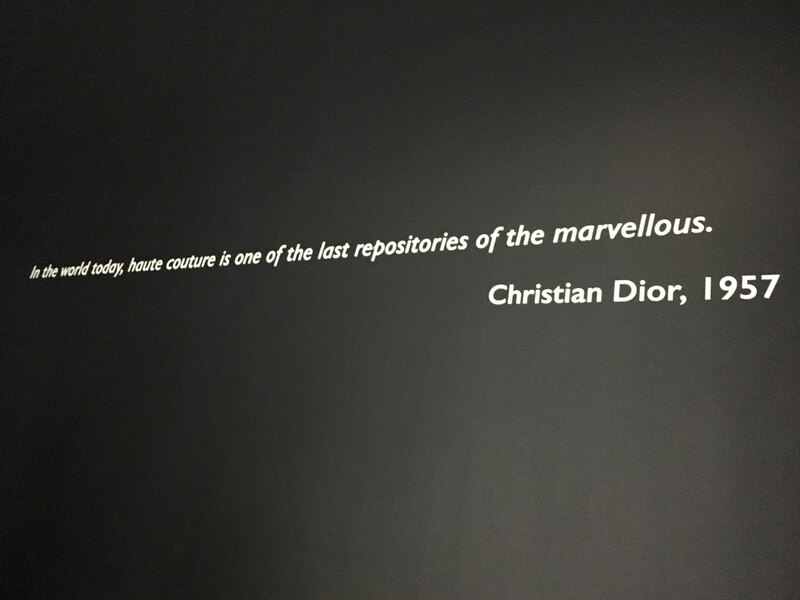 It’s on until January next year and if you are able to, I would really recommend you try to make it to see it. 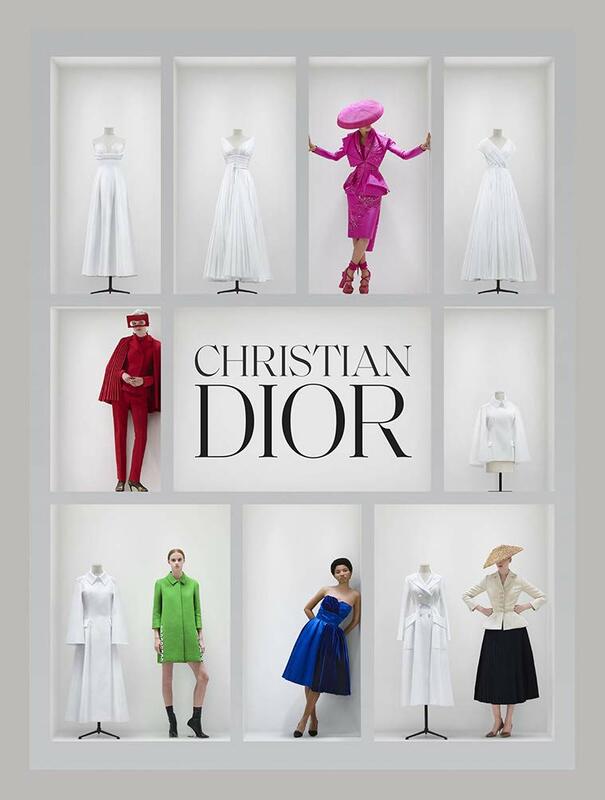 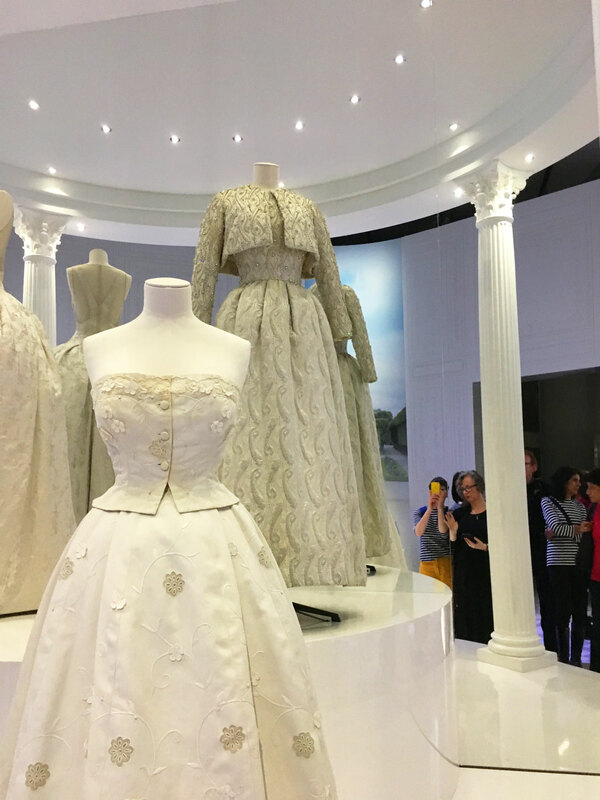 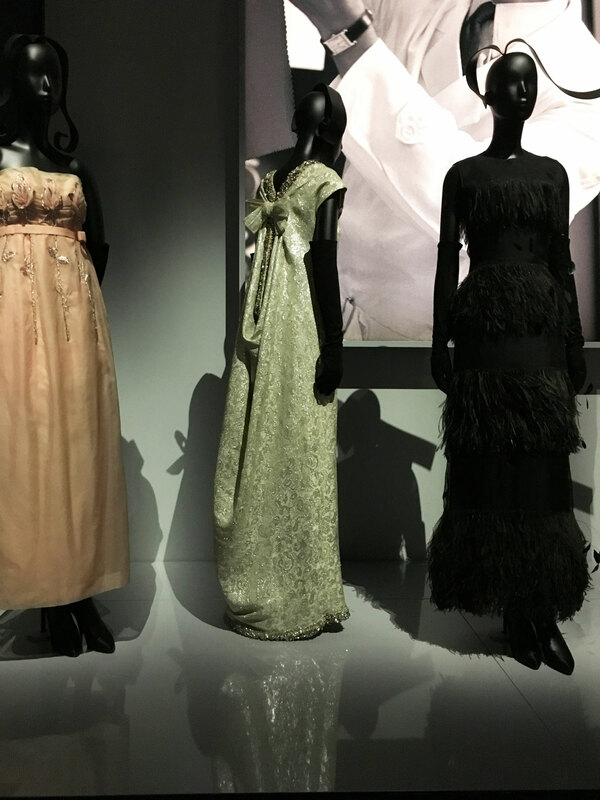 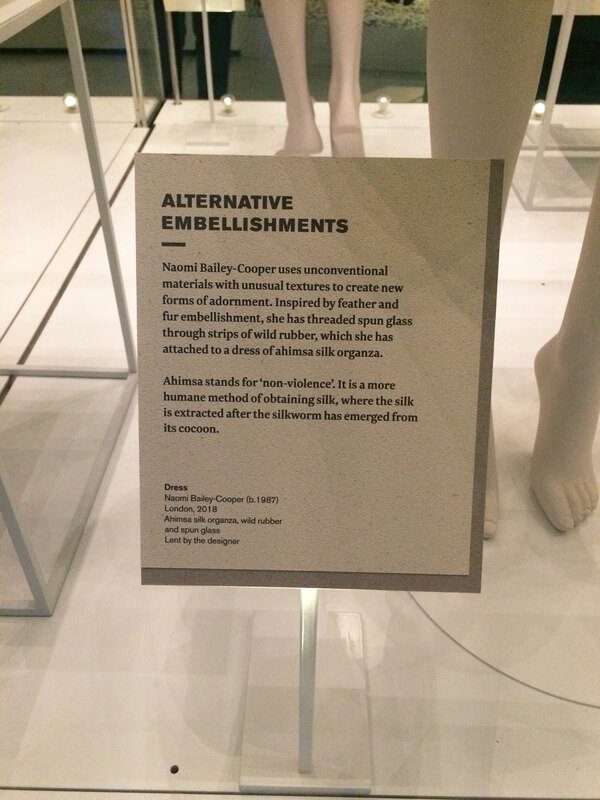 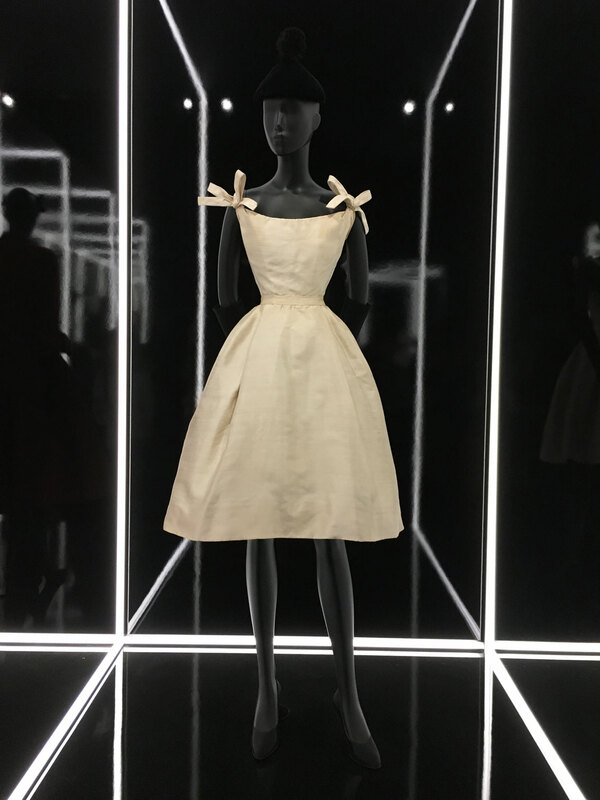 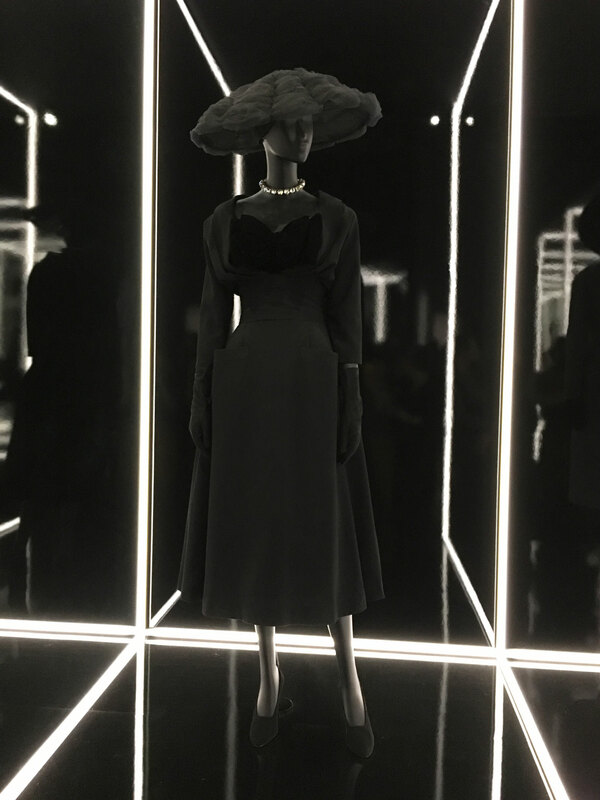 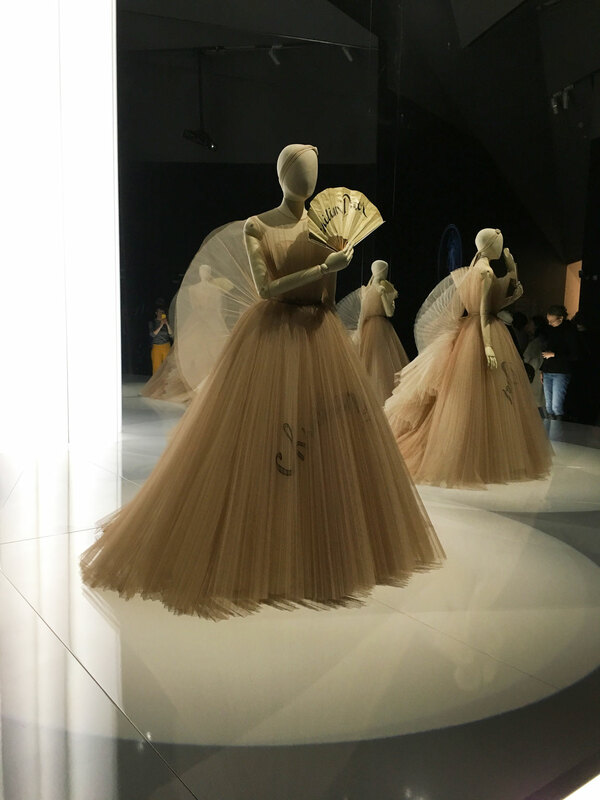 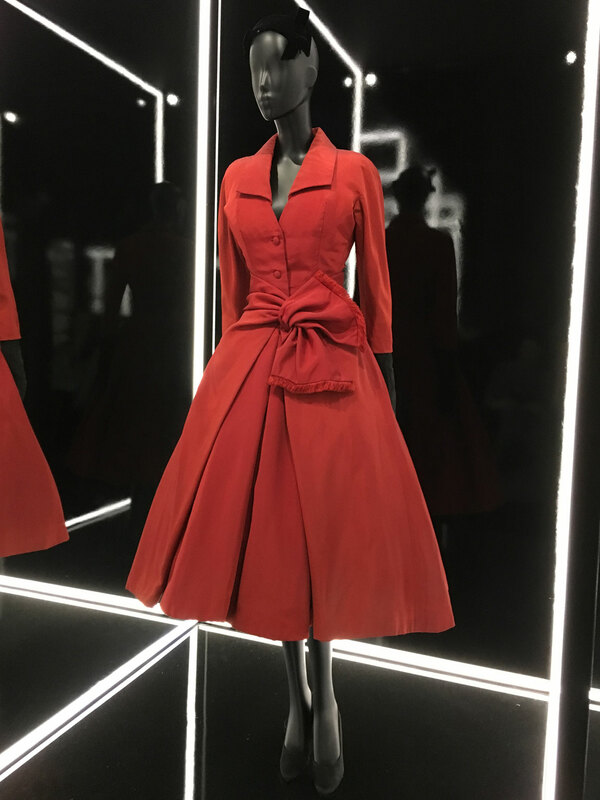 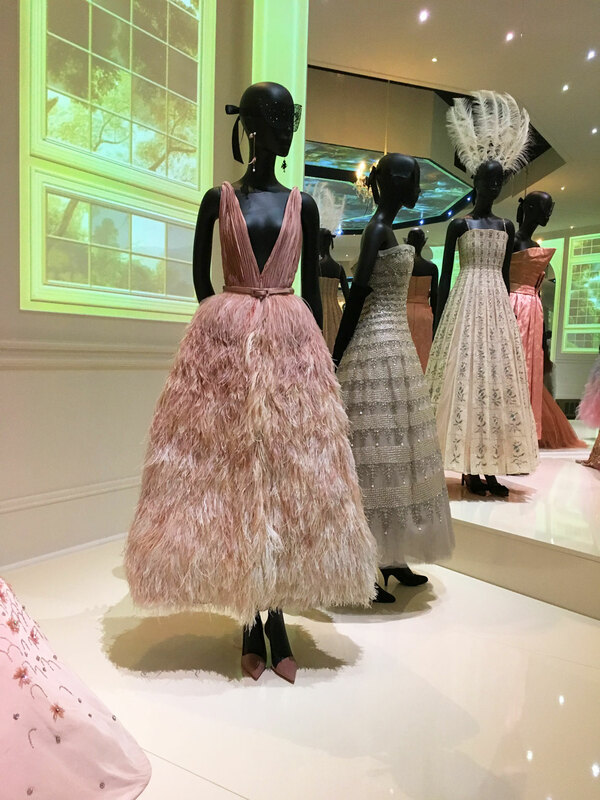 It’s in the same place as the Balenciaga exhibition but for some reason I thought it would be smaller, but I was really amazed at the scaled of the exhibits and the accompanying information. 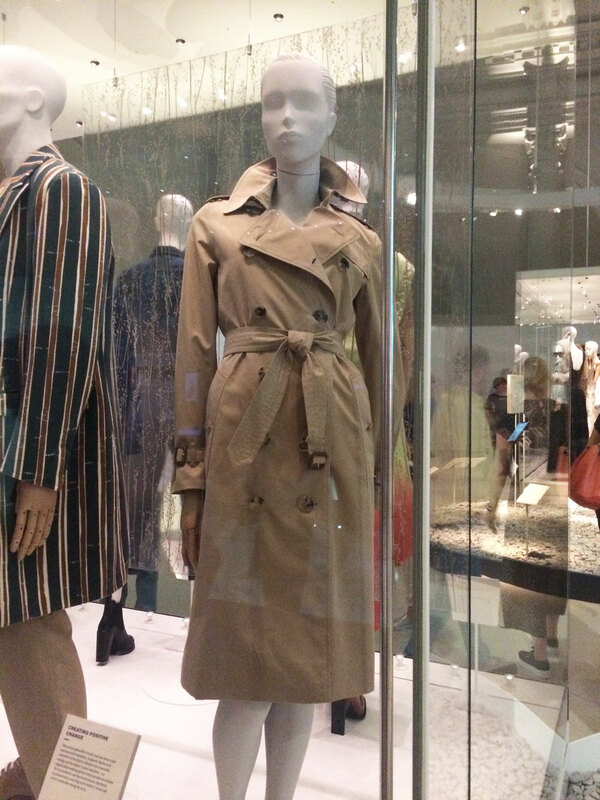 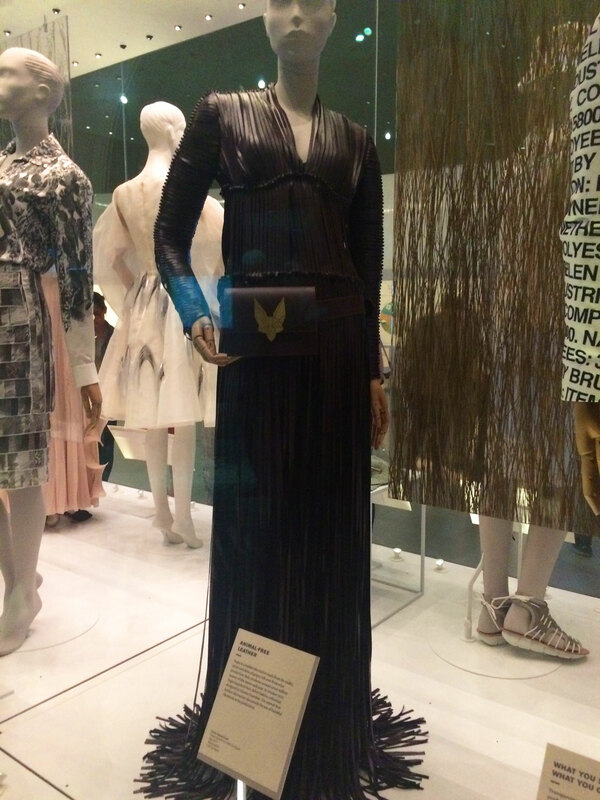 I think we took longer to look around this one than the Balenciaga one! 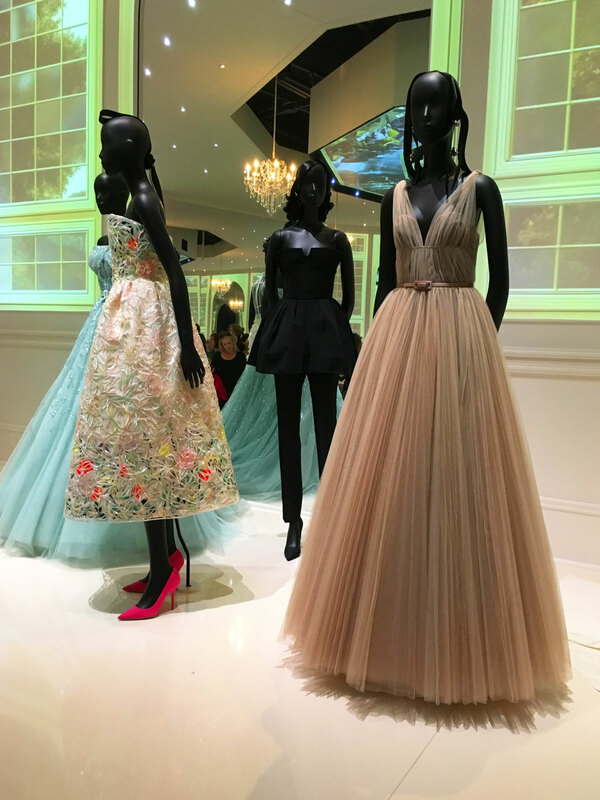 Fair warning, this post is very photo-heavy! 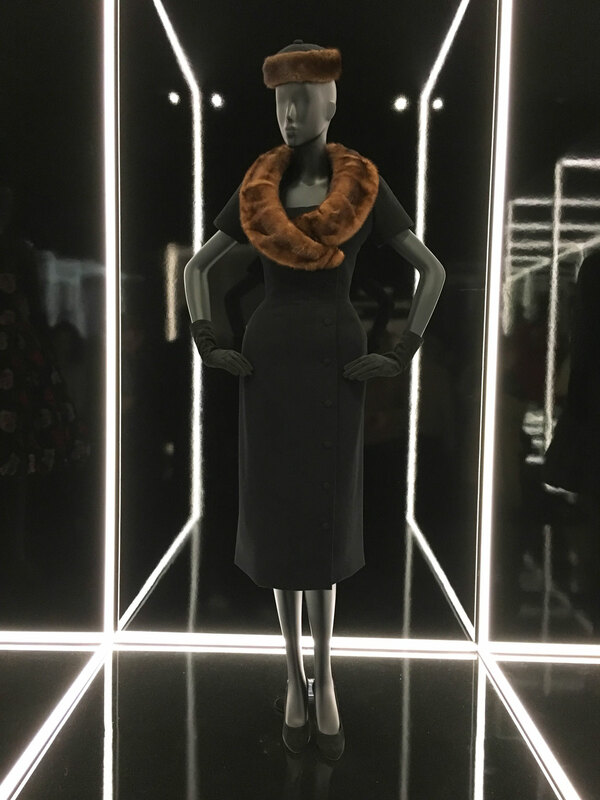 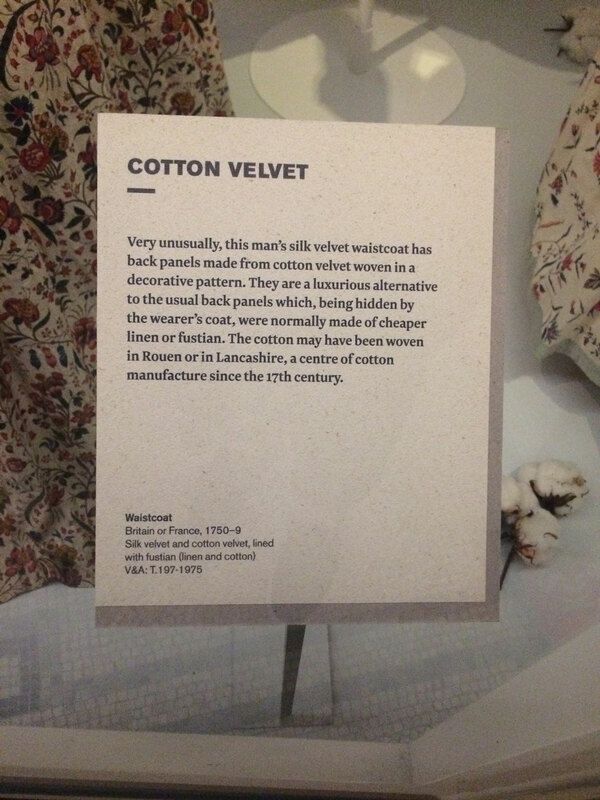 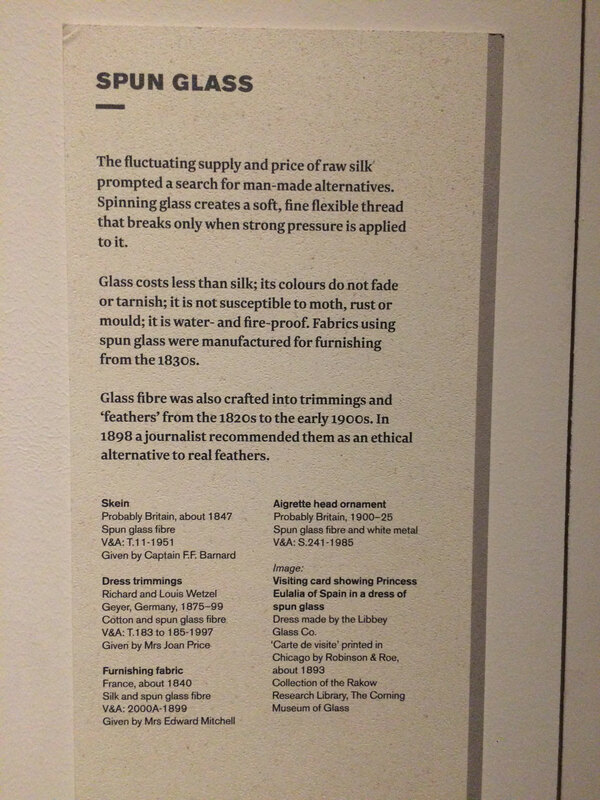 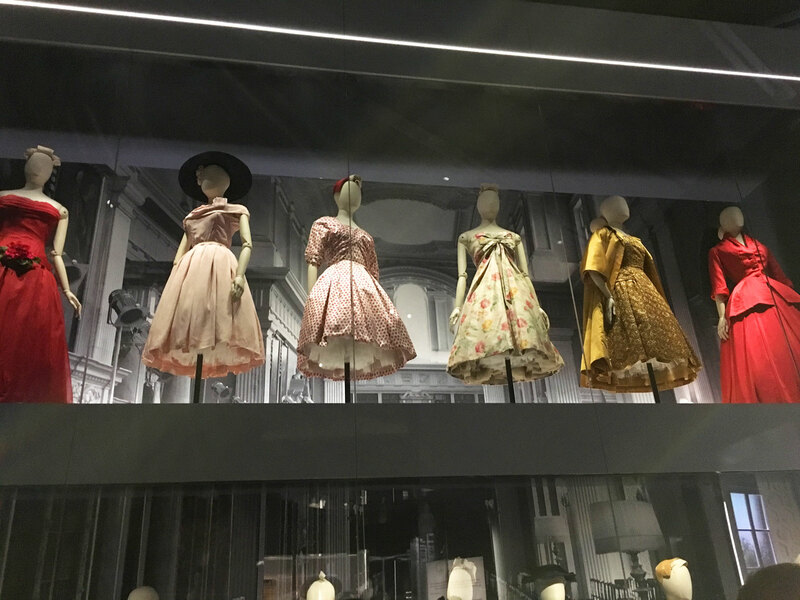 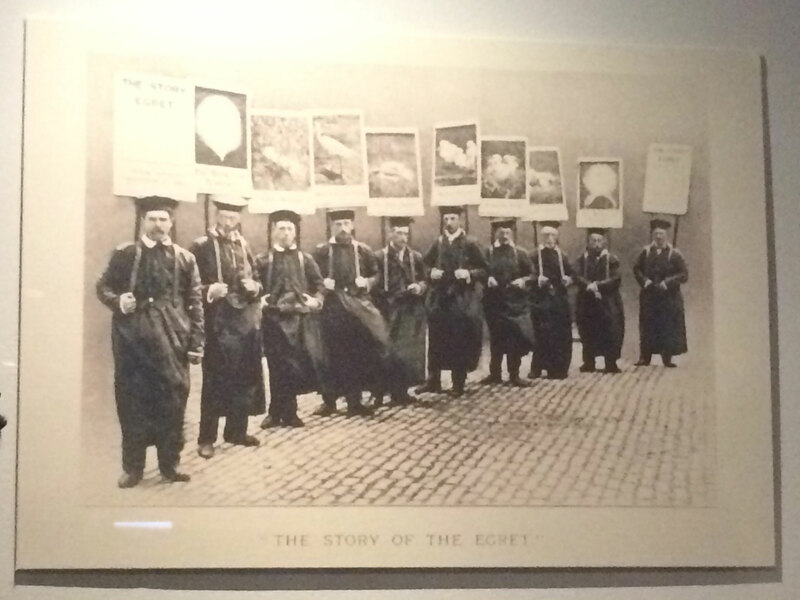 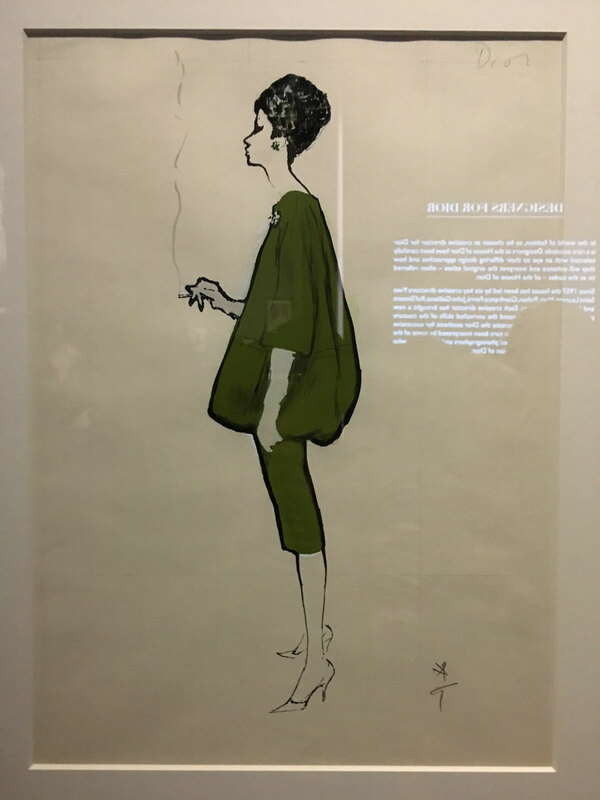 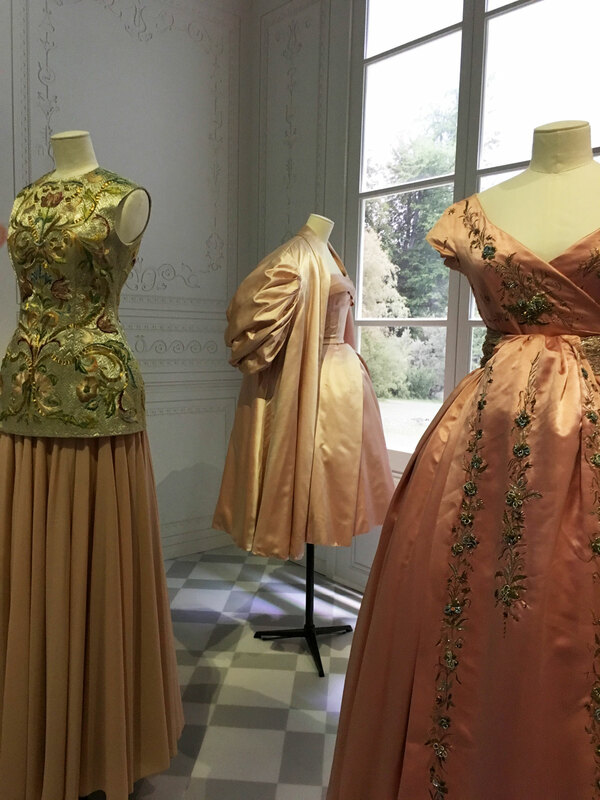 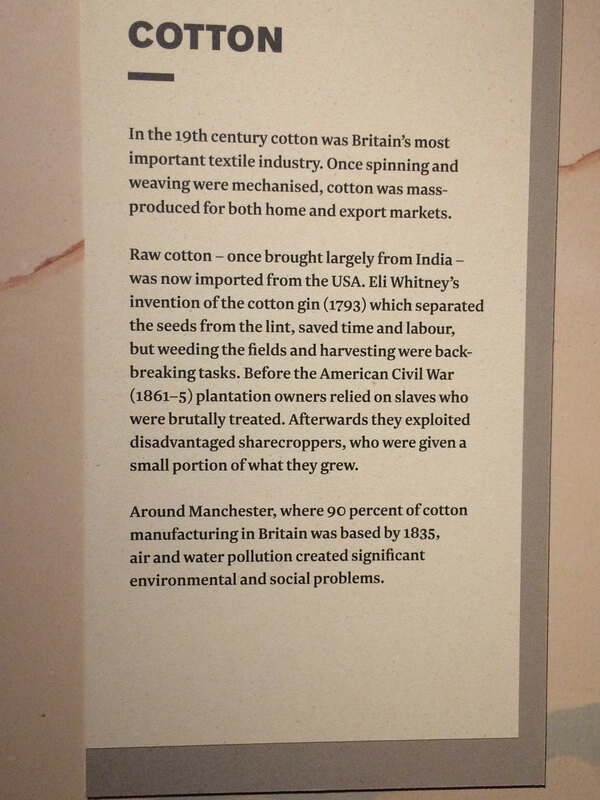 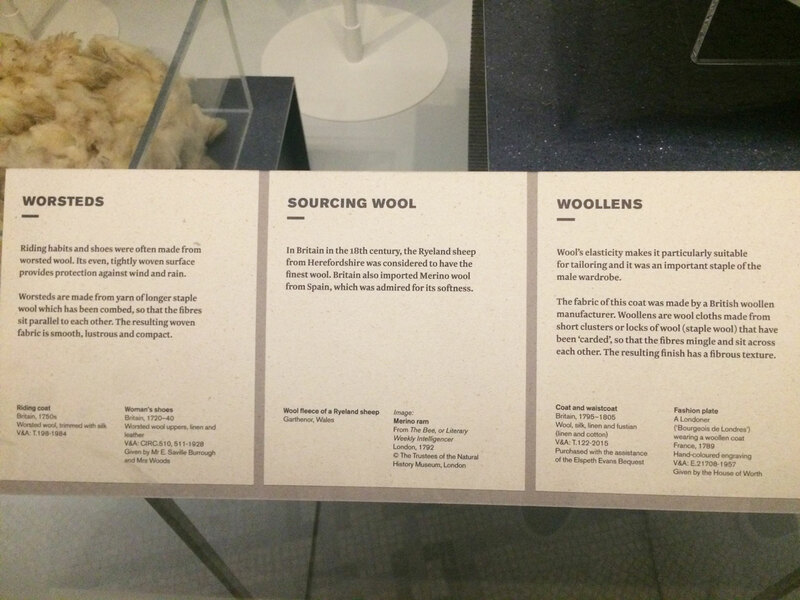 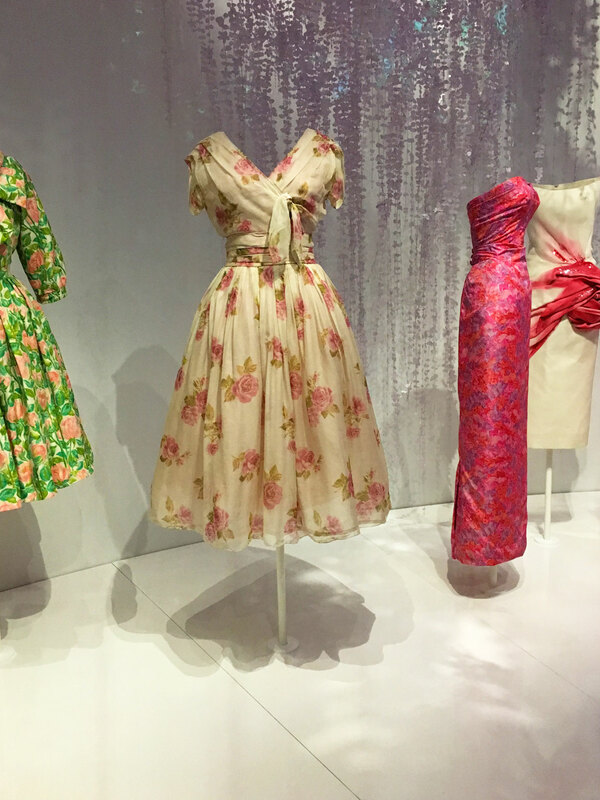 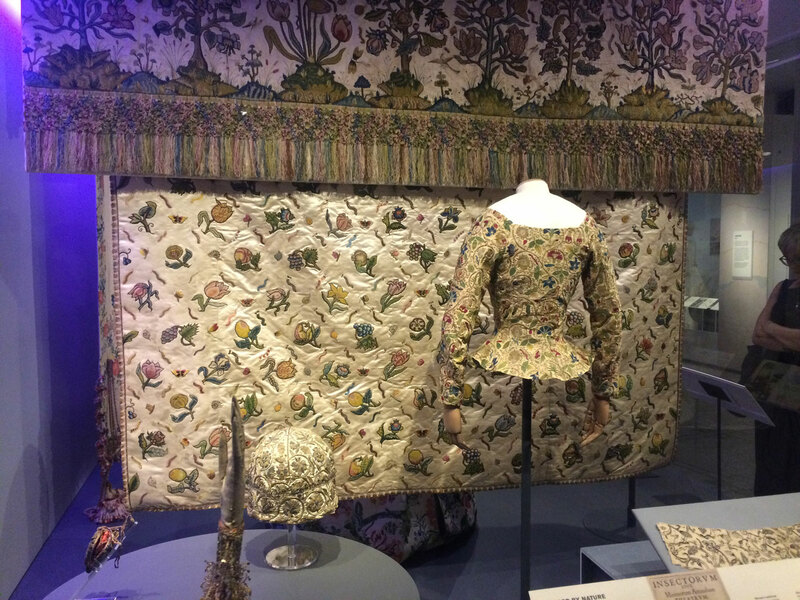 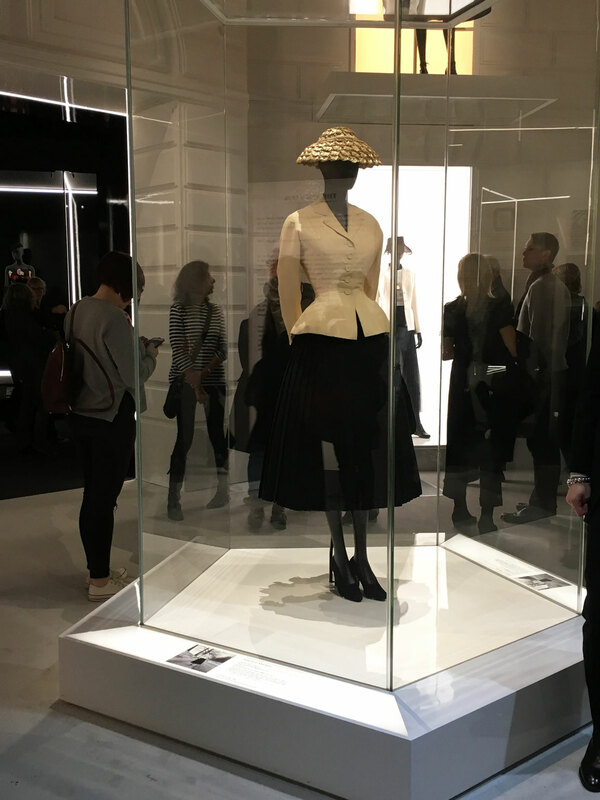 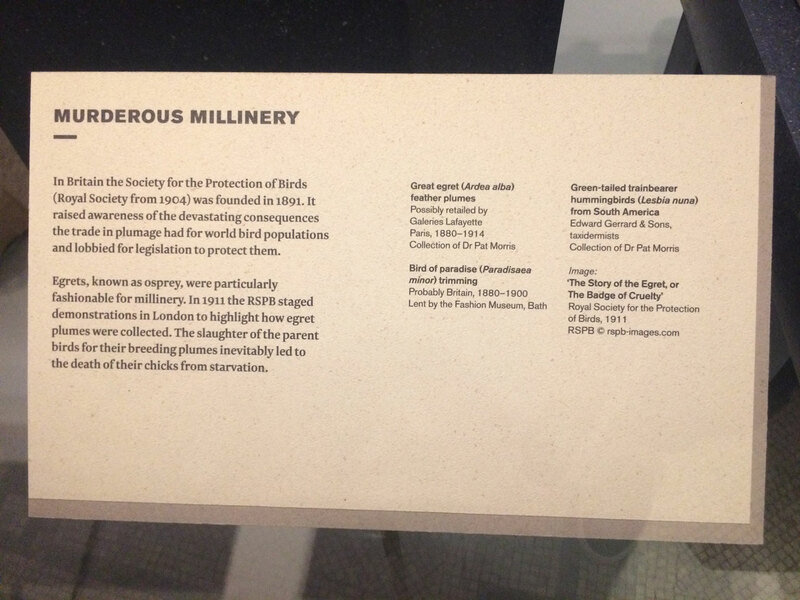 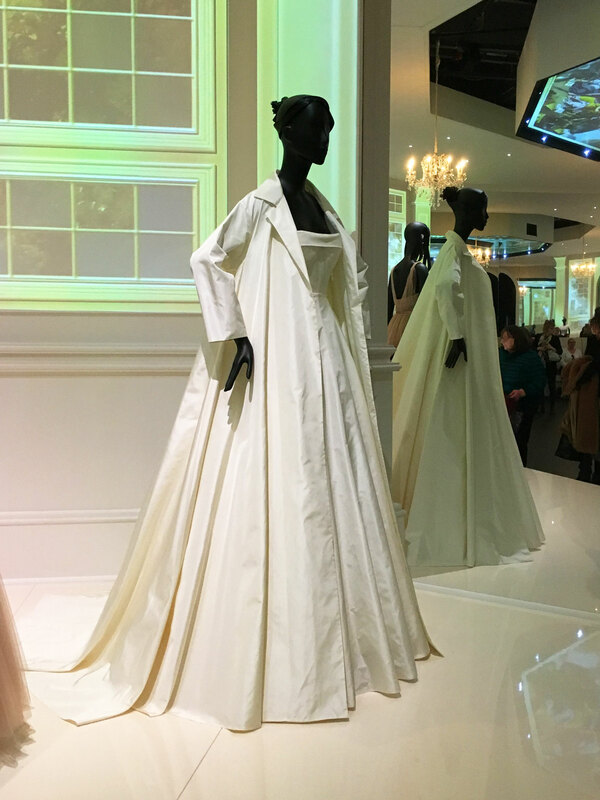 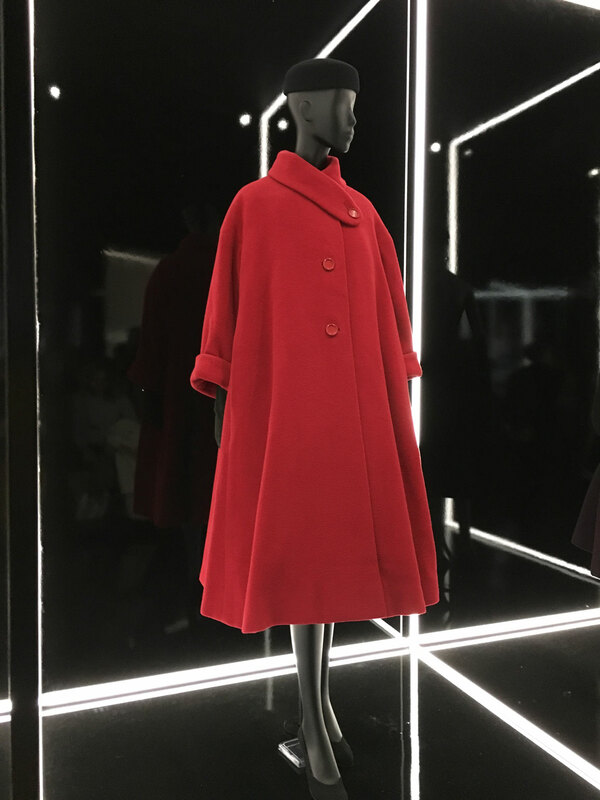 The first half of the exhibition was a little depressing if I’m honest – it was about how we have exploited the world throughout history to make clothes. 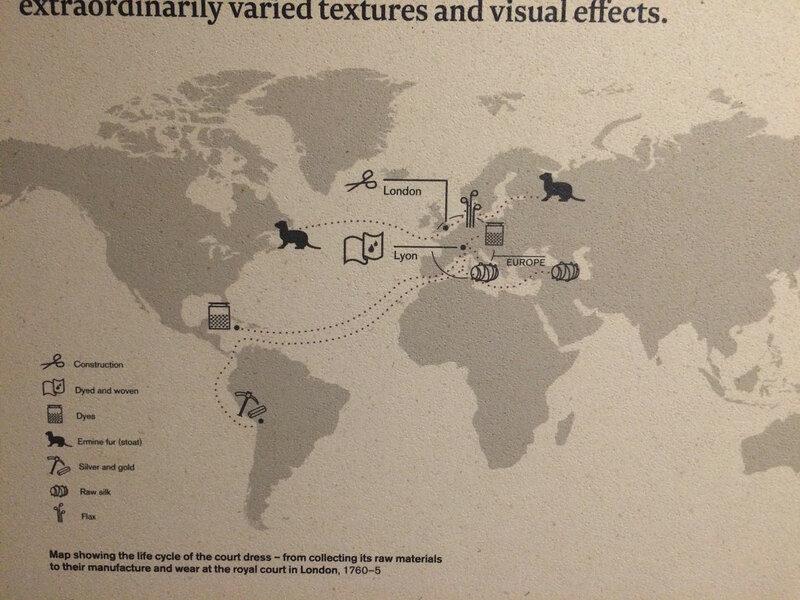 The first dress had a whole map and explanation about where all the different components came from. 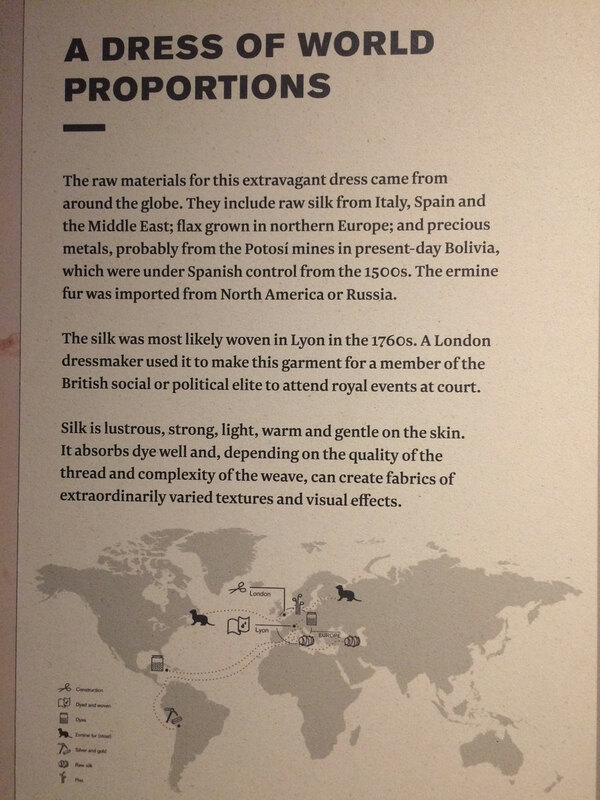 There was a section and garments relating to each thing used to make clothes which came from/comes from animals, like silk. 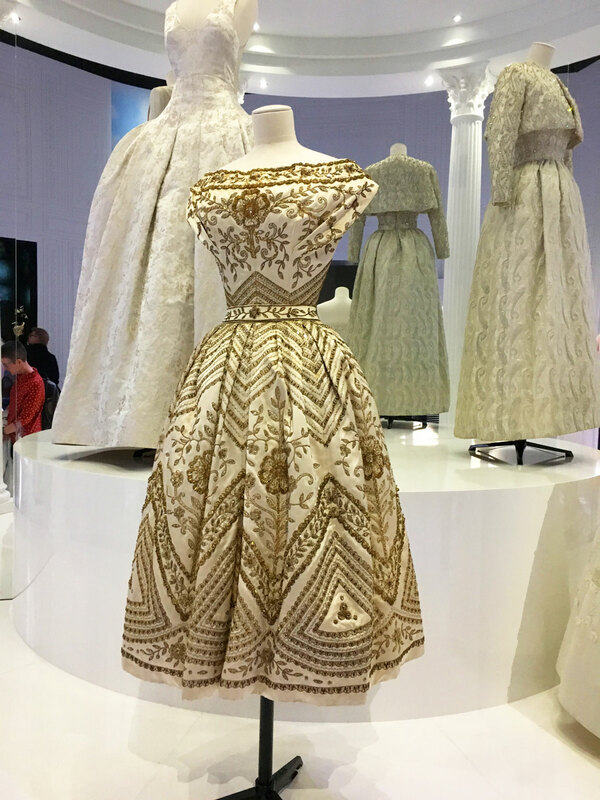 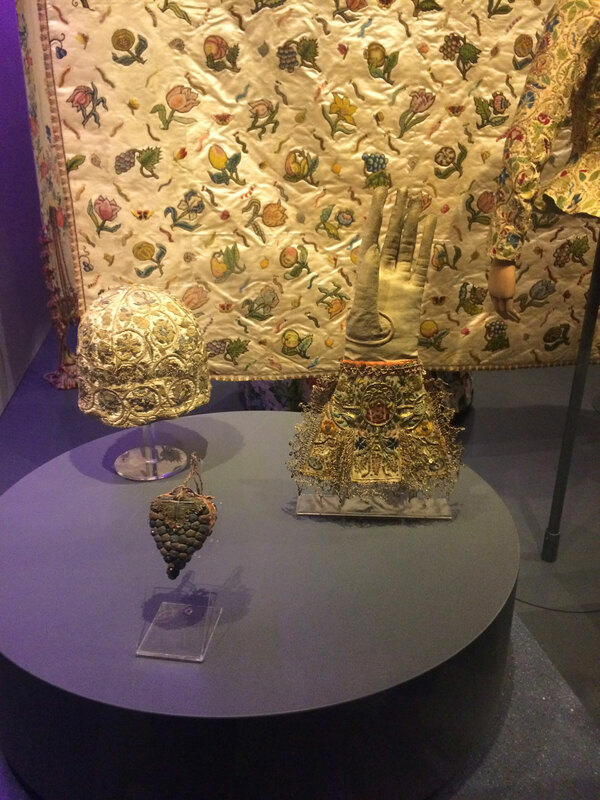 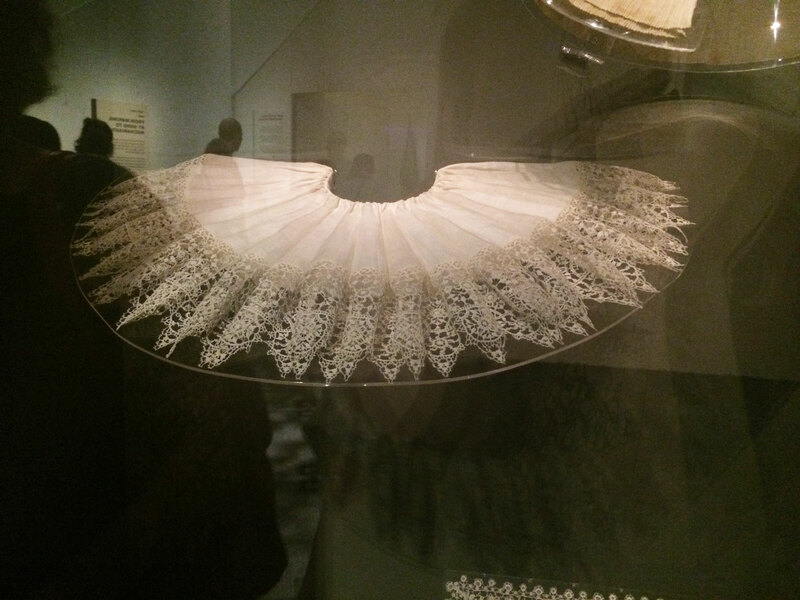 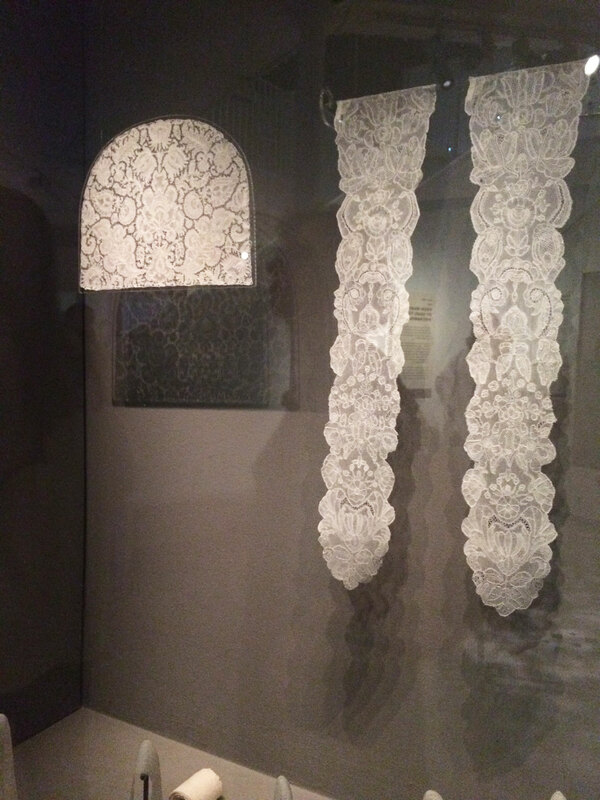 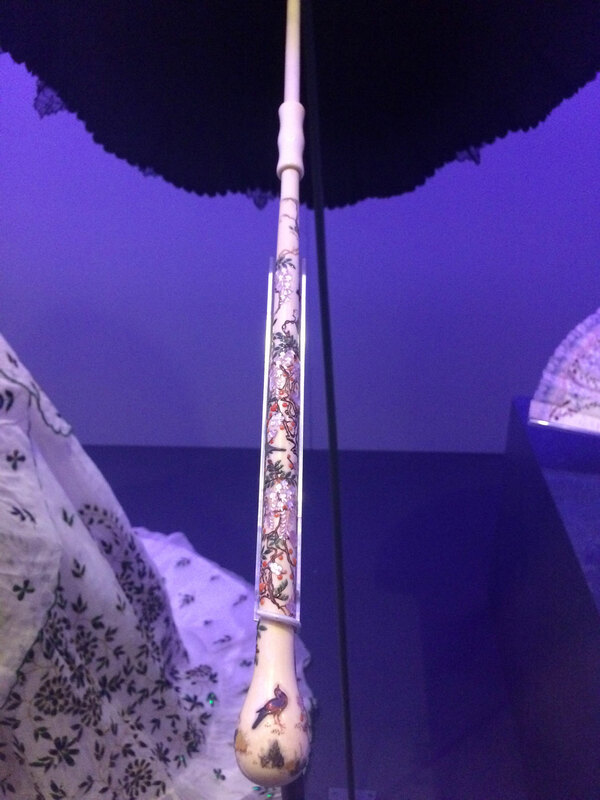 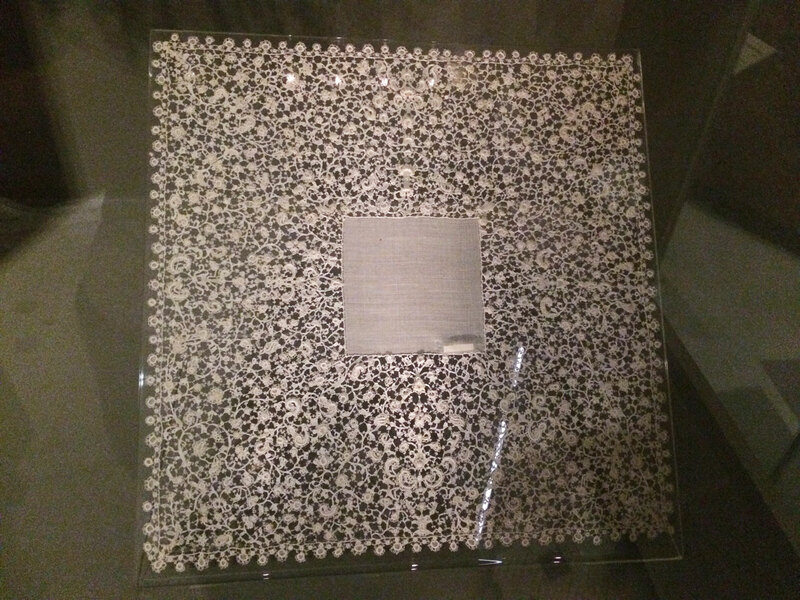 This lace was truly a wonder to behold, given that it was all made by hand – some of it by bobbins and some of it with needles! 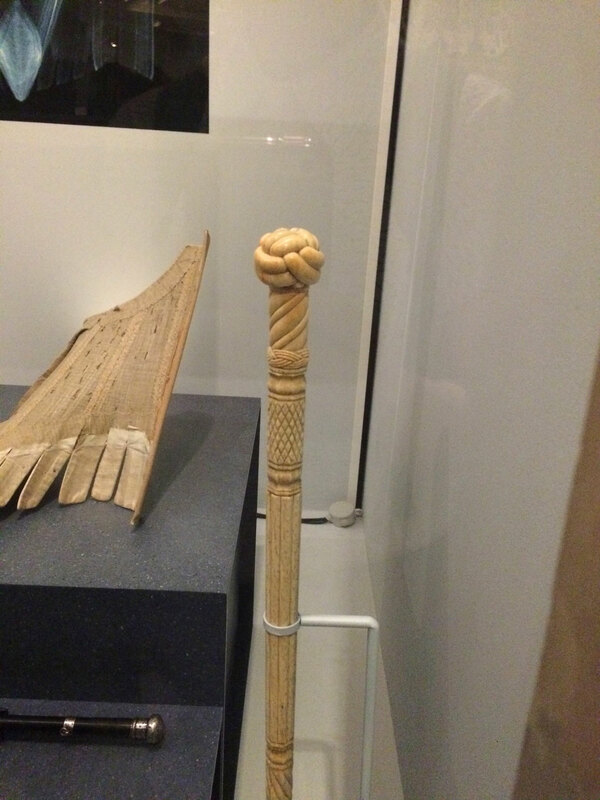 I’ve always kind of liked whales, I think since I did a project on them for a Brownie or Guide badge so it makes me sad that they were used in clothing and accessories, as much as I can admire the carving of this walking stick. 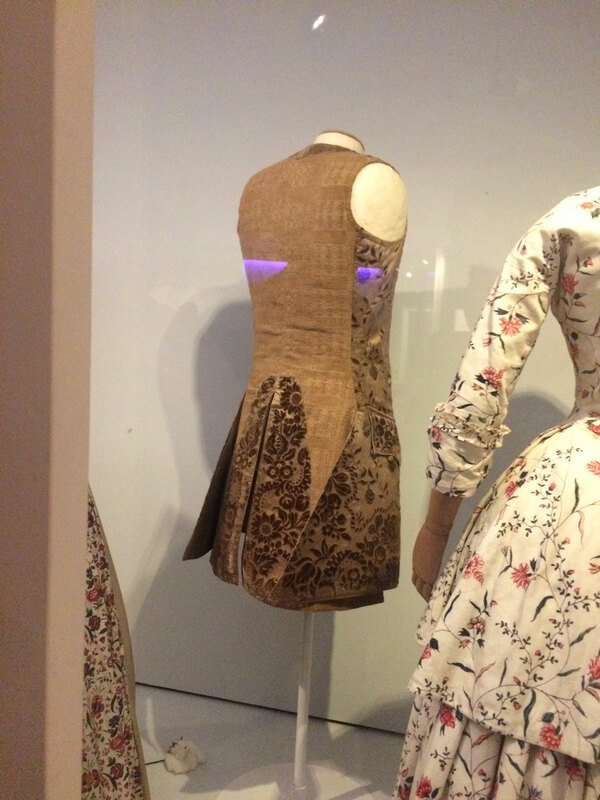 I love how the x-ray of this corset shows the whalebone inside. 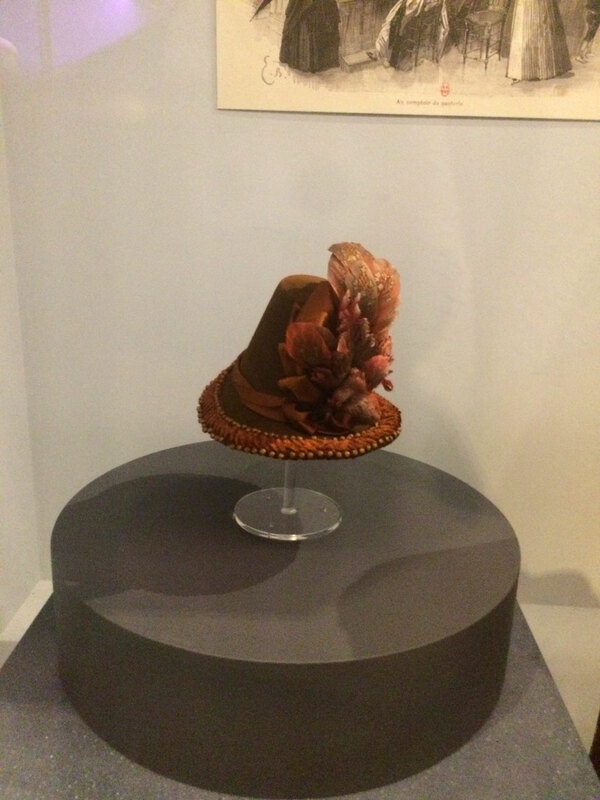 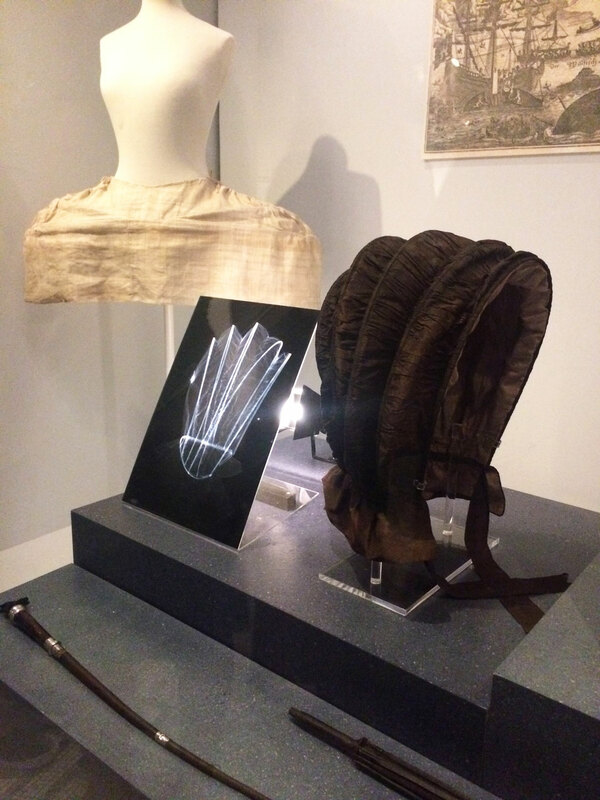 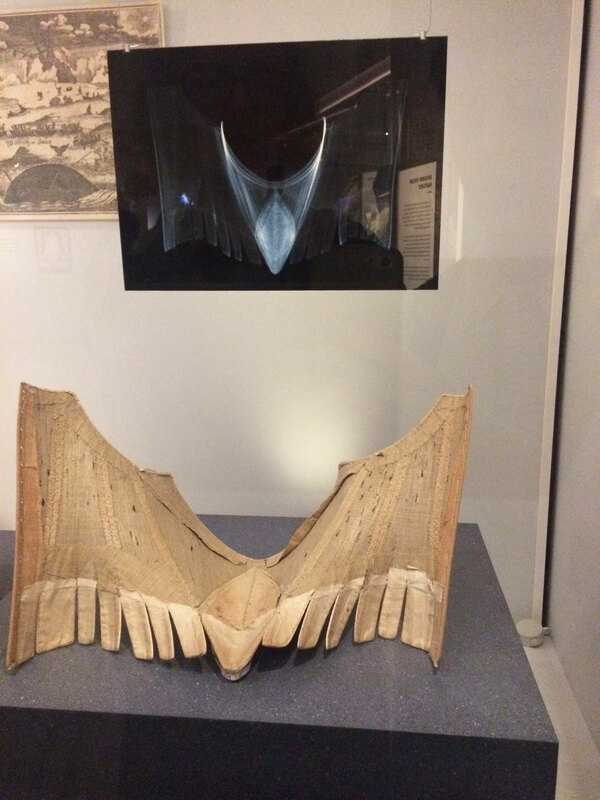 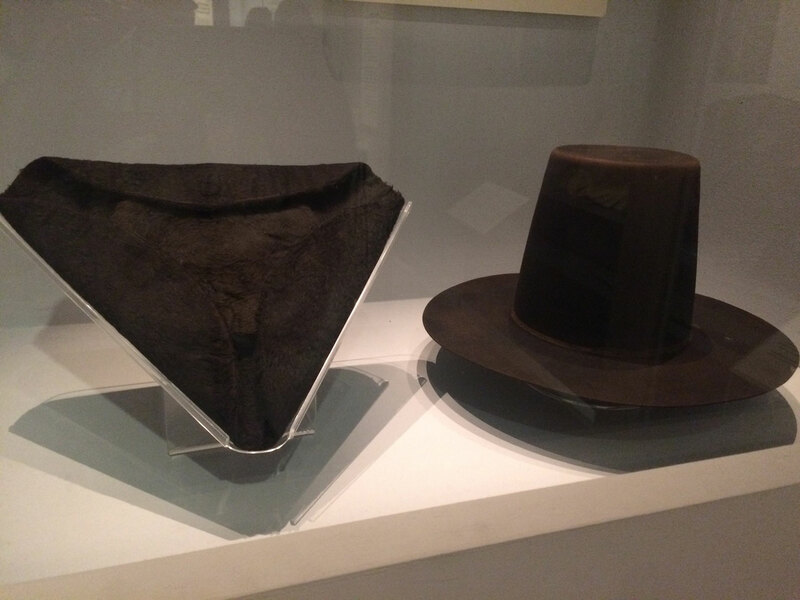 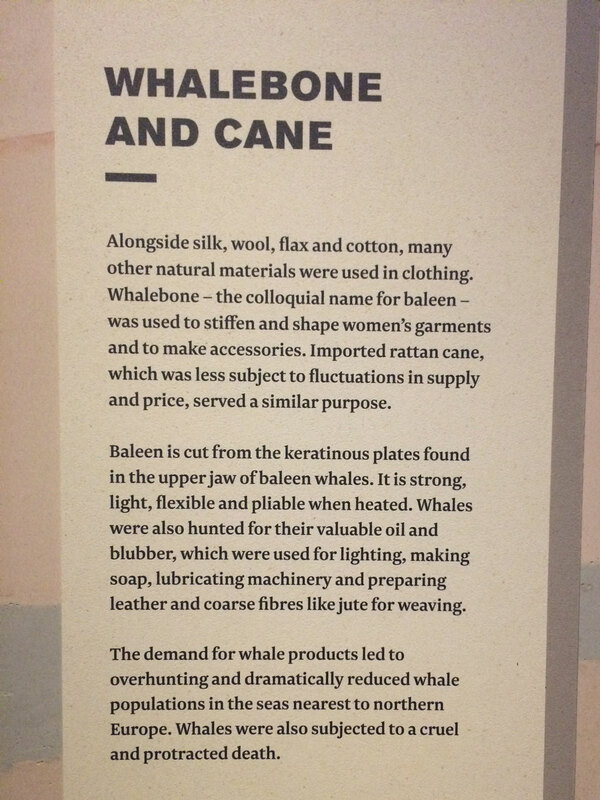 Even hats had whalebone in, to keep their shape. 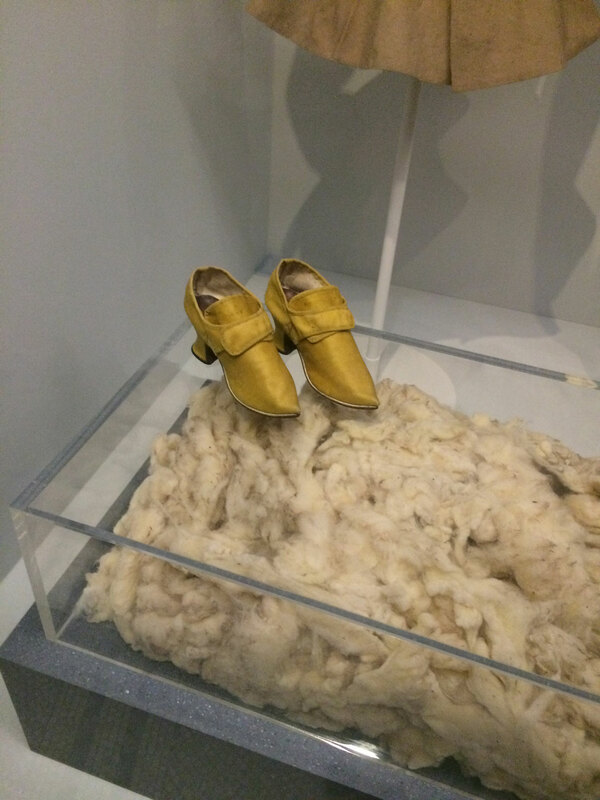 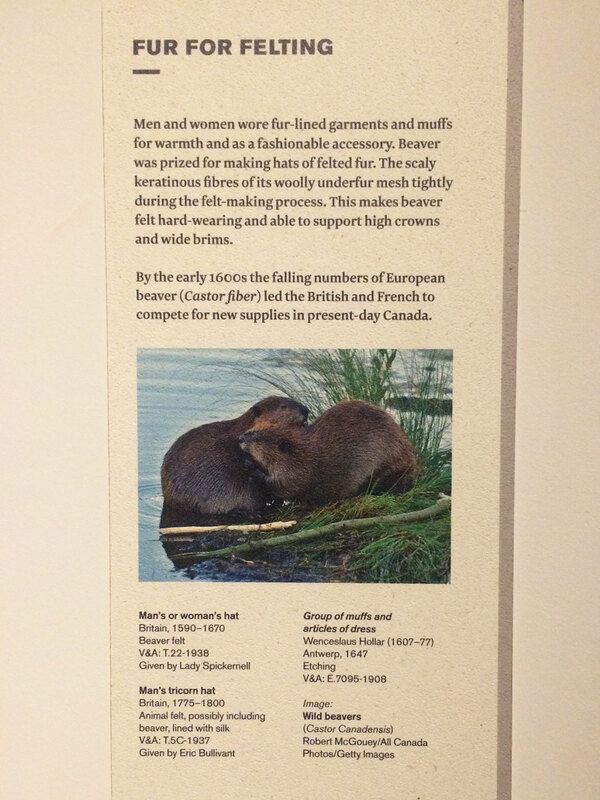 The things made of fur were also a bit sad. 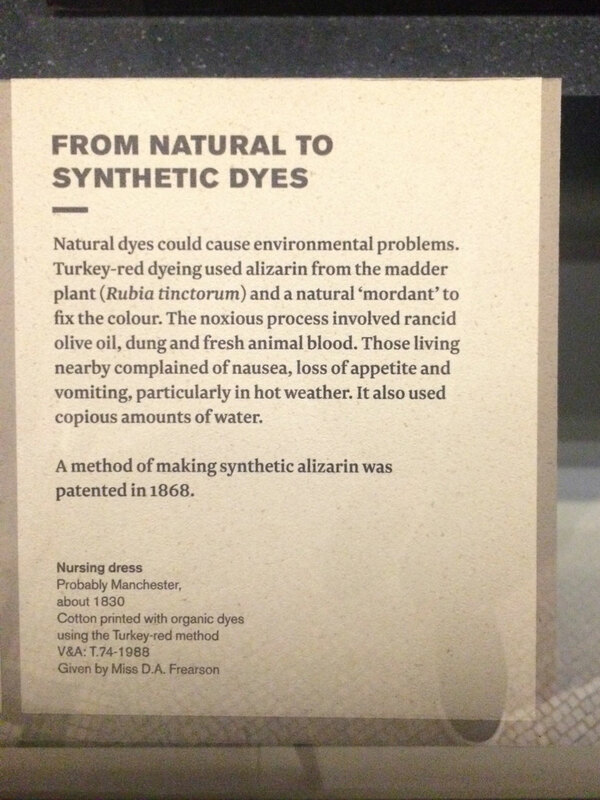 It’s a tricky thing because it makes sense that in the past people didn’t have synthetic alternatives (which come with other problems) to enable them to keep warm, but of course suddenly killing lots of the same animal means there will eventually be a lot fewer of them. 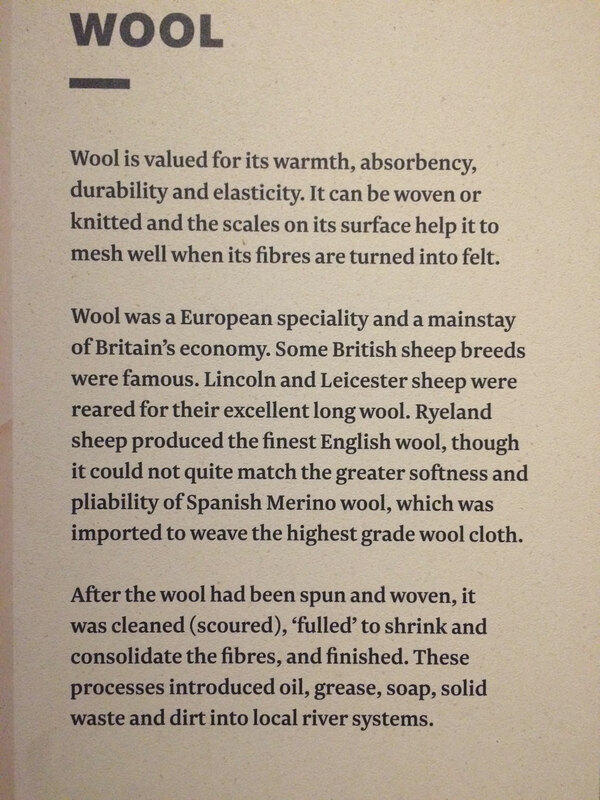 Wool seems like one of the less evil things we’ve made clothes from – at least the sheep is still alive once it’s been sheared. 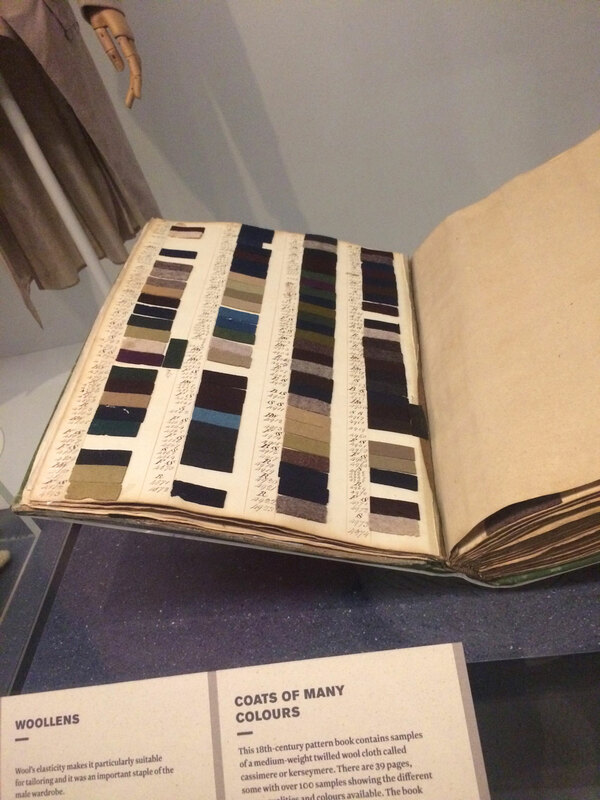 It’s amazing that these colours have lasted as long as they have, given that the book is over 200 years old! 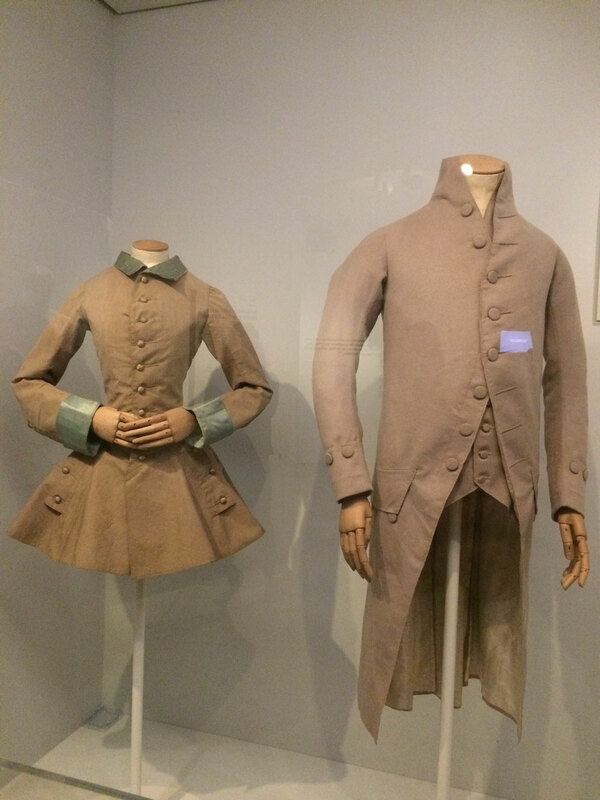 I couldn’t believe how tiny the coat on the left was! 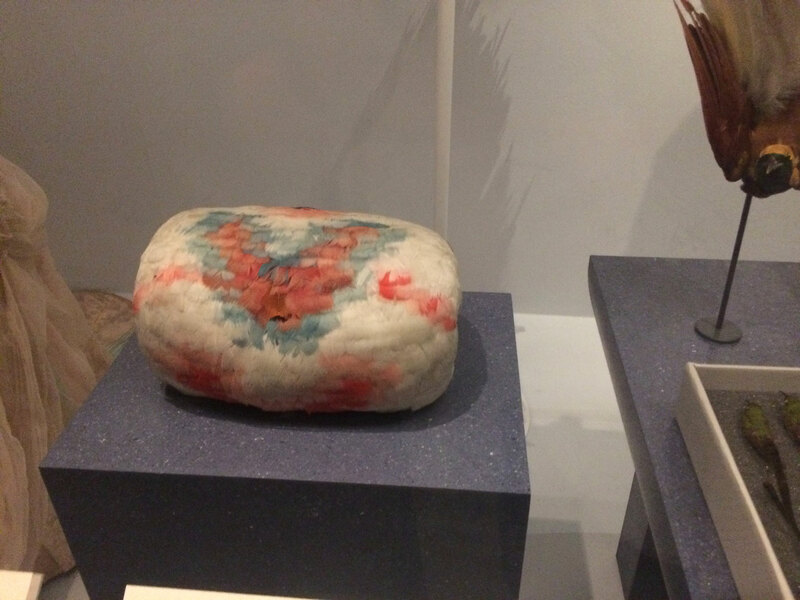 I can only assume it was for a teenage girl. 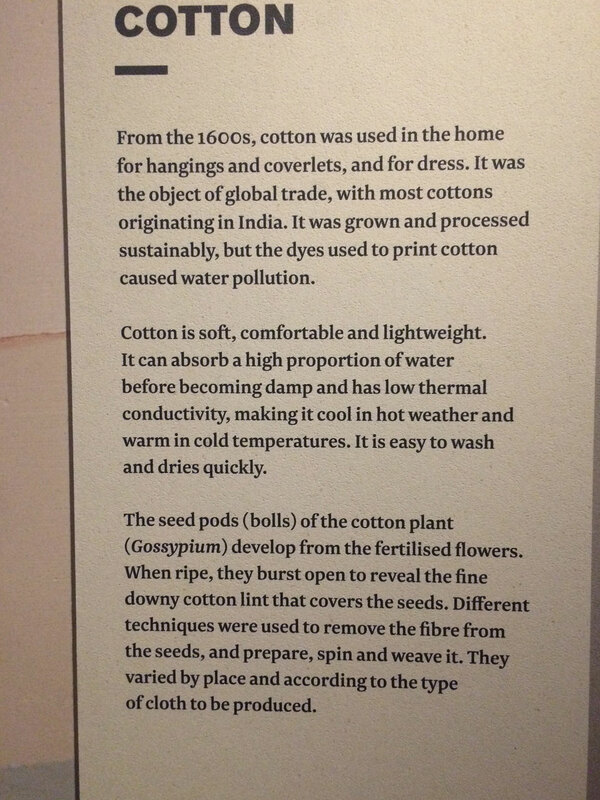 Cotton obviously has been responsible for a lot of evils in the past, but it must be one of the most used fibres ever for clothes. 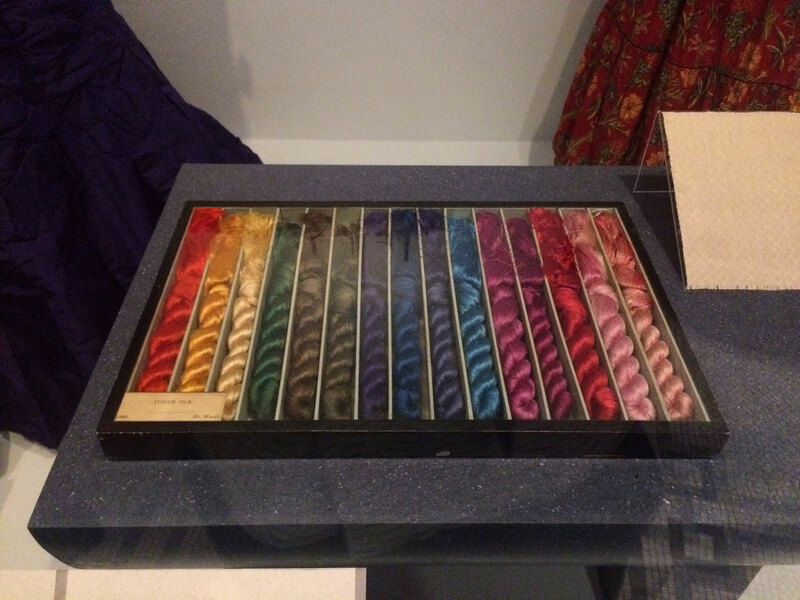 Cotton opened up a whole load of possibilities of colours, and designs. 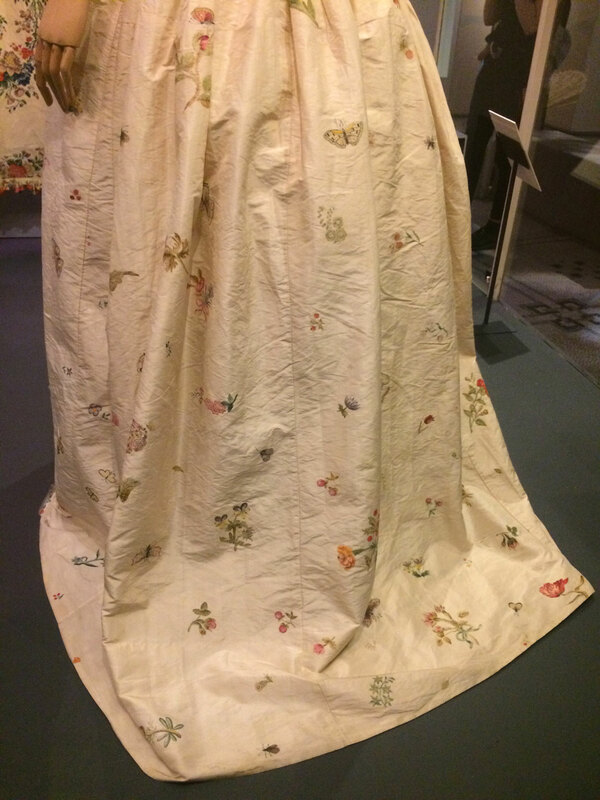 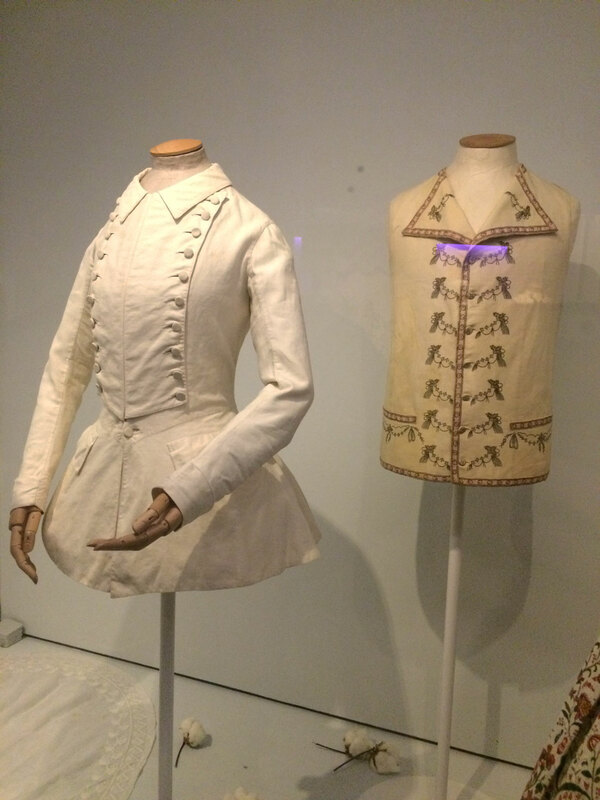 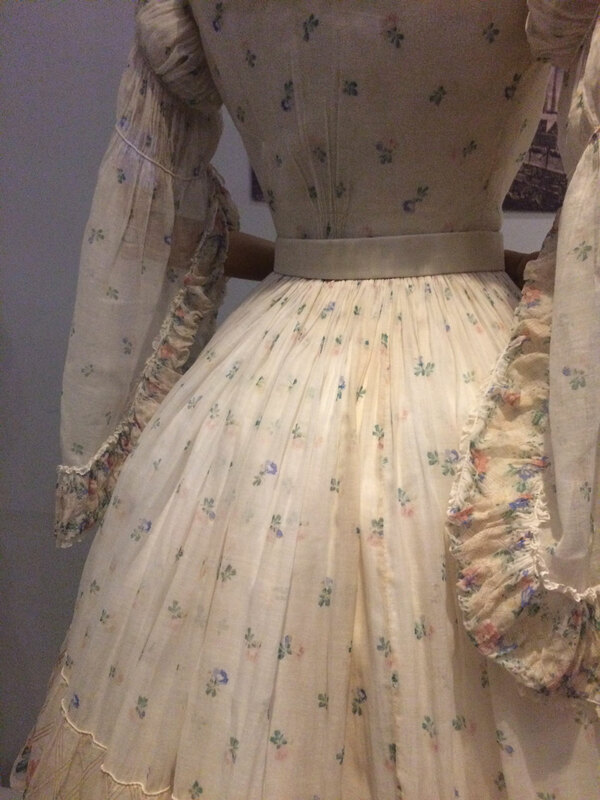 I love how even in the 1780s people refashioned clothes to make them last longer or make them more up to date with the changing fashions. 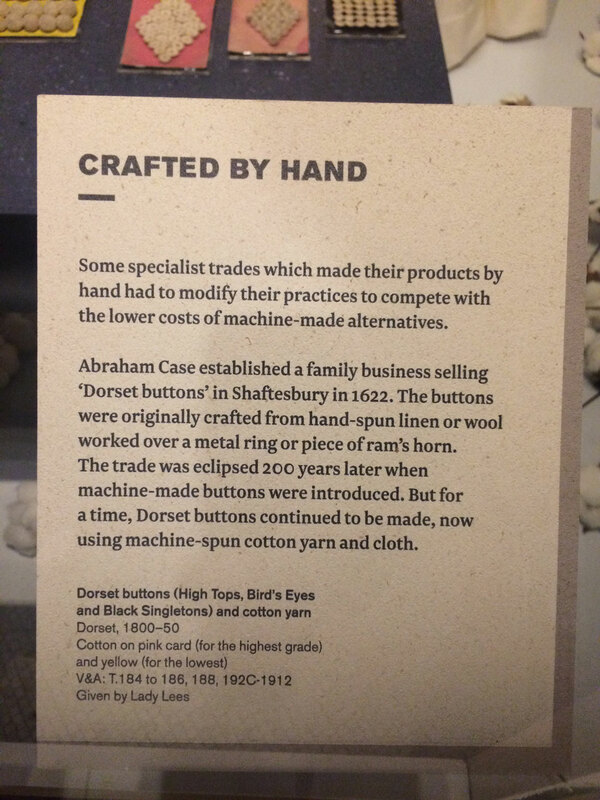 These hand made buttons were teeny tiny – I don’t even know how someone would make them! 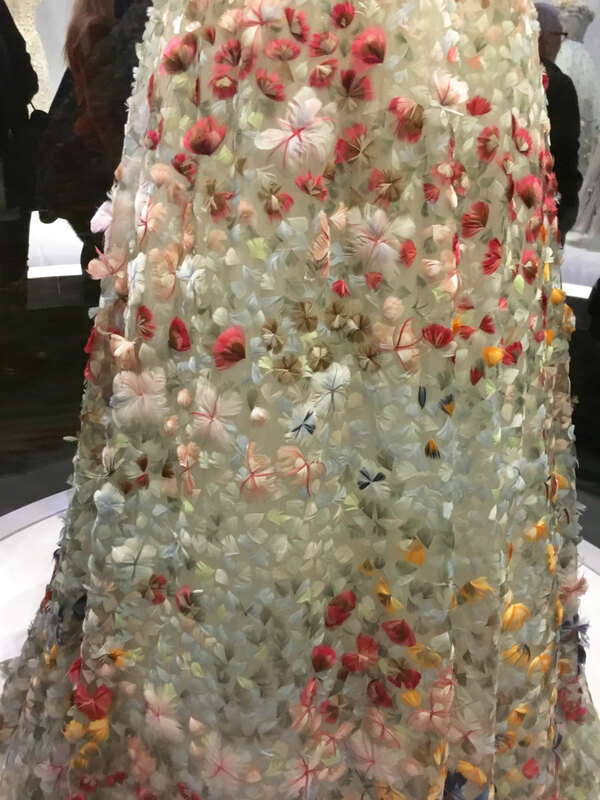 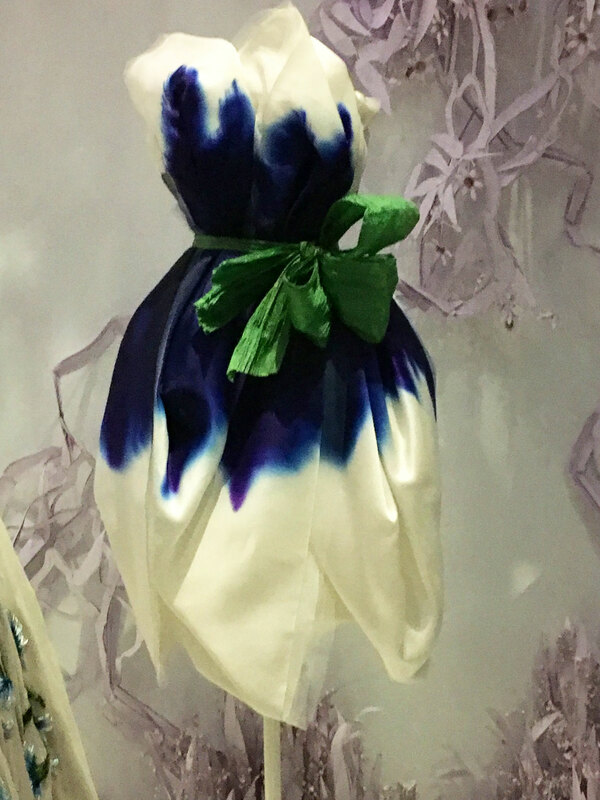 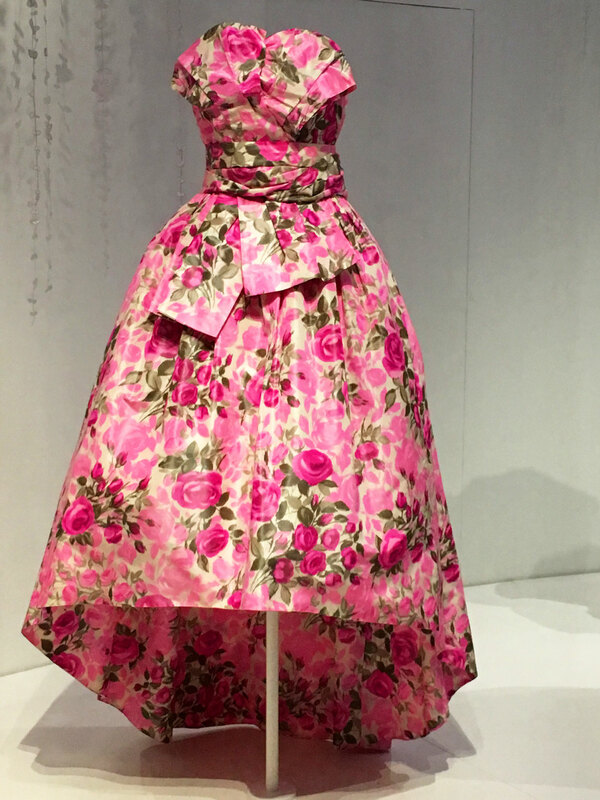 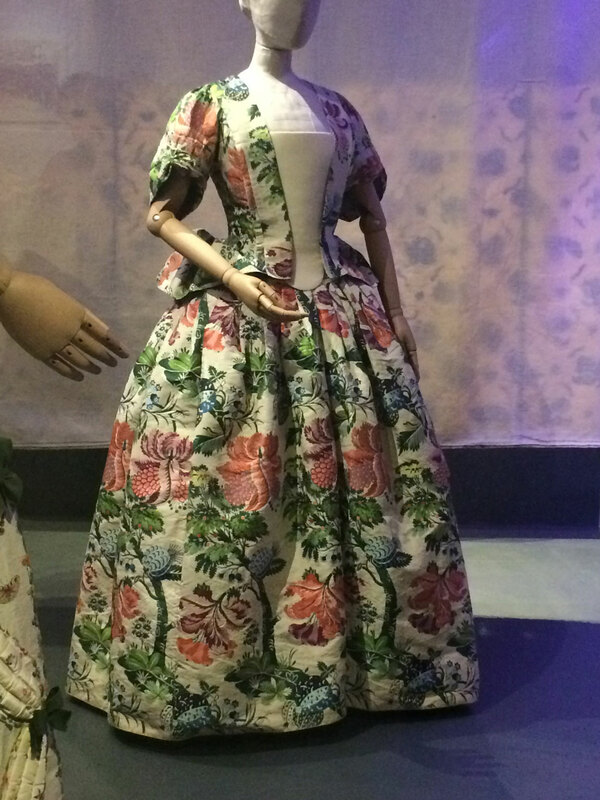 I love the combination of patterns on this dress – there are 2 different designs of flowers on the different parts of the dress. 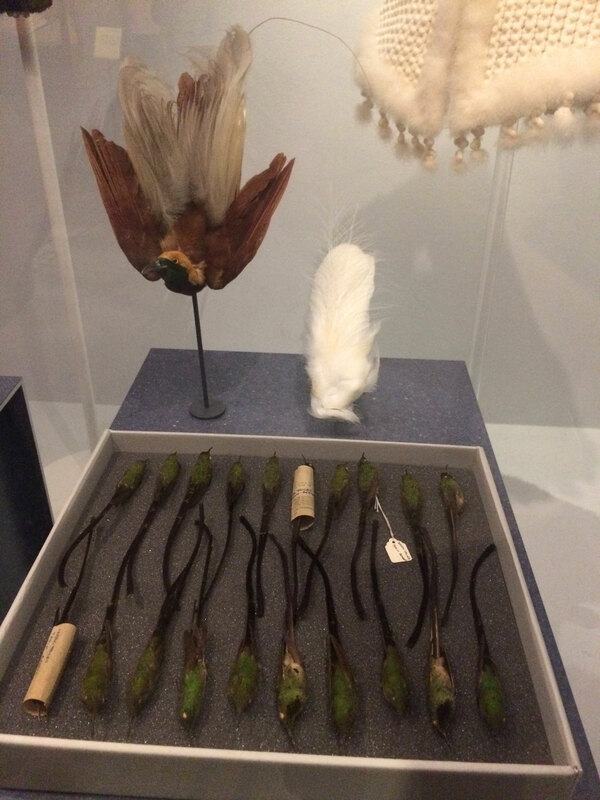 I think I found the feathers possibly the most upsetting because there were multiple things with whole dead birds on, which is just creepy – I don’t know how it was ever fashionable to wear a whole dead bird as earrings or on a hat. 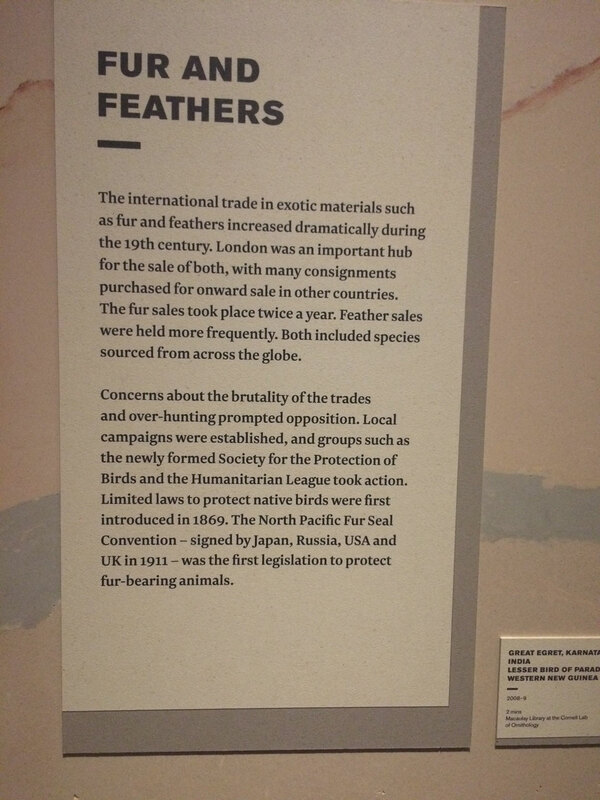 I love this photo of a group of men protesting against the killing of so many egrets for fashion. 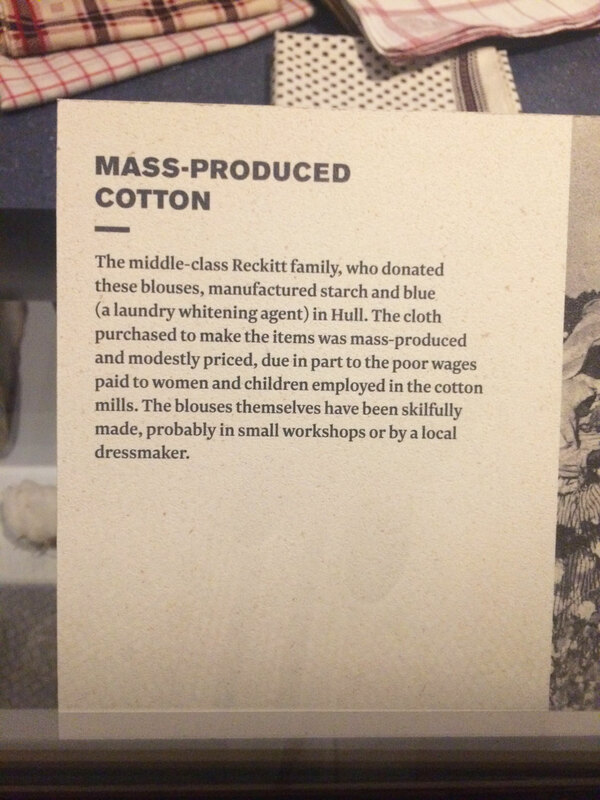 Not to stereotype, but they don’t look like a group of radical protesters! 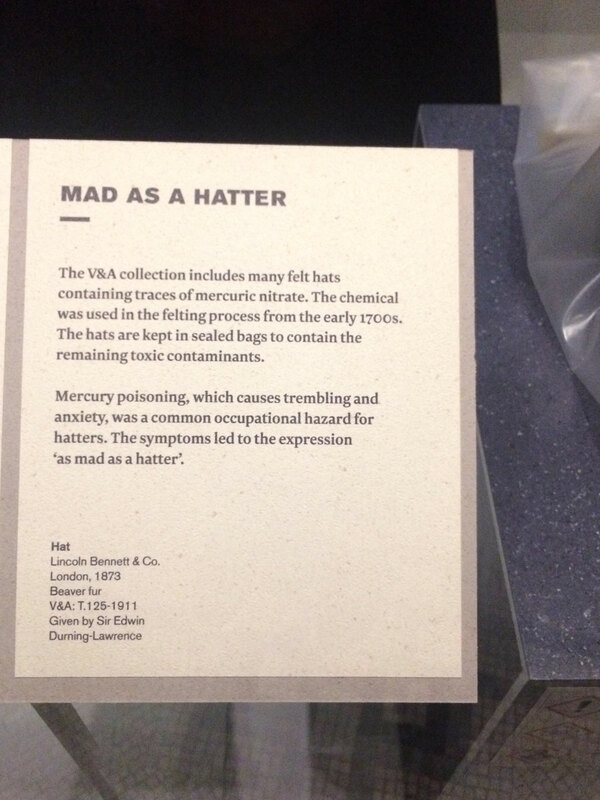 Also I found out that ‘mad as a hatter’ as a phrase came from the fact that milliners used mercury and actually went a bit mad. 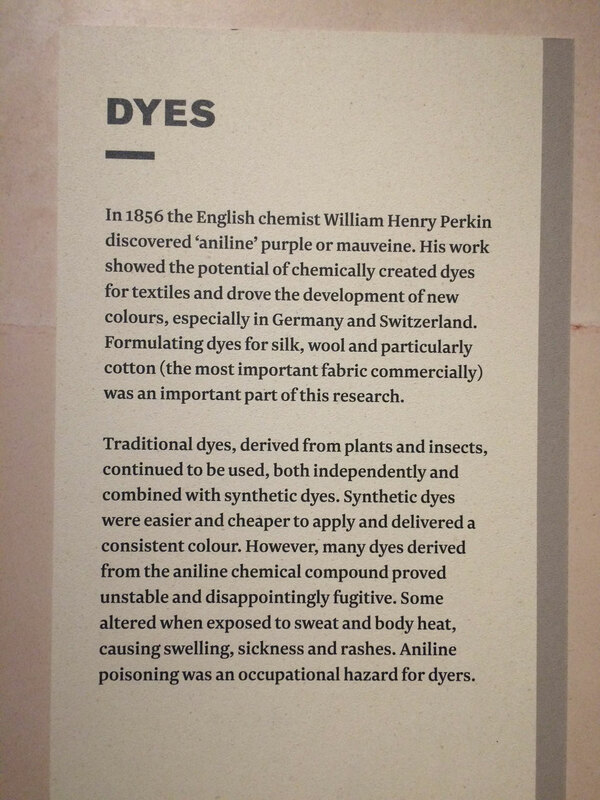 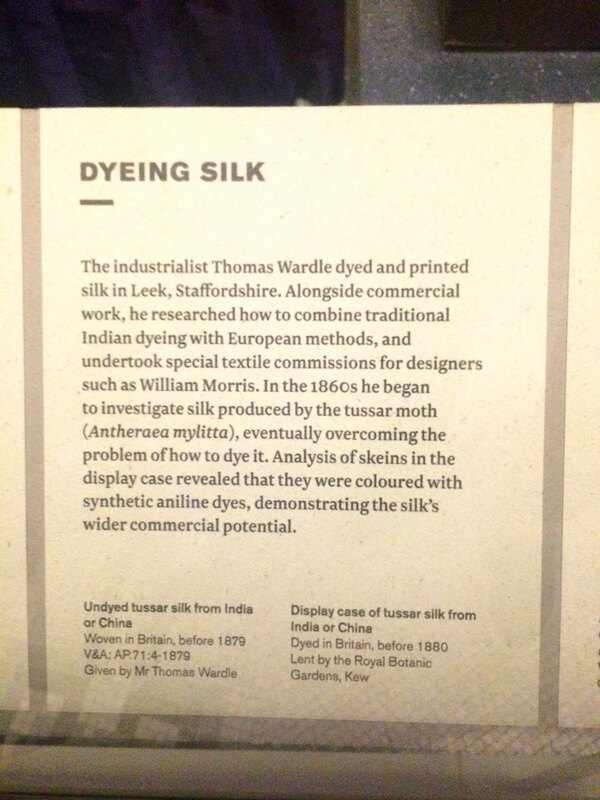 With the advent of synthetic dyes, a whole new world of possibilities opened up in terms of colours, but then, as now, the impact on the people and the environment was less than perfect. 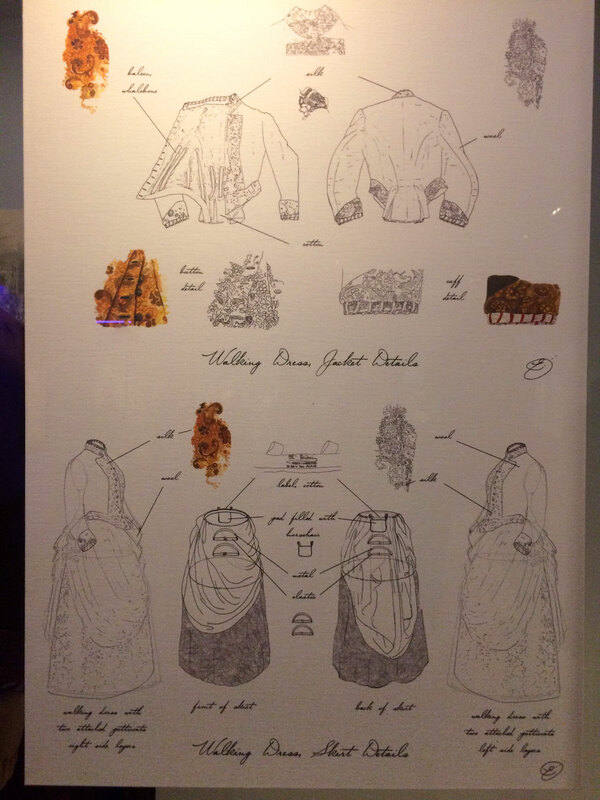 I loved this diagram of how the below dress was assembled. 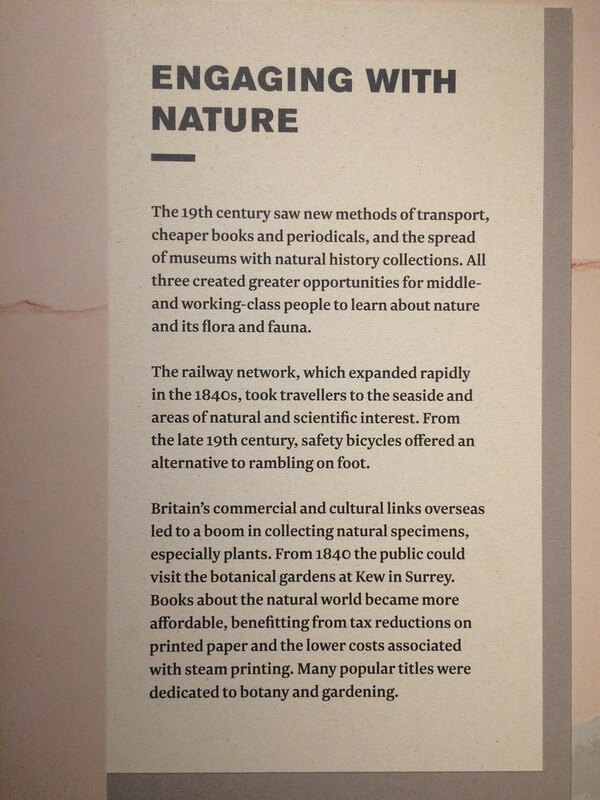 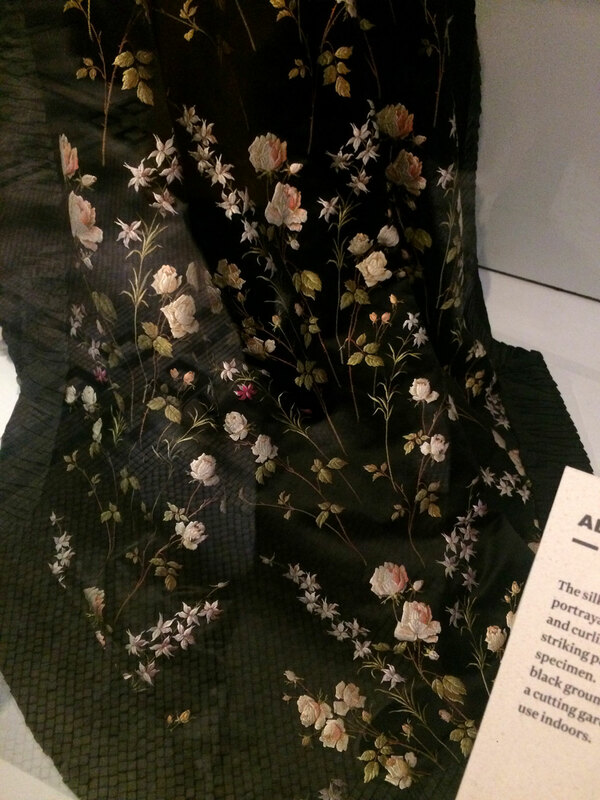 A slightly nicer part of the exhibition was the part about how the Victorians got all into nature and so painted/embroidered images of the natural world on their clothes. 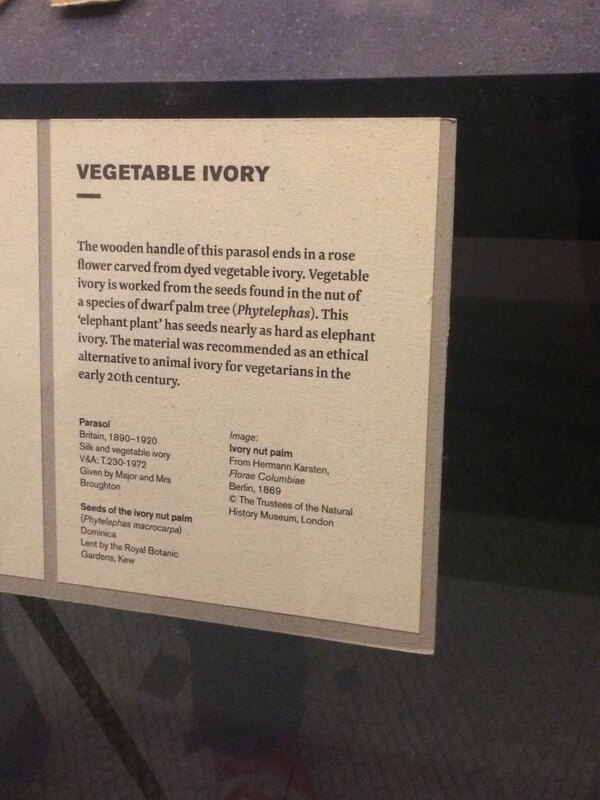 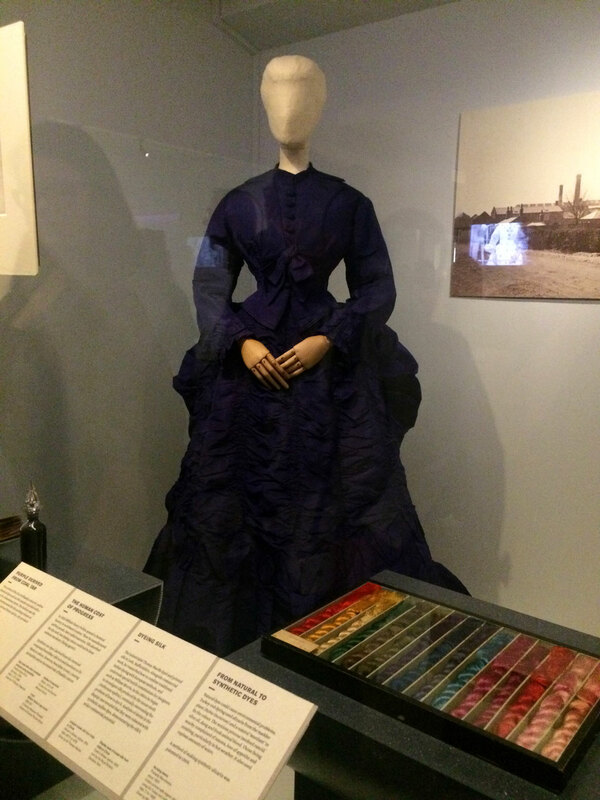 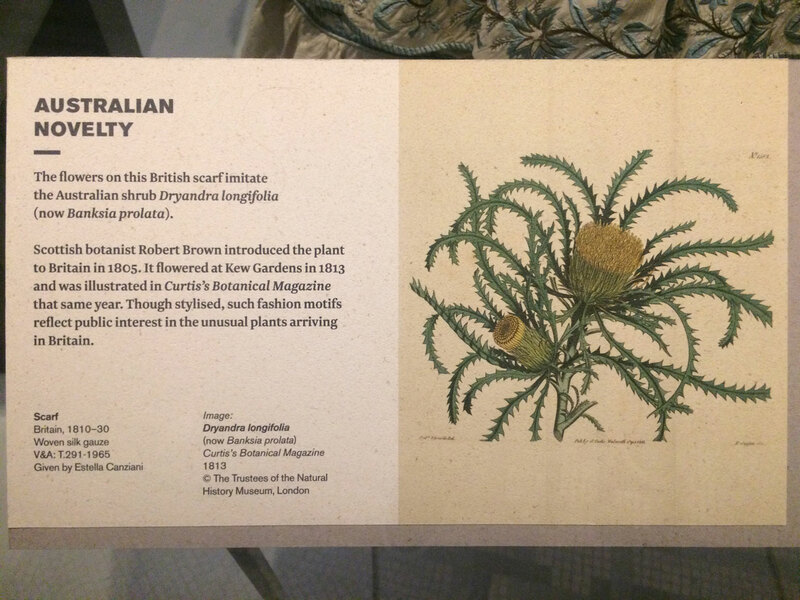 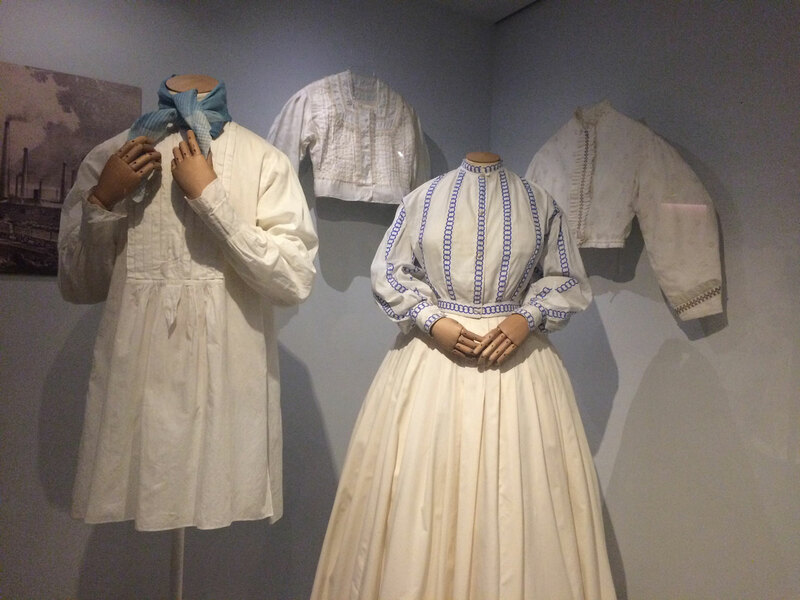 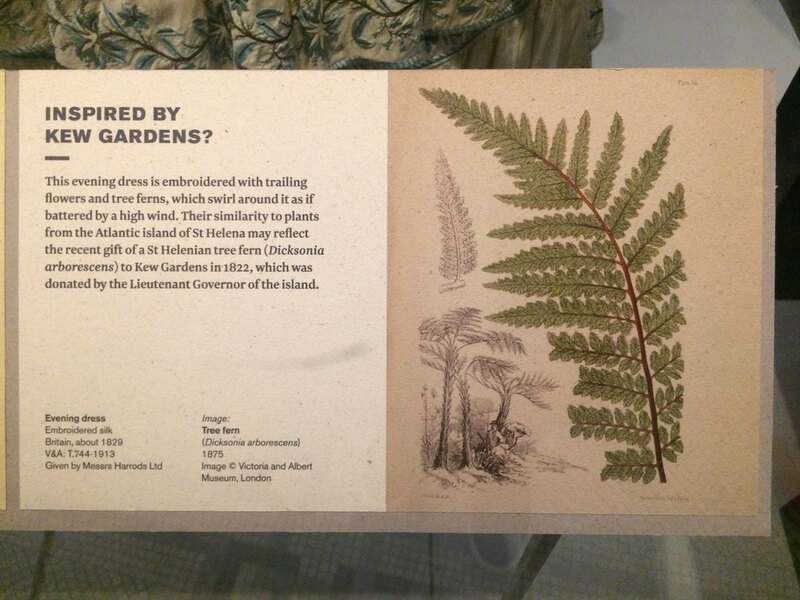 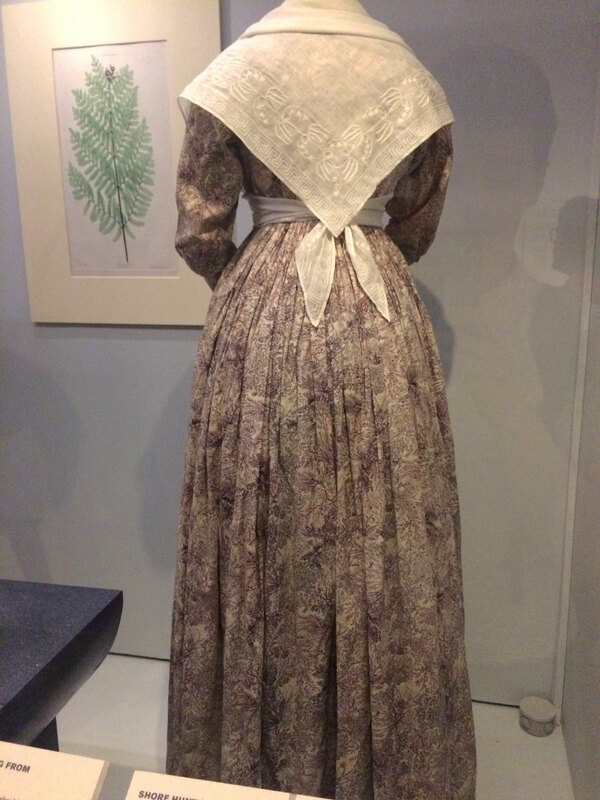 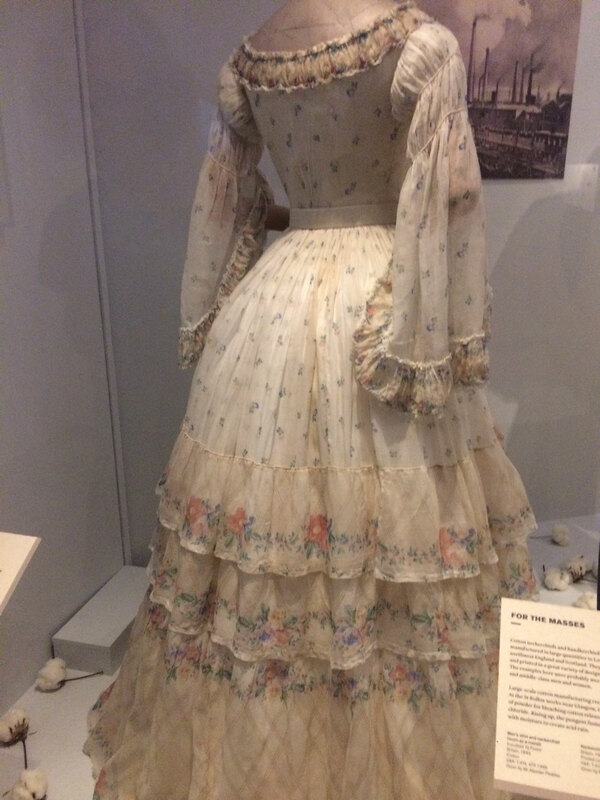 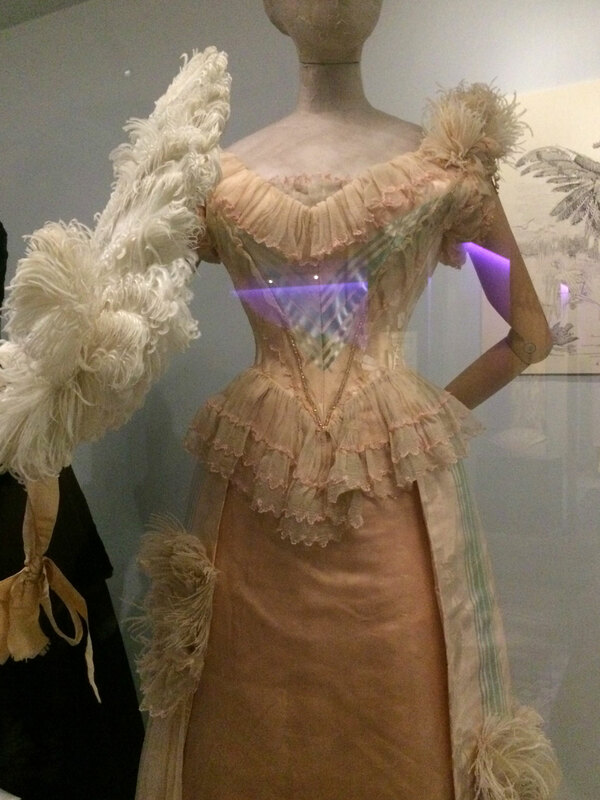 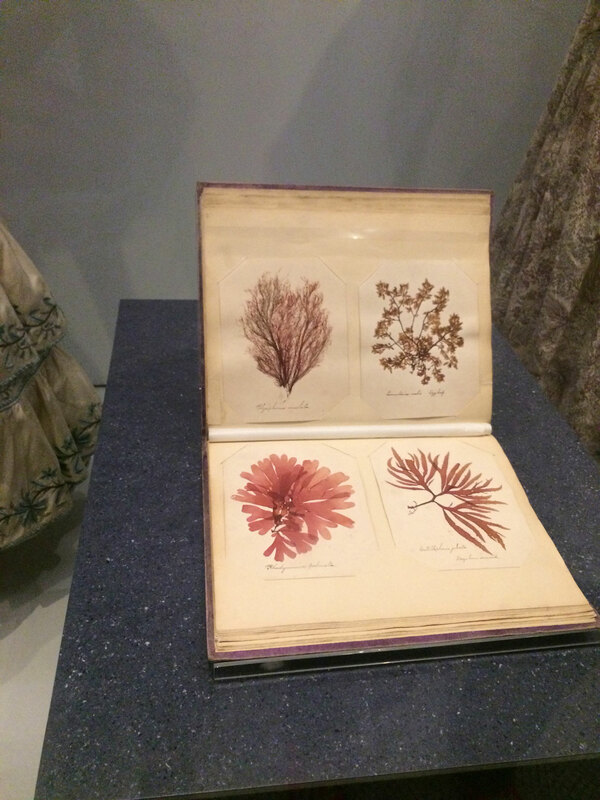 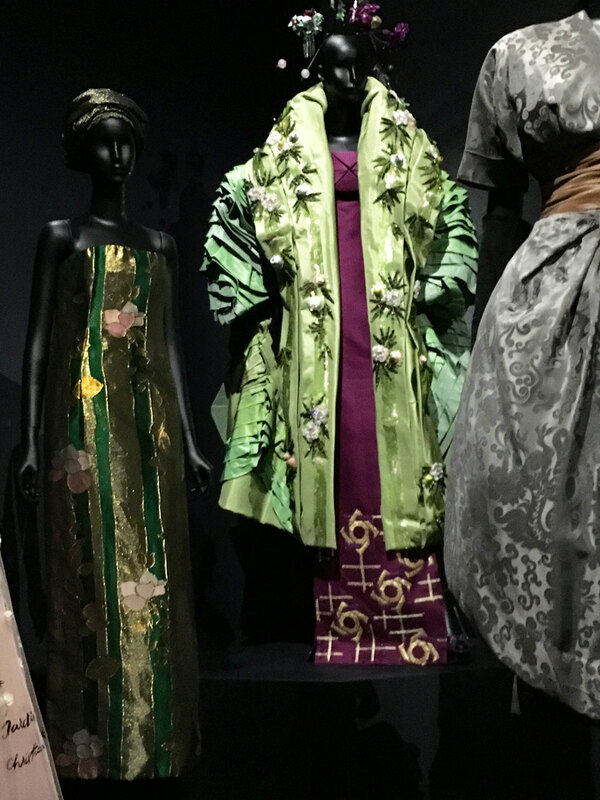 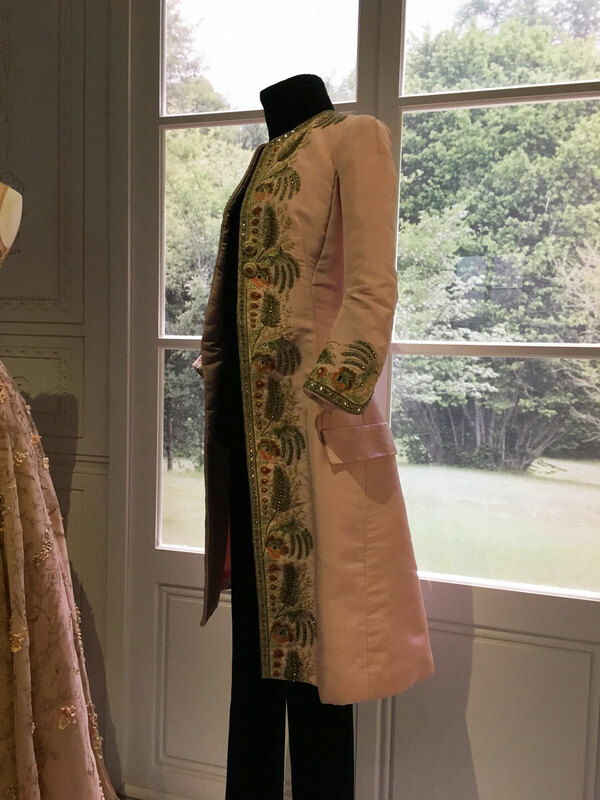 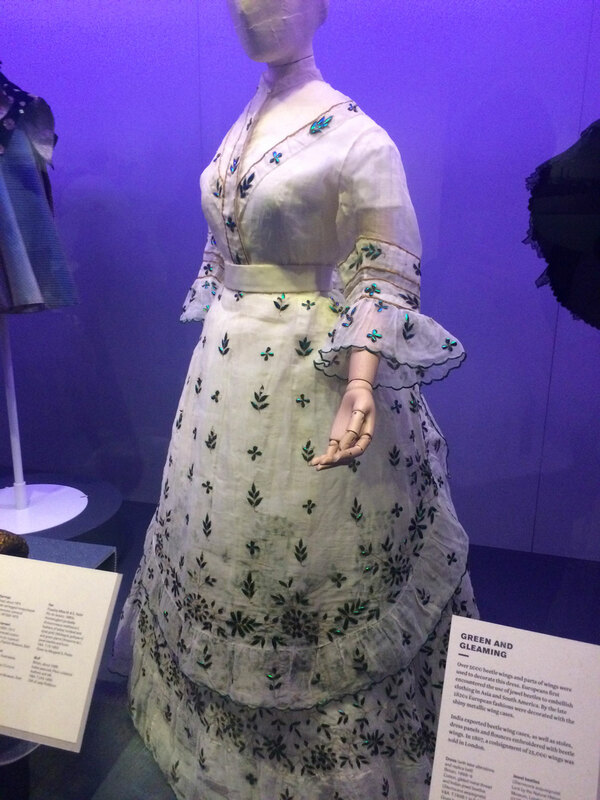 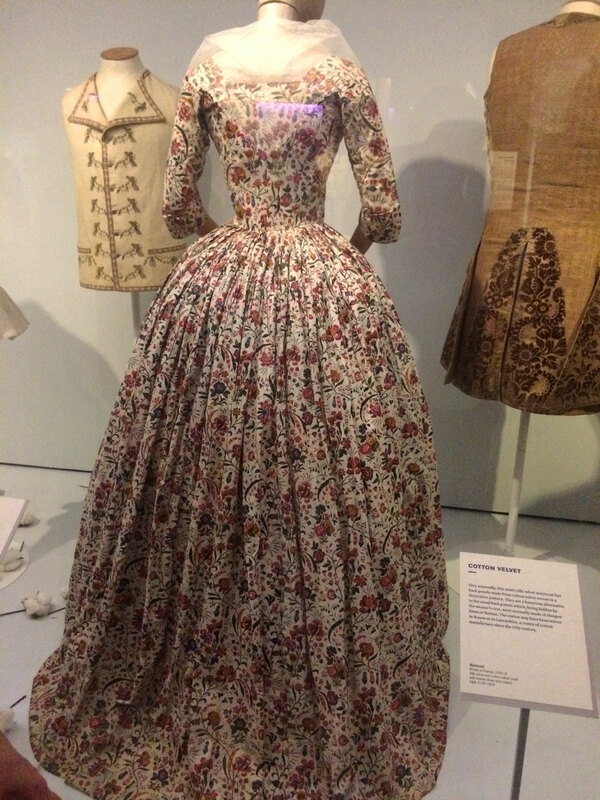 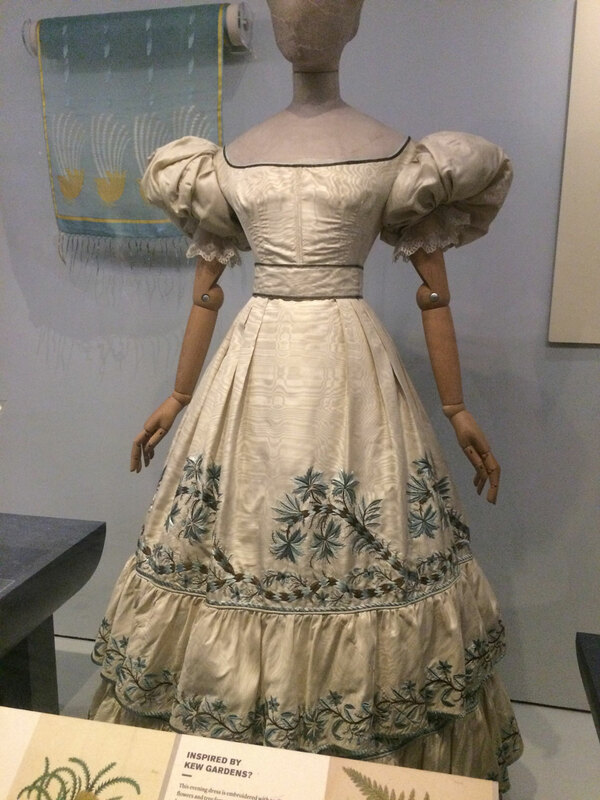 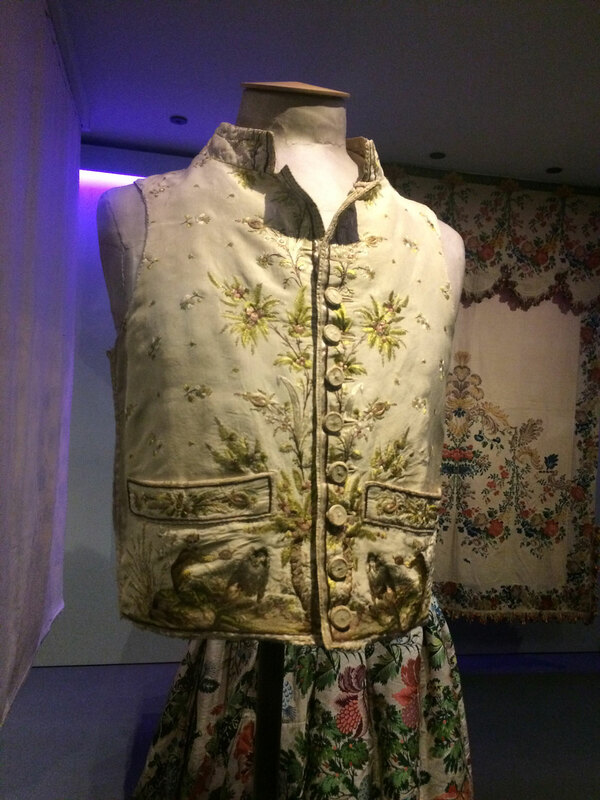 I’m sure it was on an episode of No Such Thing As A Fish (a brilliant podcast) where they talked about the Victorians’ obsession with ferns, and that was definitely in evidence in the clothing in the exhibition. 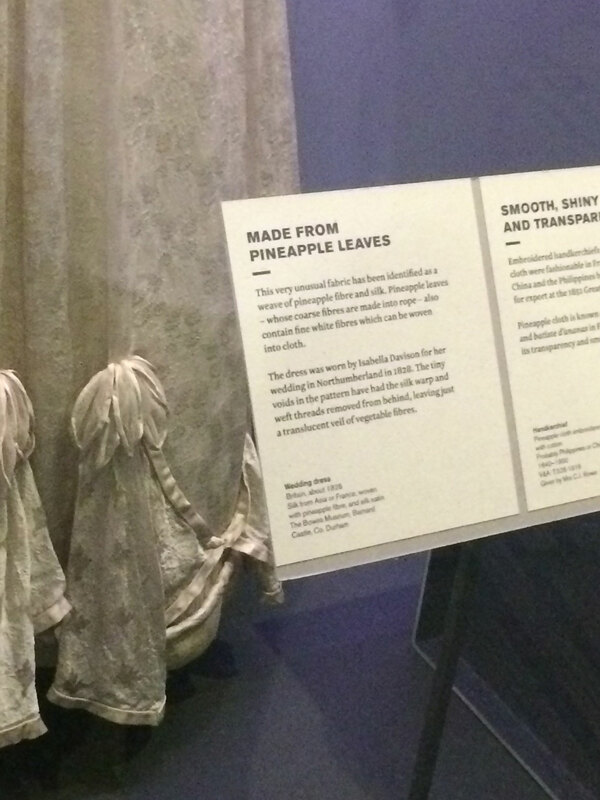 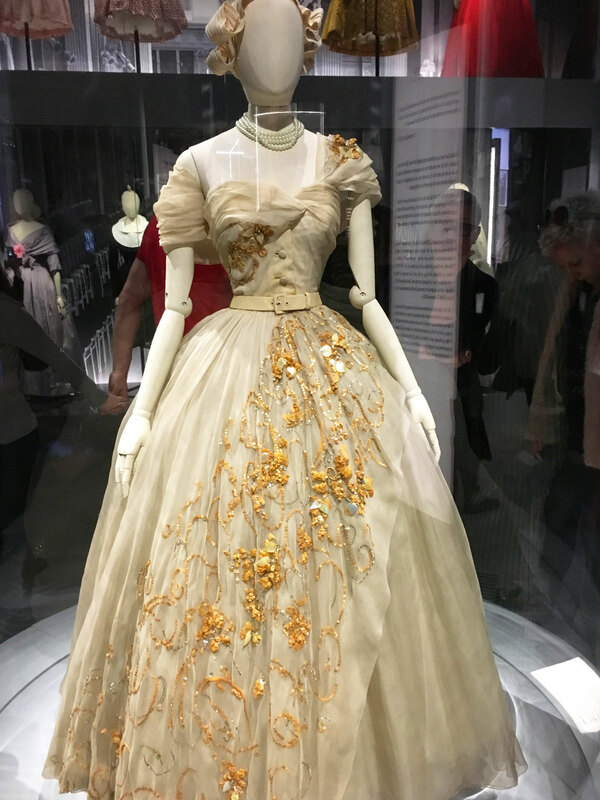 I like how even in the past, people experimented with using unusual fibres to make clothes, like this dress made from pineapples. 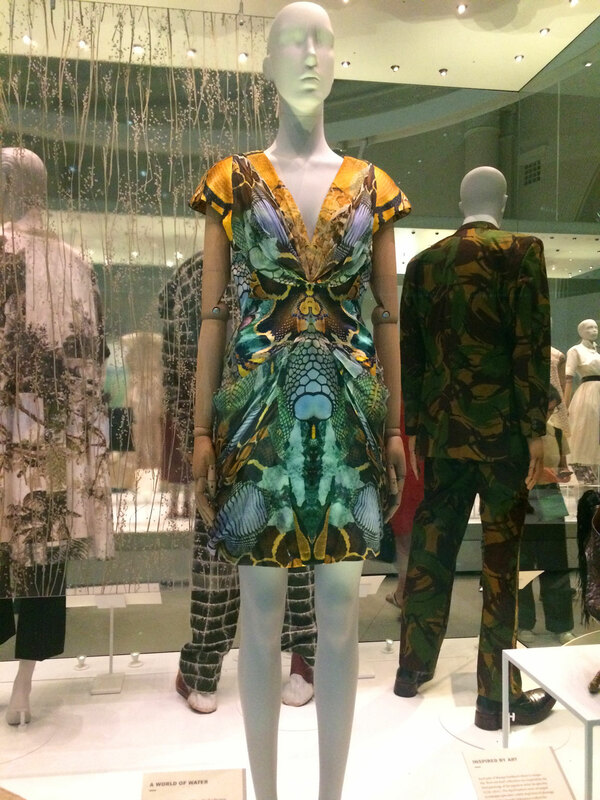 This dress, rather creepily, is decorated with beetle shells. 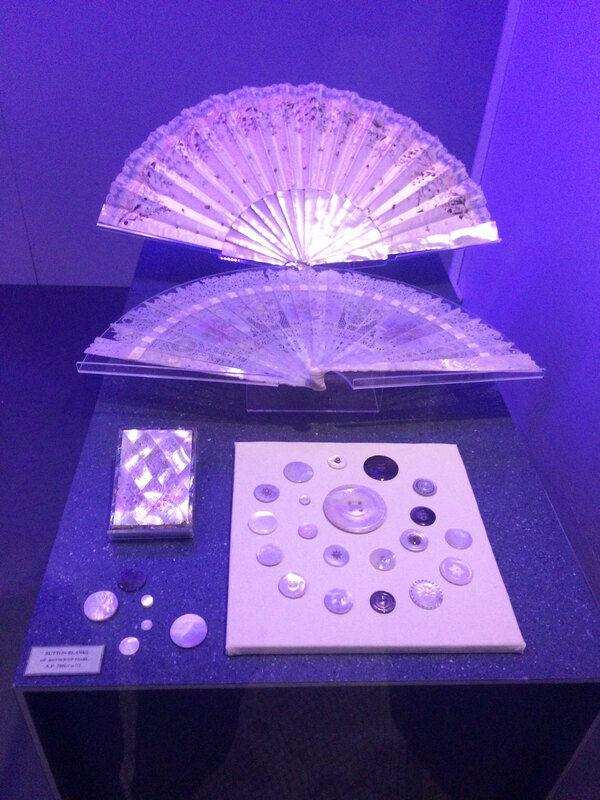 One thing I didn’t really consider as coming from animals was mother of pearl, but of course it comes from the inside of shells. 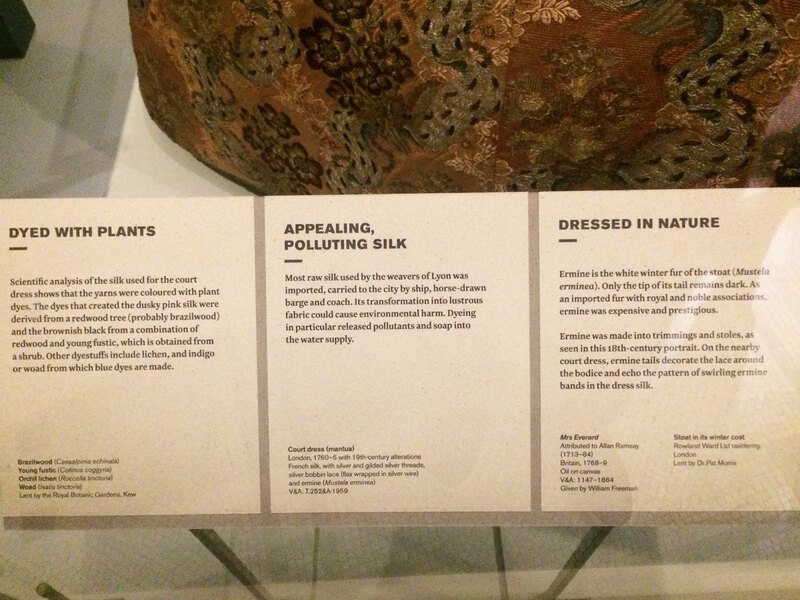 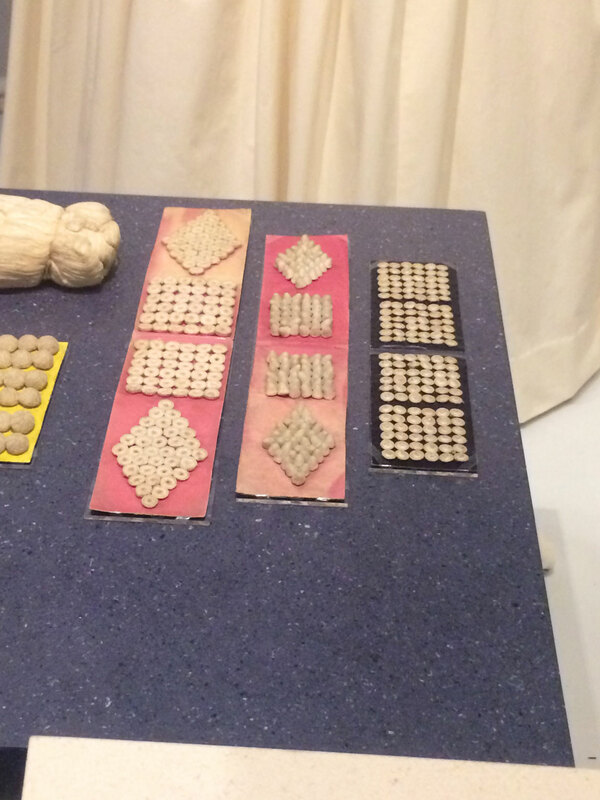 All of the below things are made from spun glass, which somehow was woven into fabric. 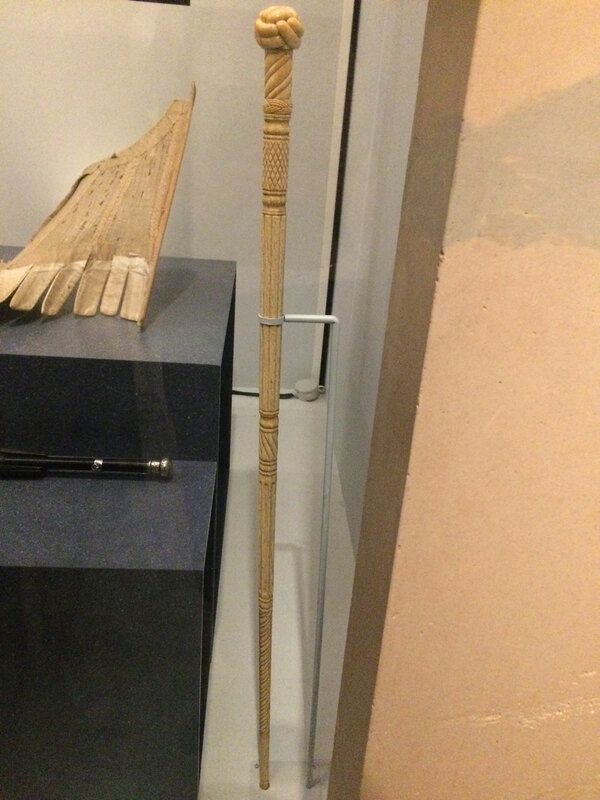 I don’t know how strong it is, but it’s pretty impressive! 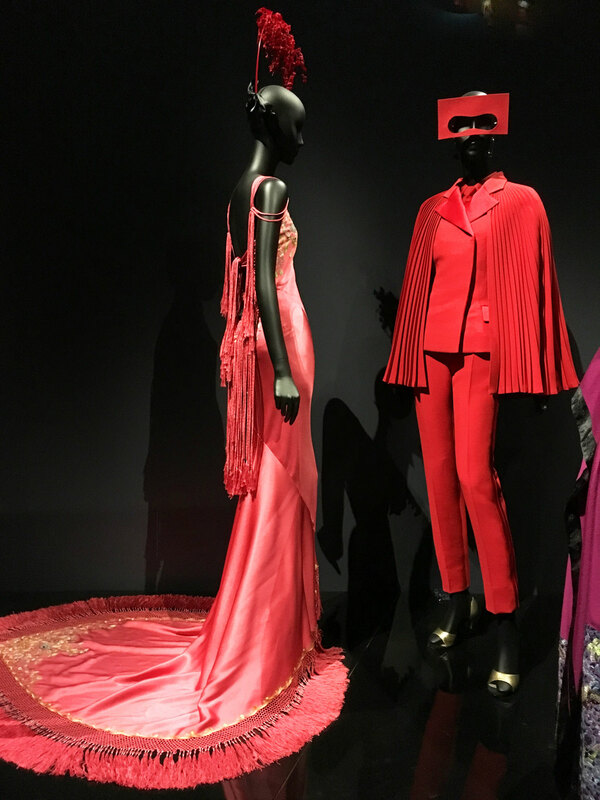 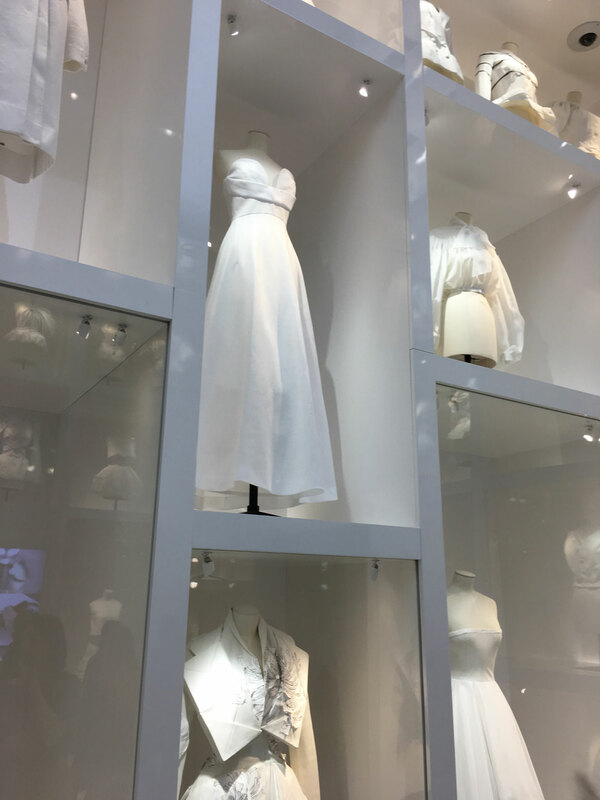 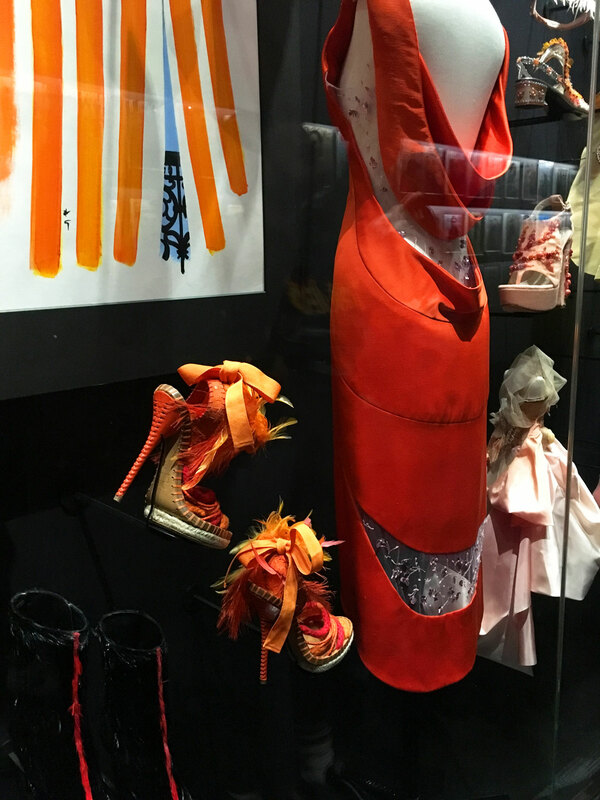 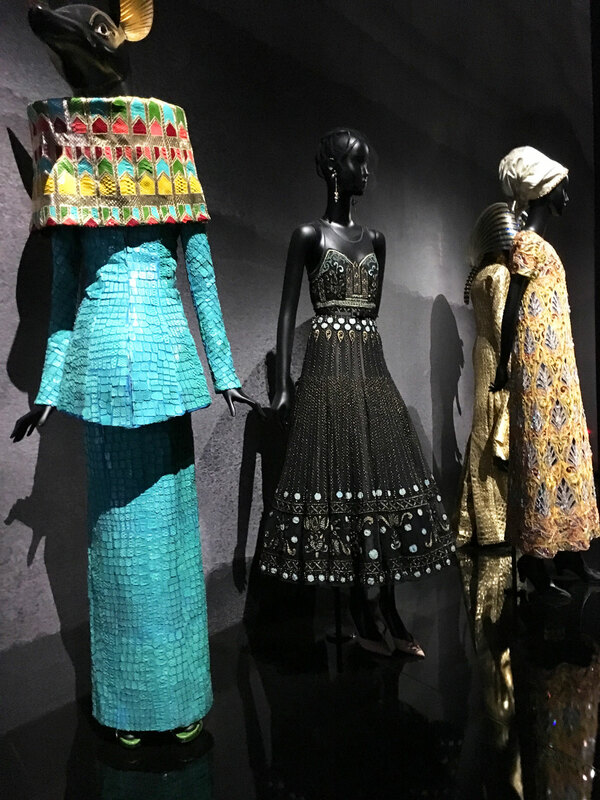 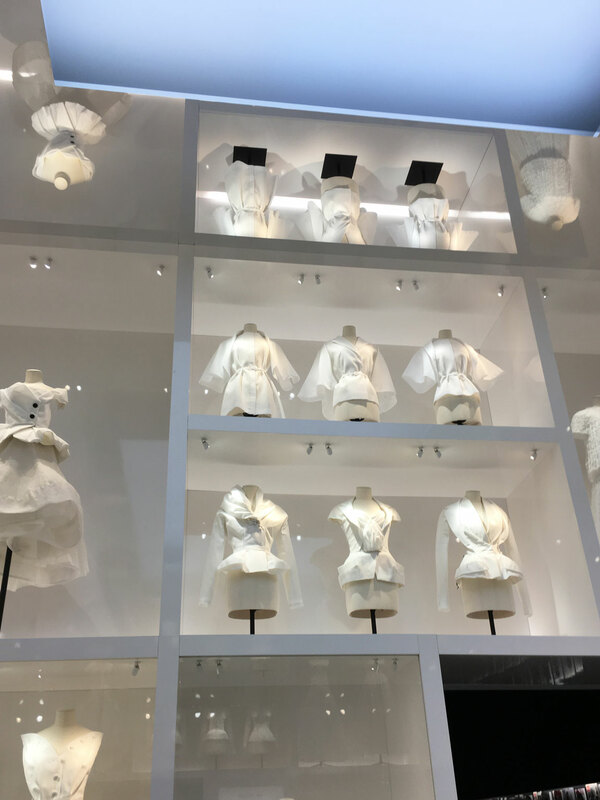 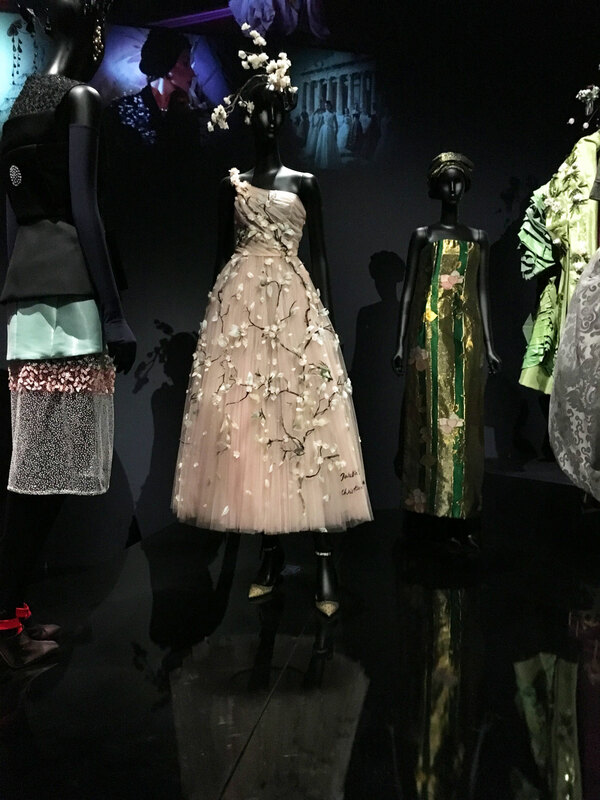 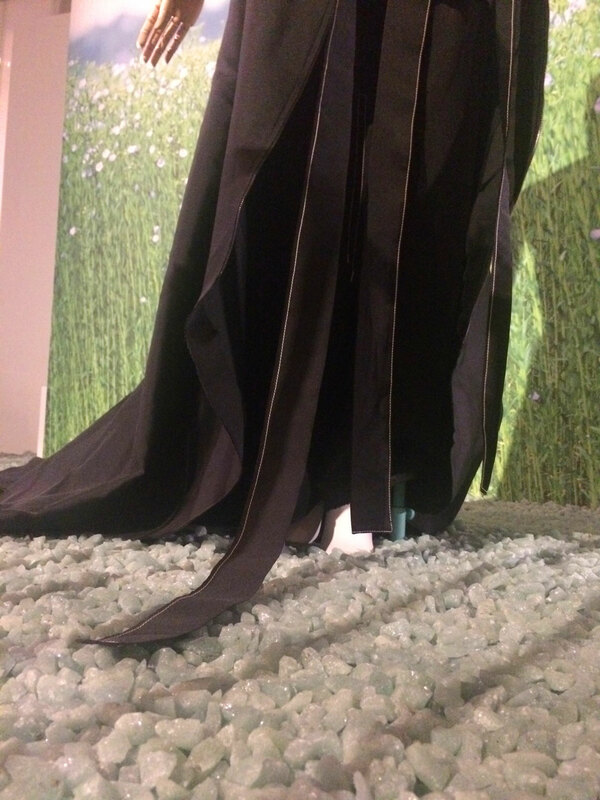 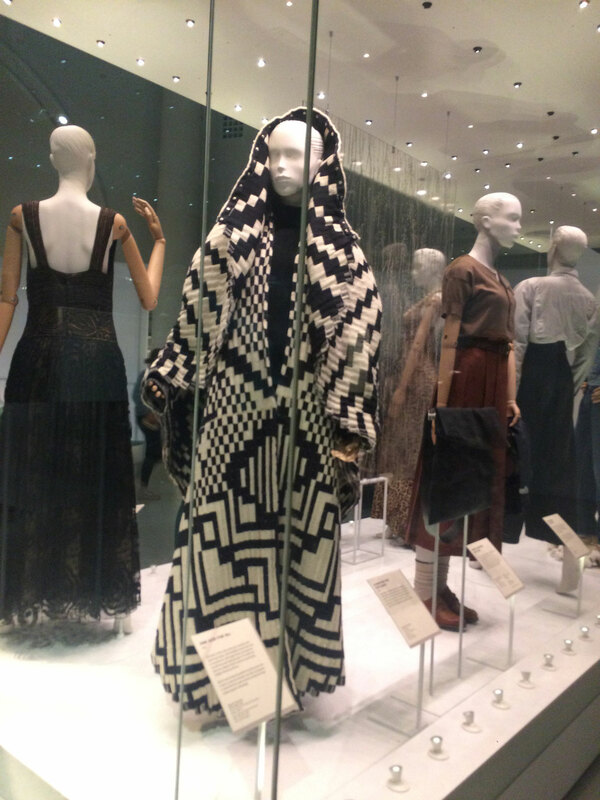 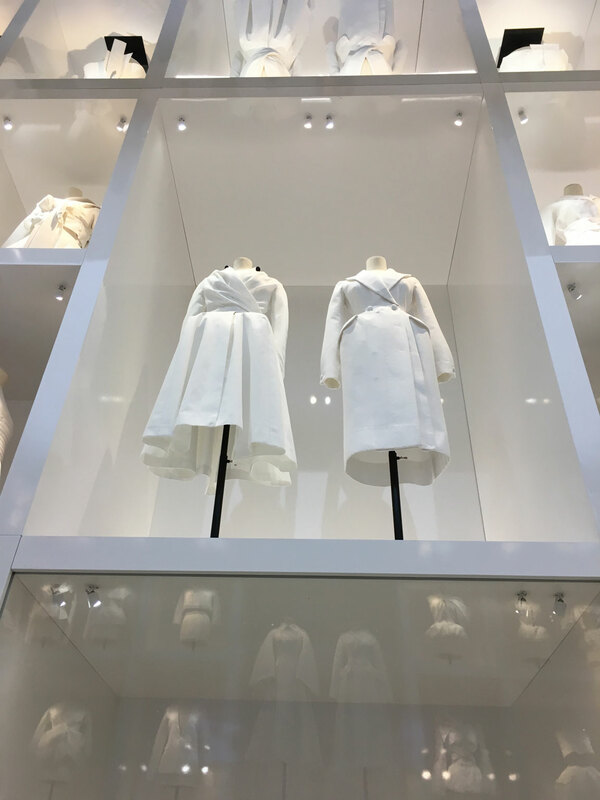 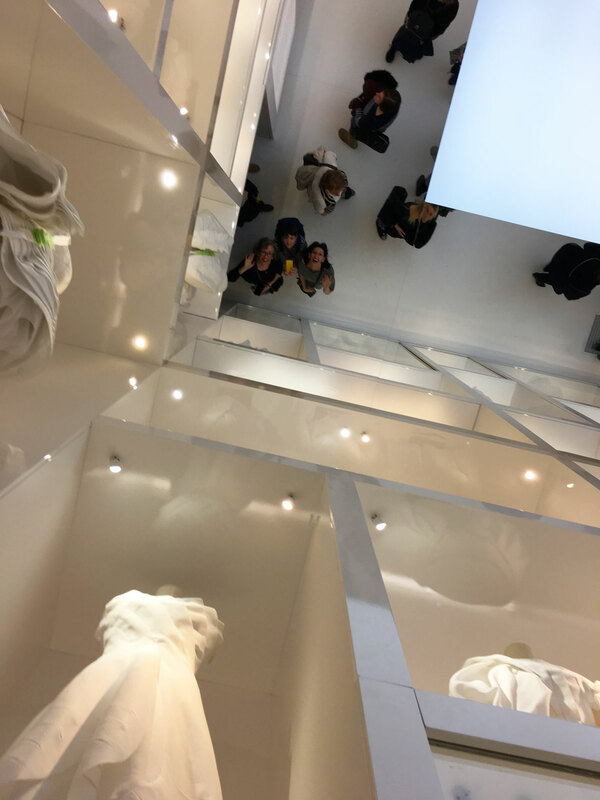 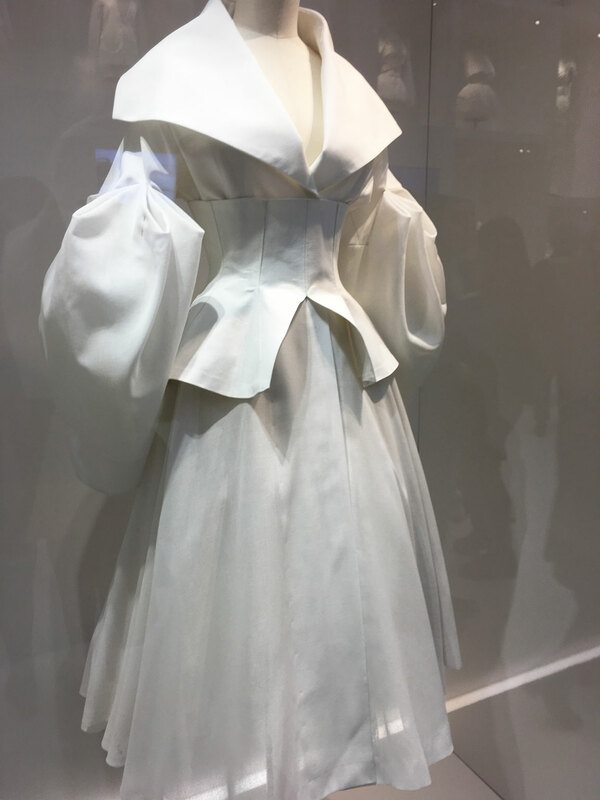 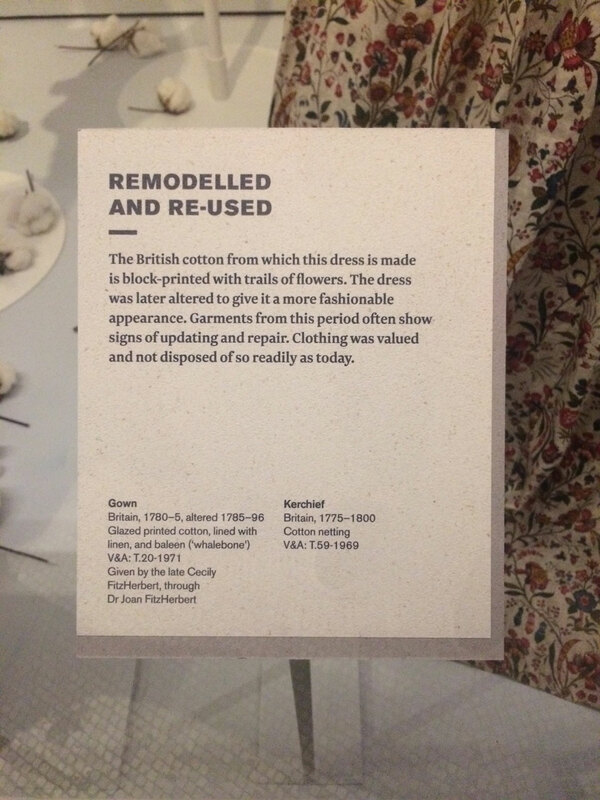 The second part of the exhibition (upstairs) was much more hopeful that the first half – it was all about new developments in sustainability and designers looking for better ways of making still beautiful garments. 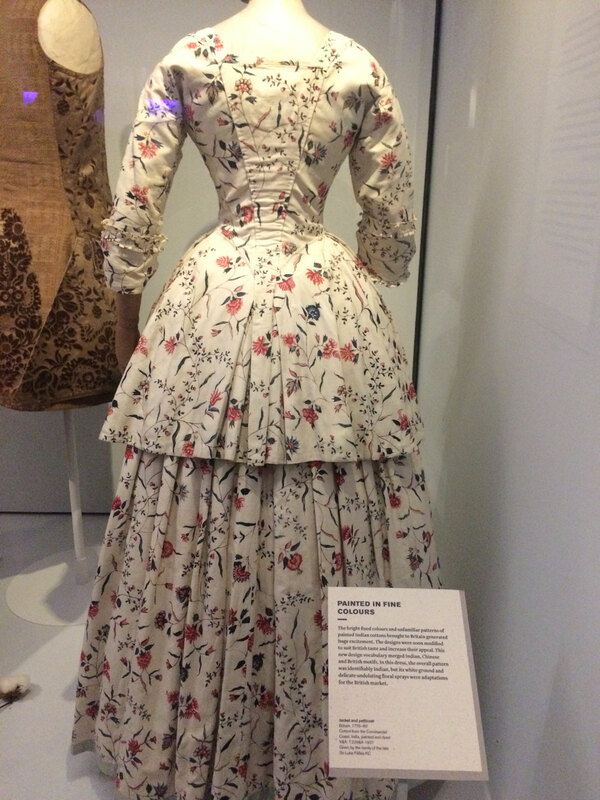 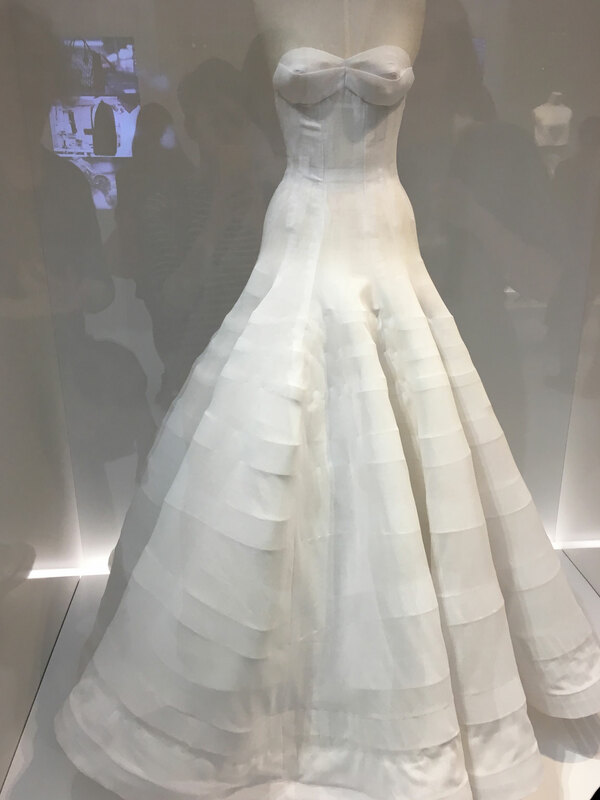 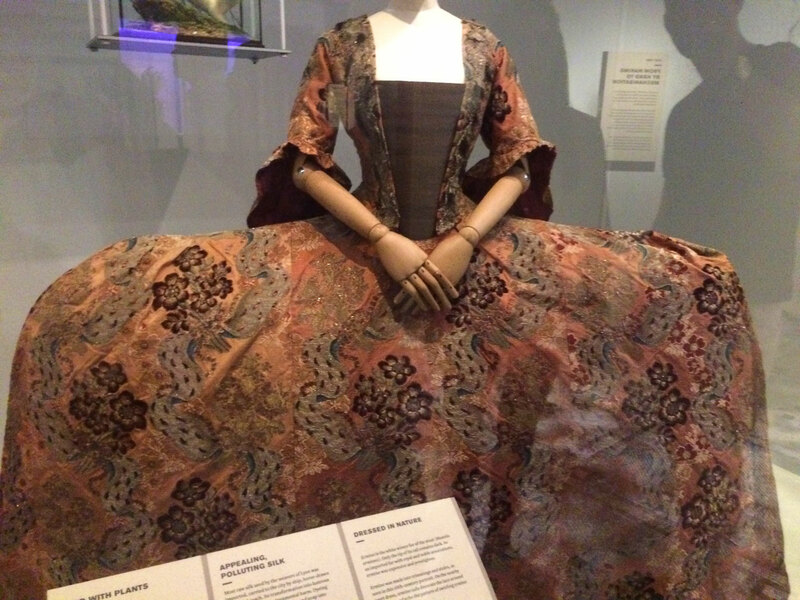 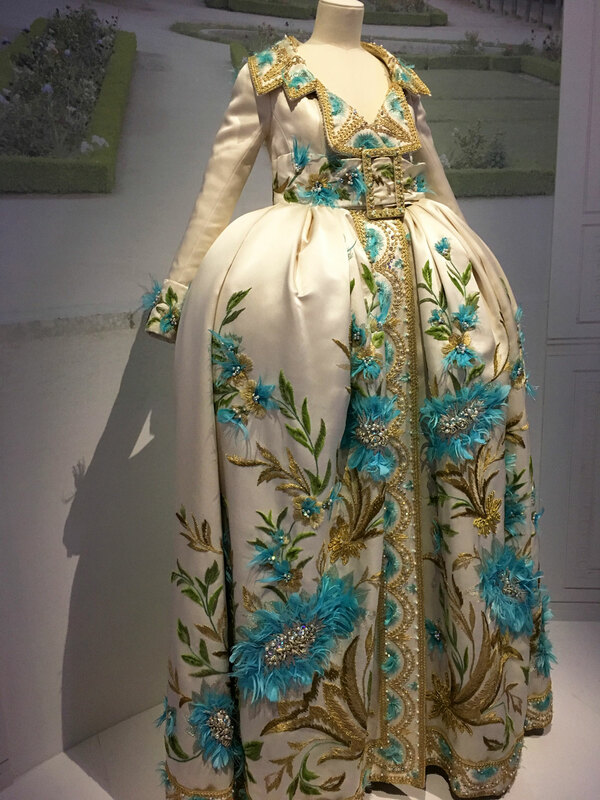 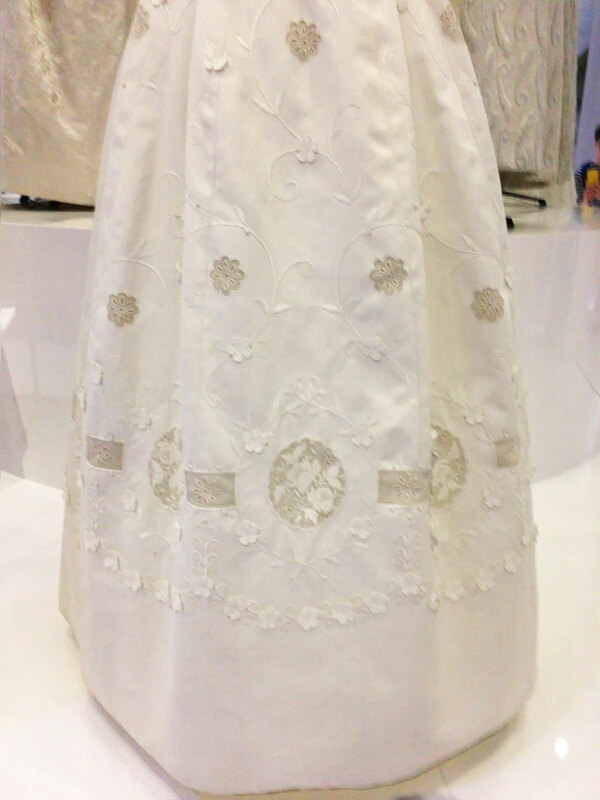 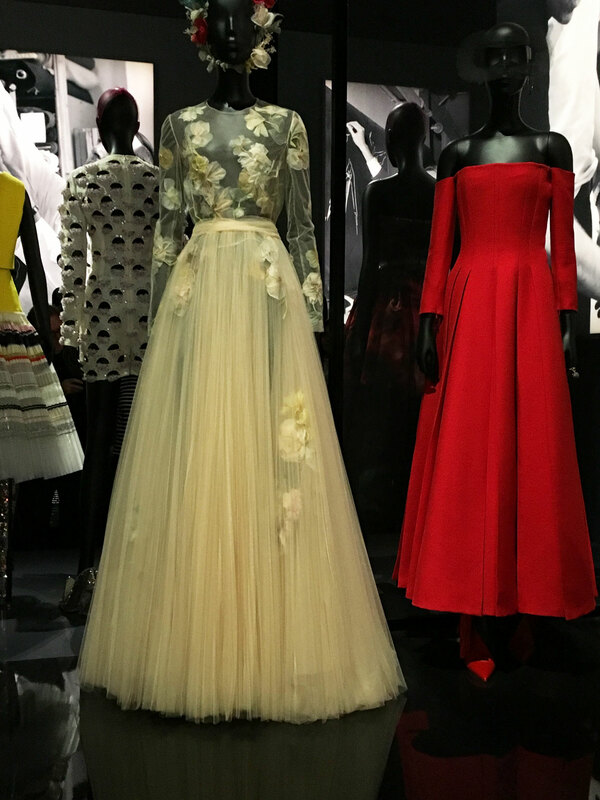 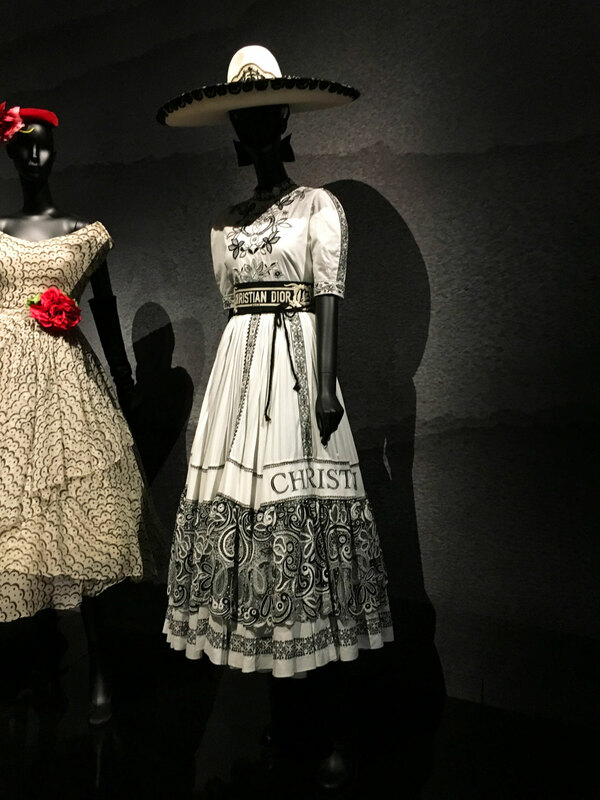 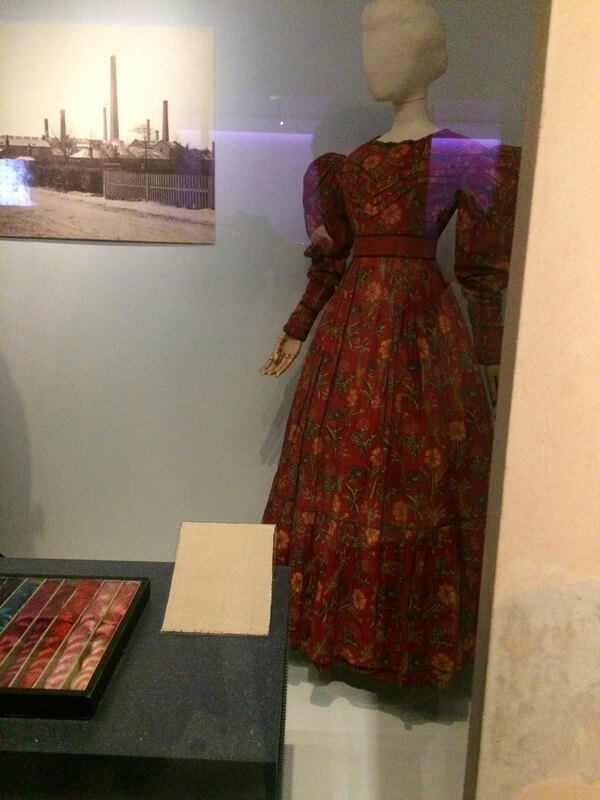 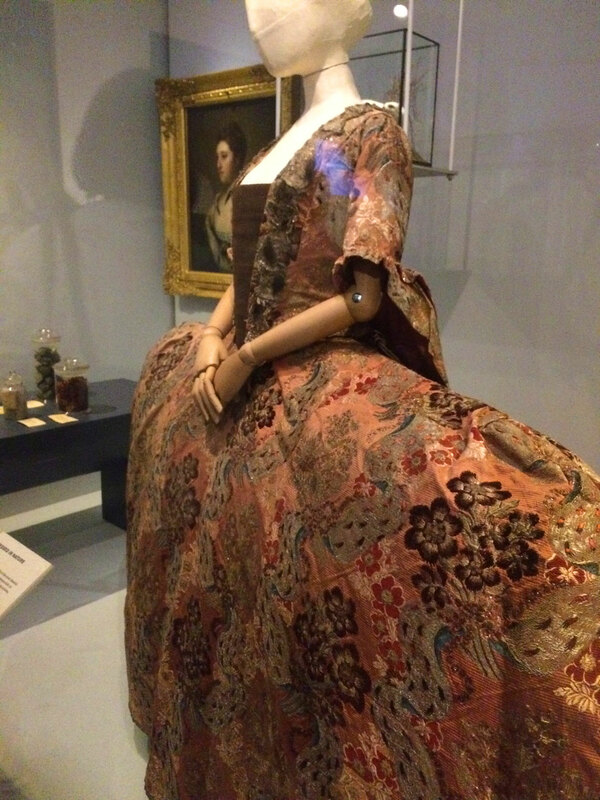 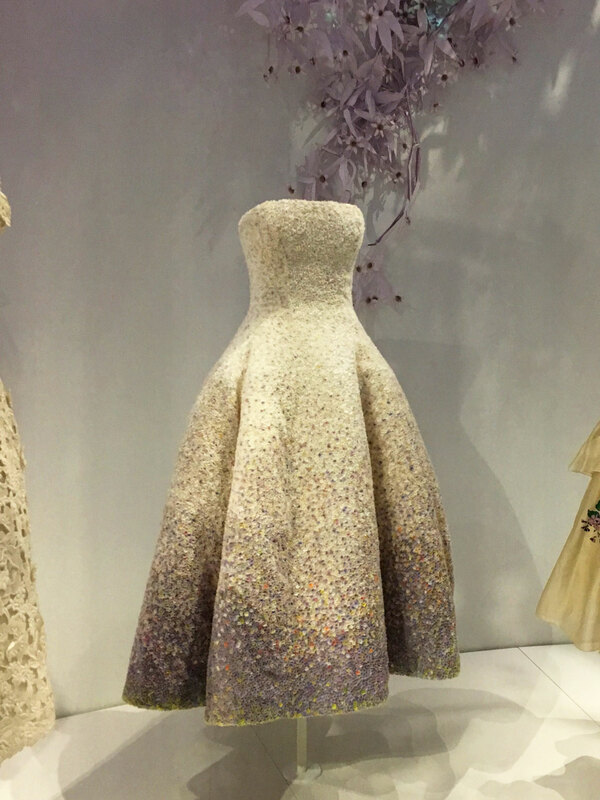 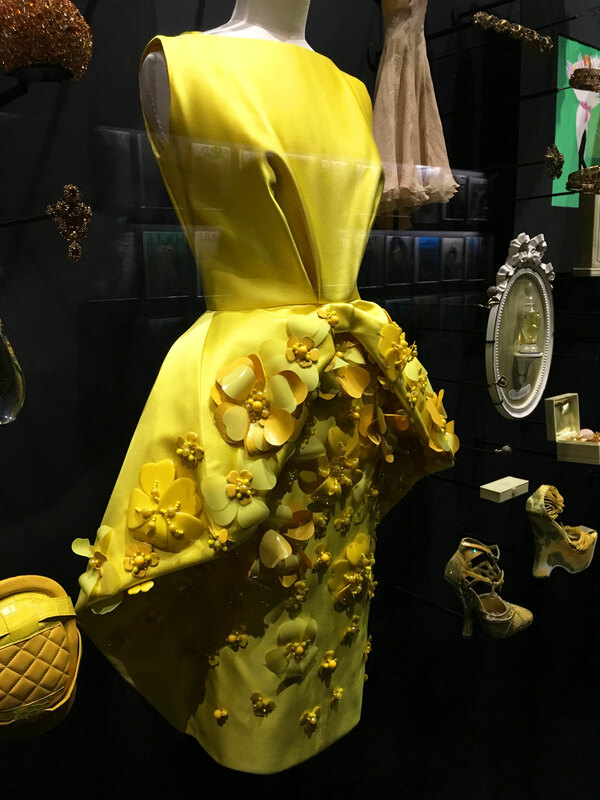 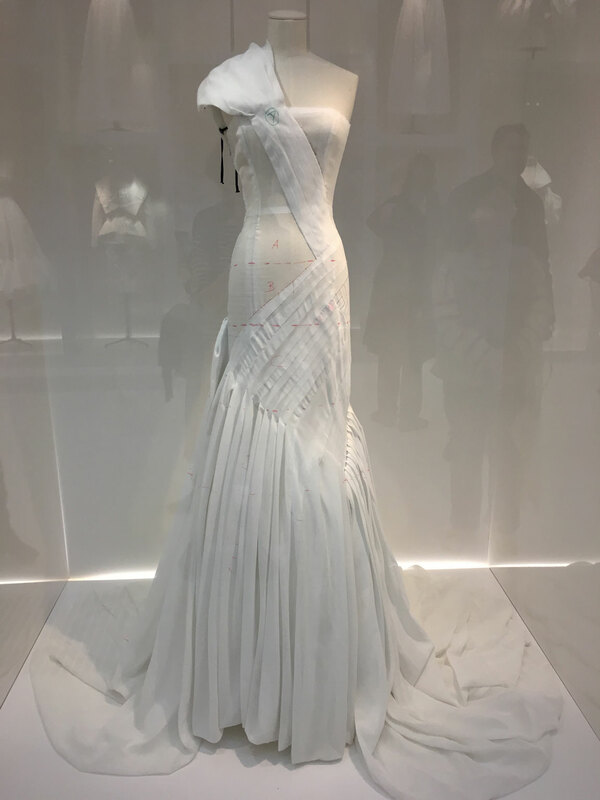 This dress was one of my favourites in the whole exhibition. 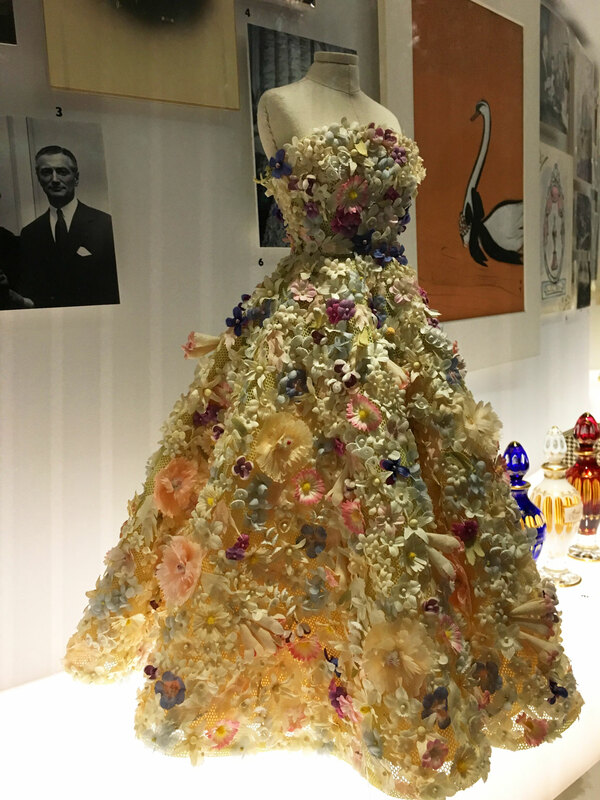 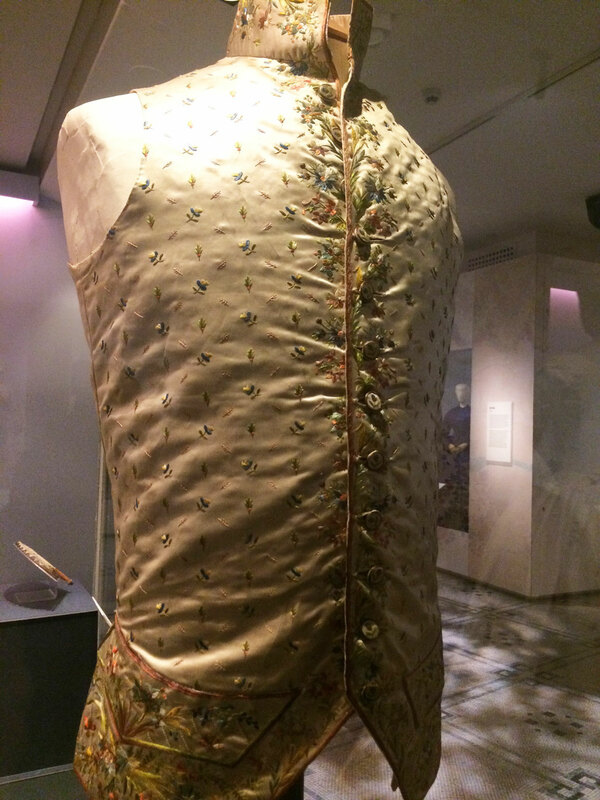 It’s made from strips of cellulose acetate stitched into silk and decorated with artificial pearls. 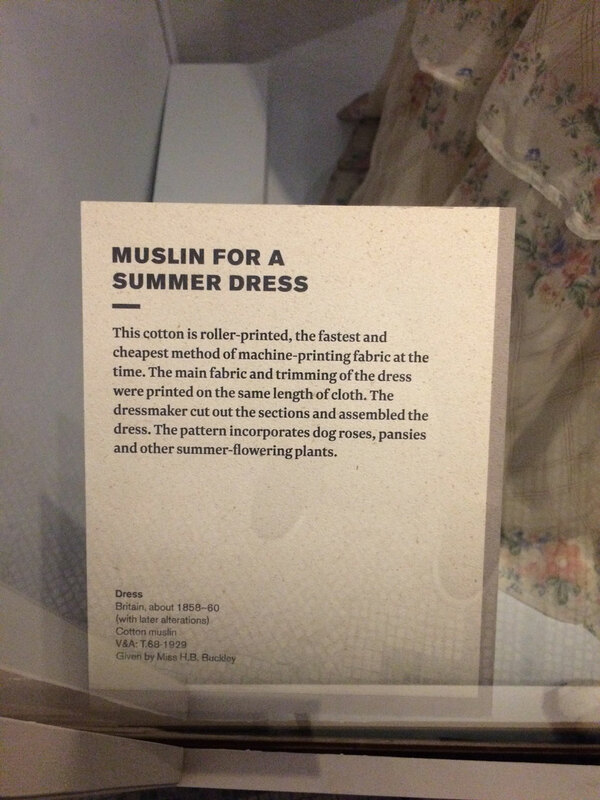 And it’s from 1936! 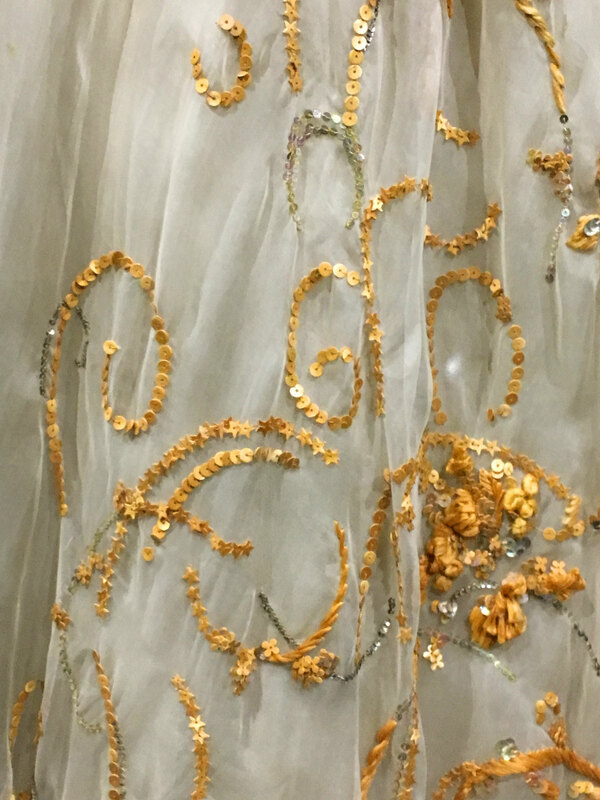 It looks like it was made last year! 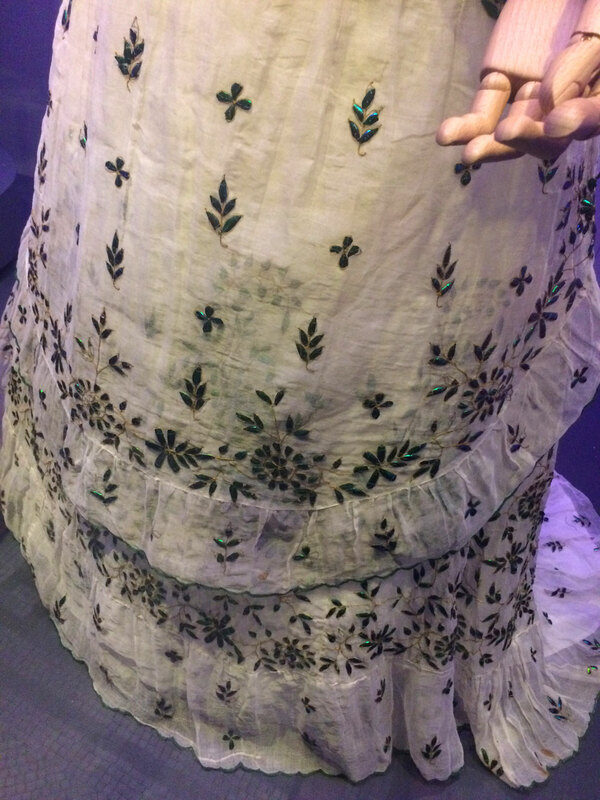 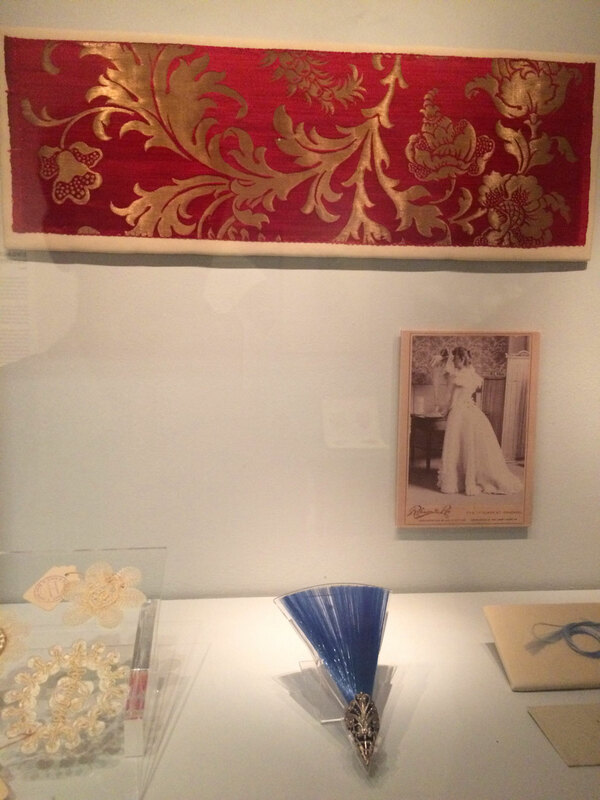 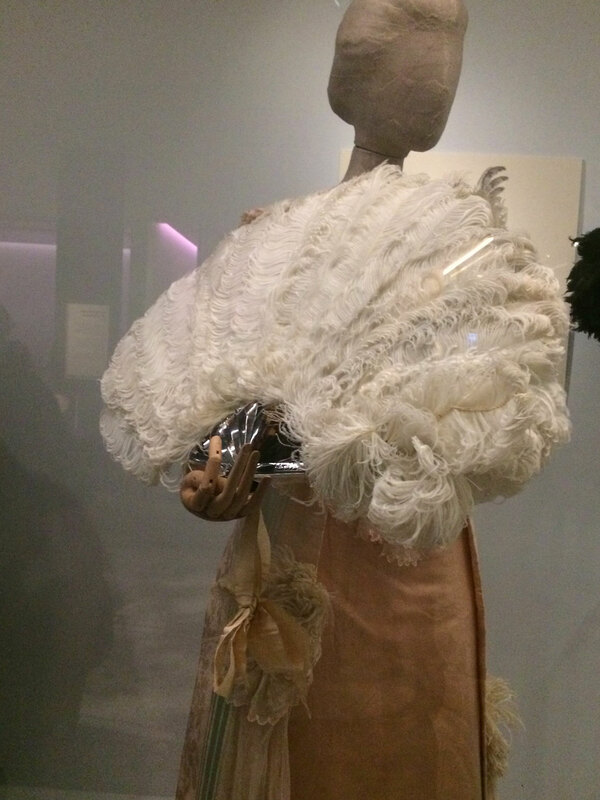 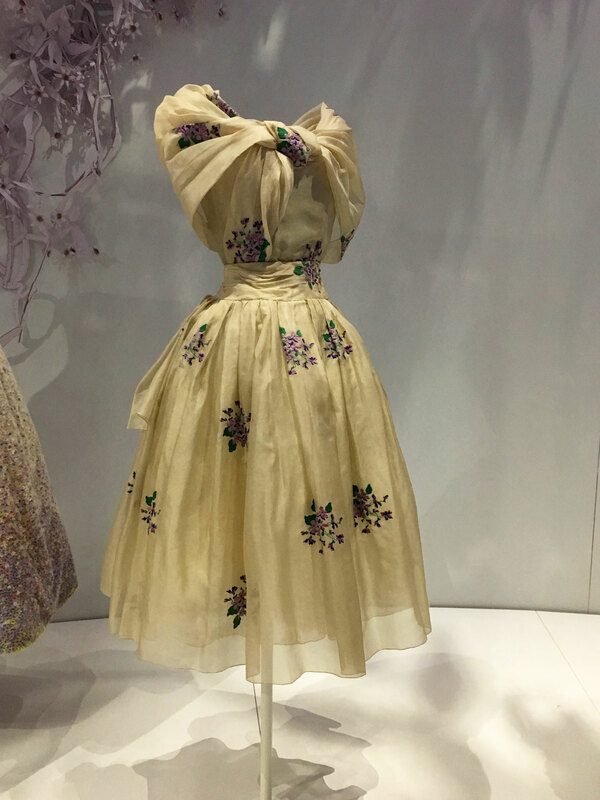 This dress from 1920s Paris is made from Bemberg silk, which is made from cellulose. 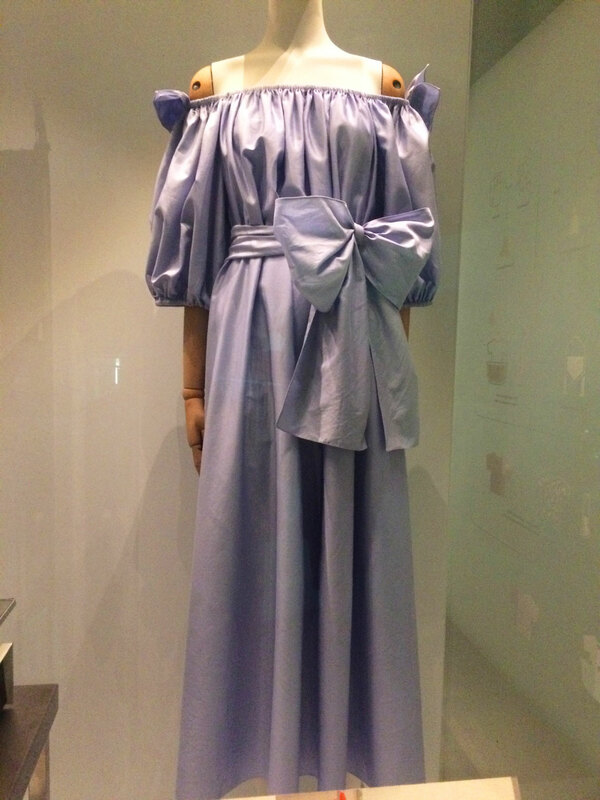 This 1980s dress is designed to stretch over people of any size, which means the manufacturer doesn’t have to make multiple sizes, which means less waste from the sizes which remain unsold. 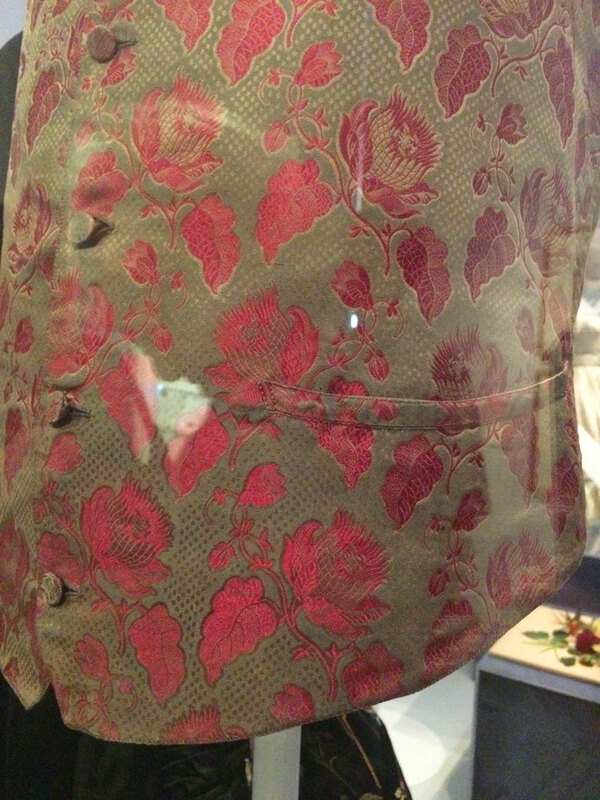 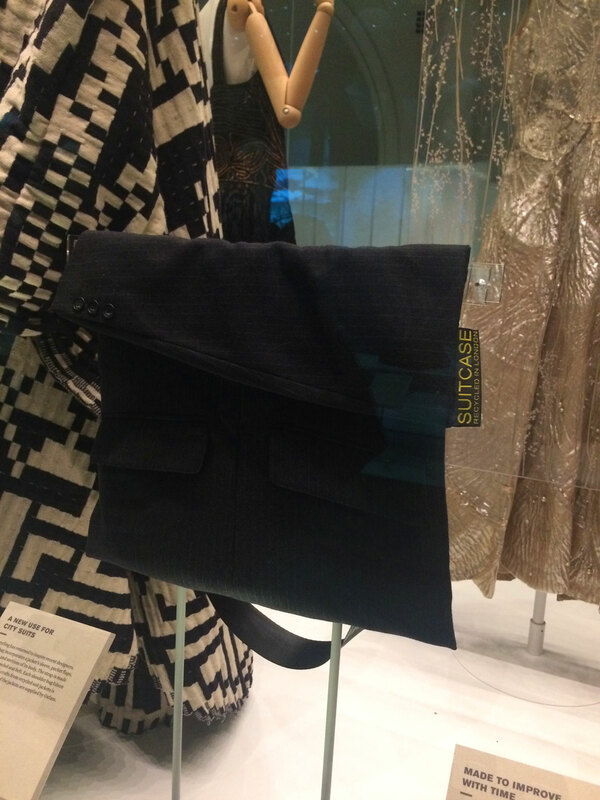 I love this ‘suitcase’ made from a suit – I should have had this idea during The Refashioners! 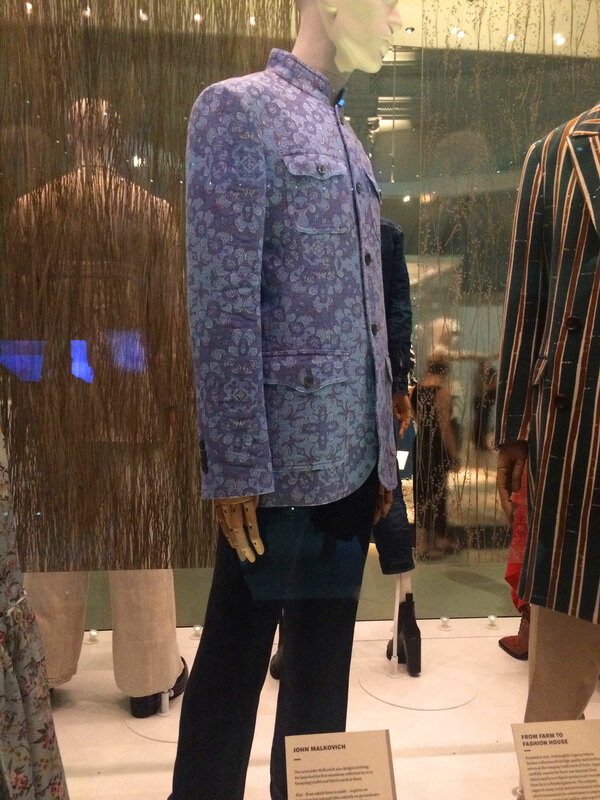 I like how they’ve retained the look of the original sleeve and pockets. 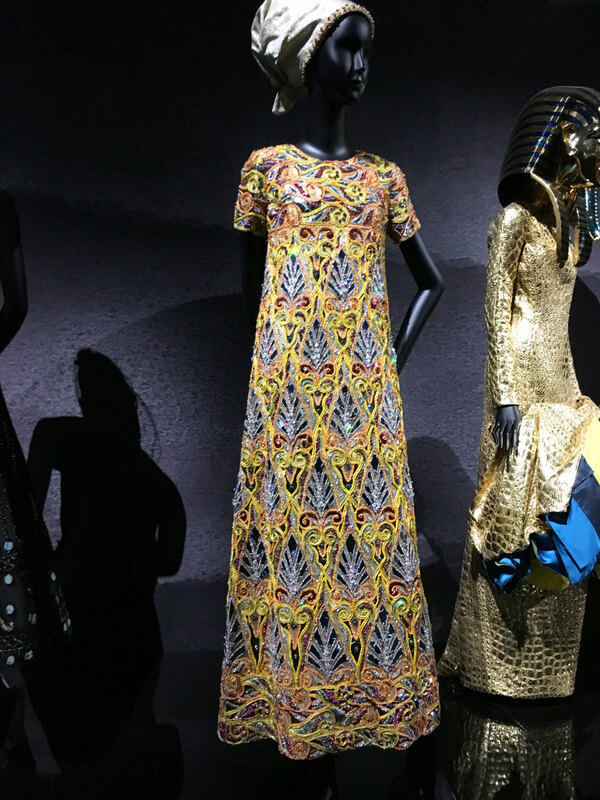 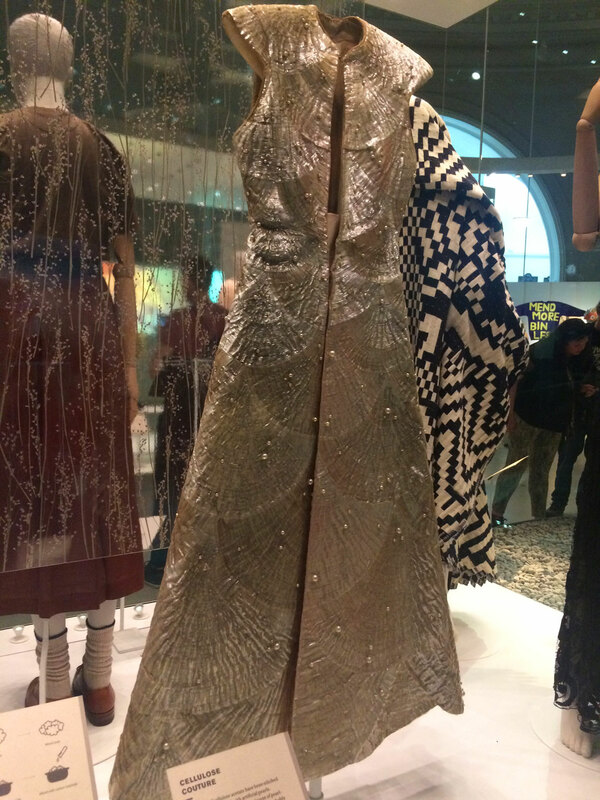 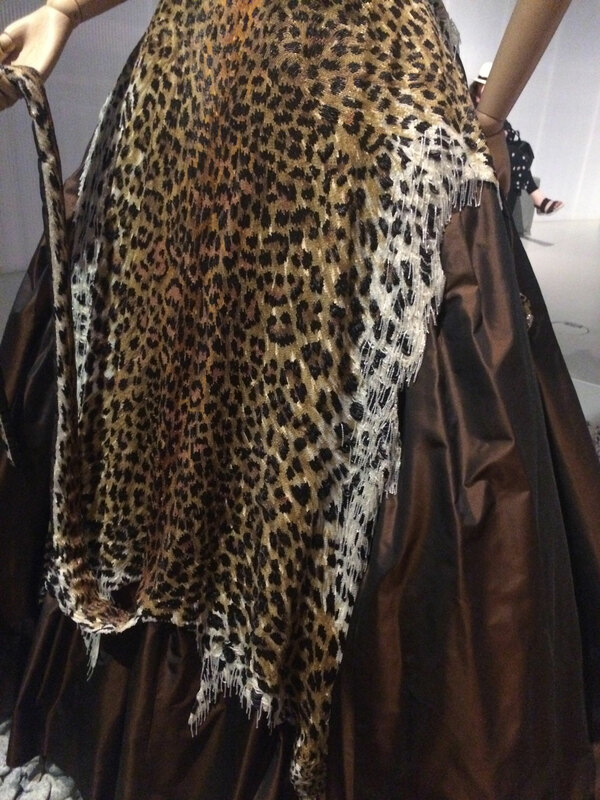 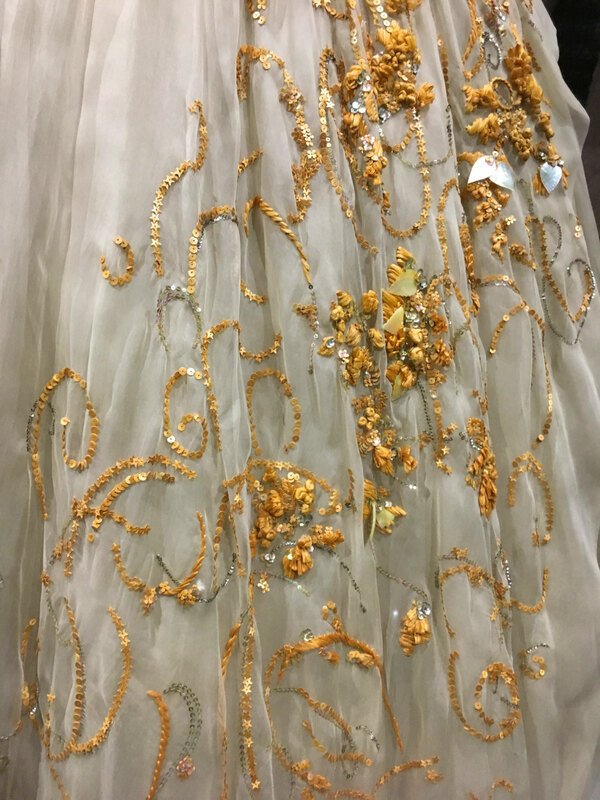 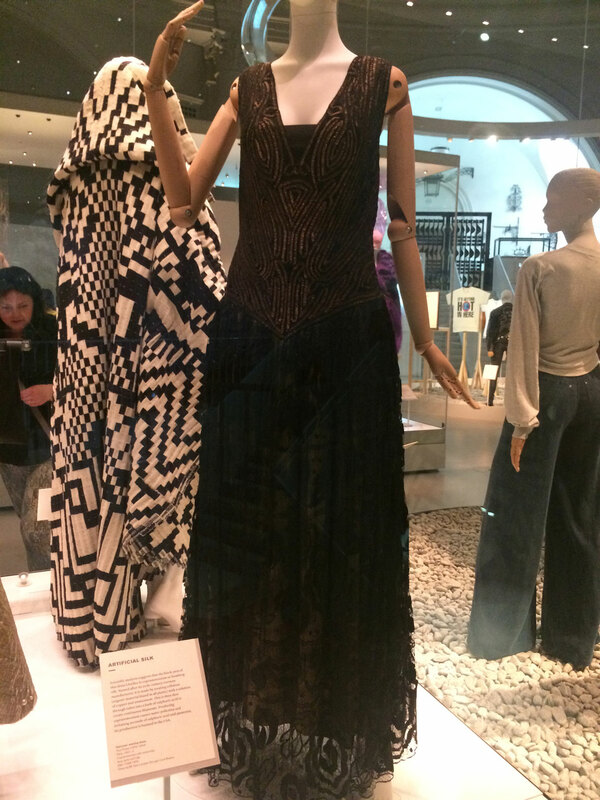 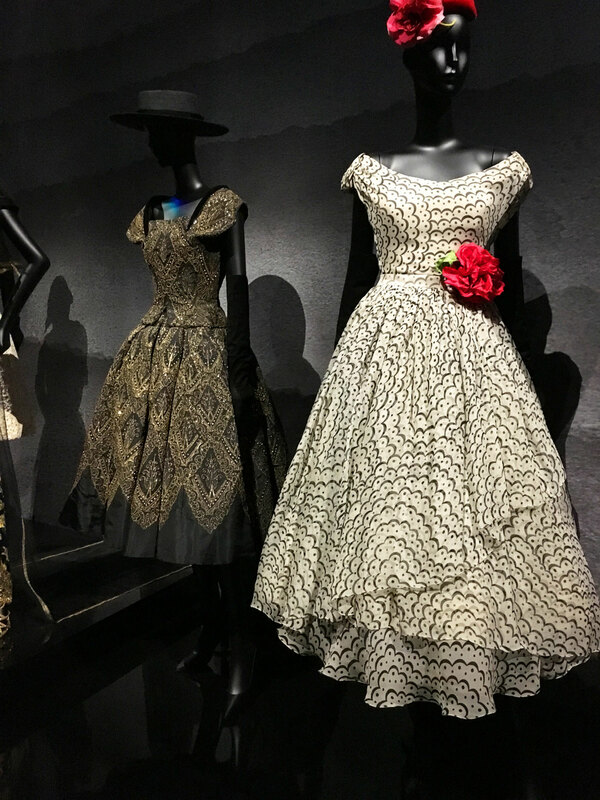 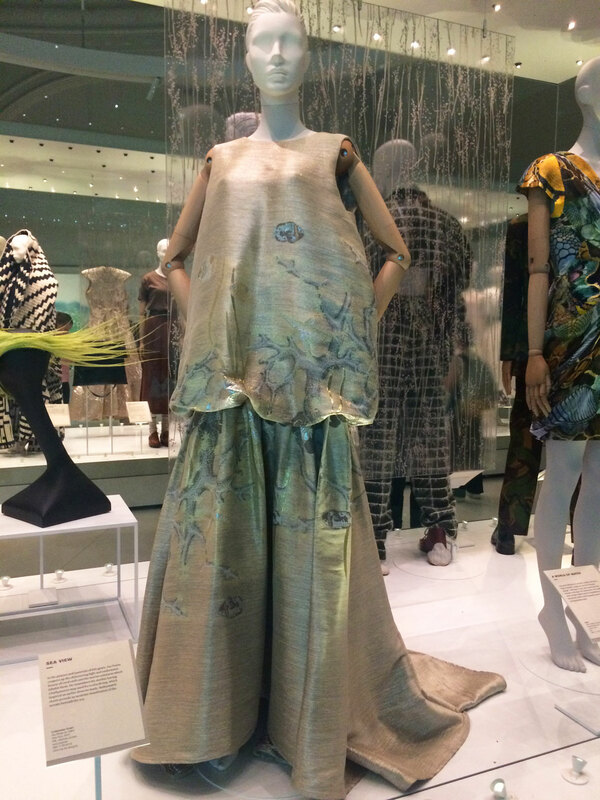 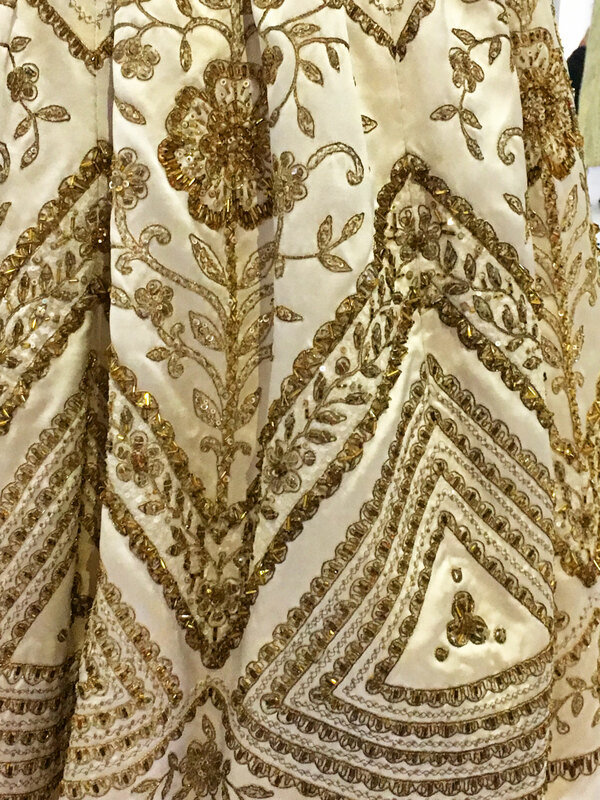 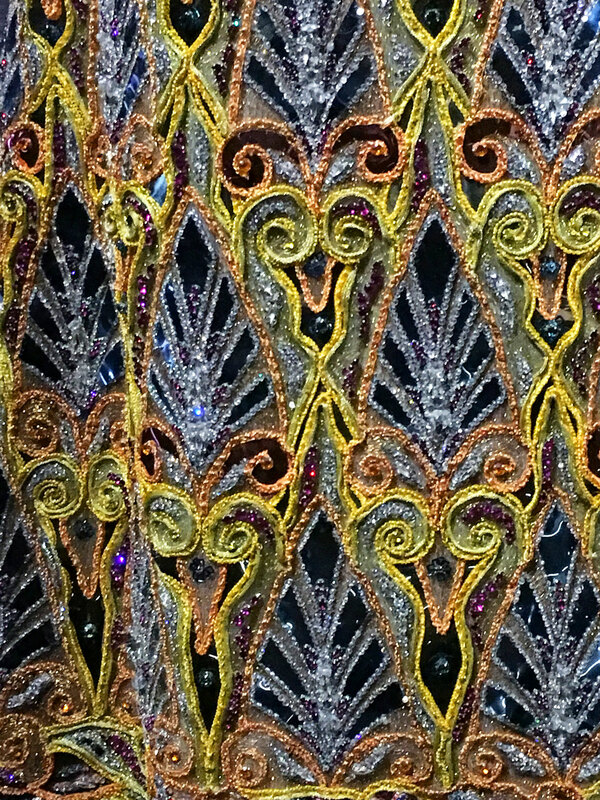 This dress was stunning – it looked like a leopard skin draped on the front of it, but it’s all made from beads! 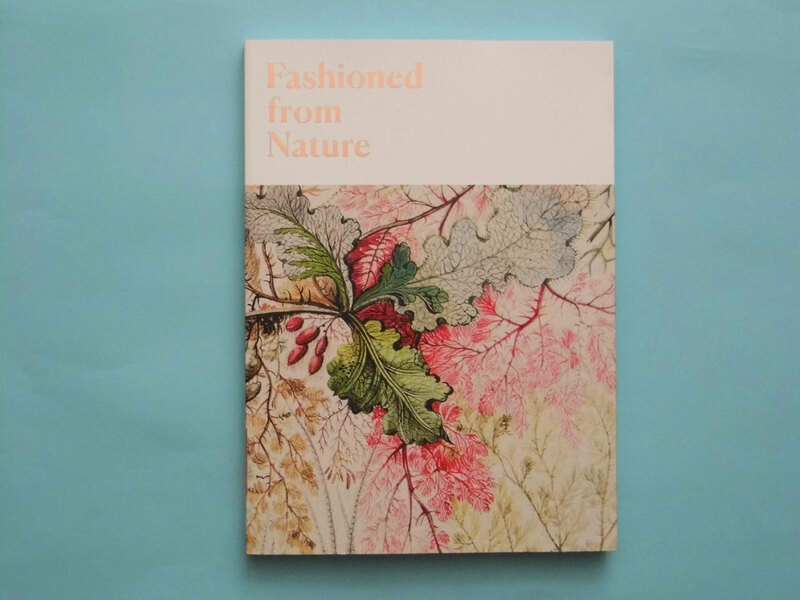 I love that the depiction of nature is still a thing that is done now. 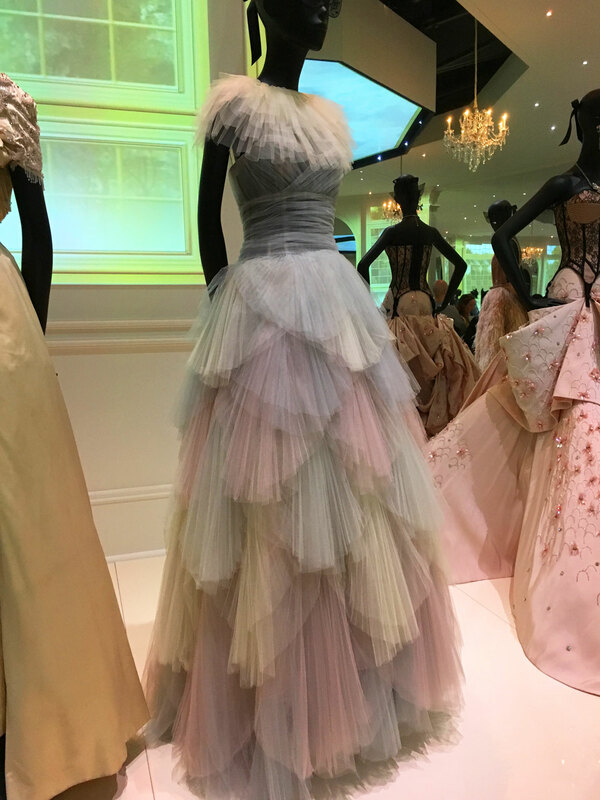 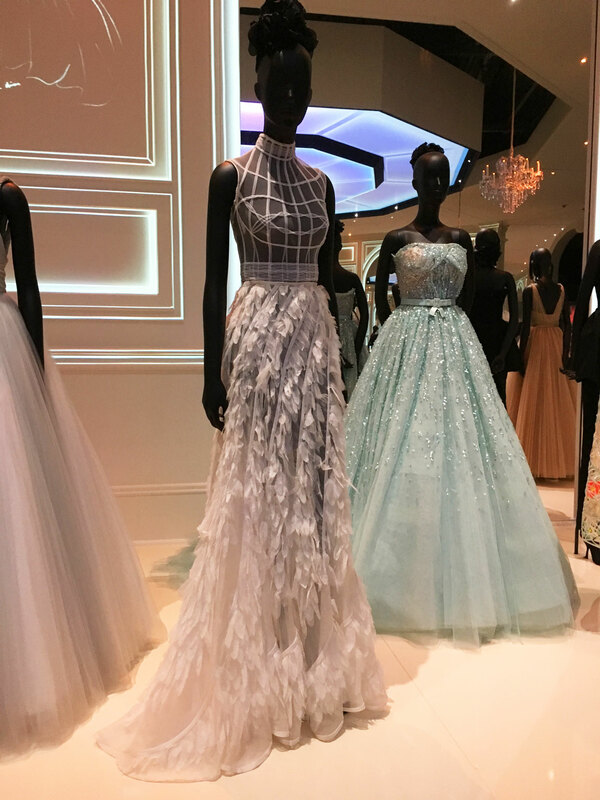 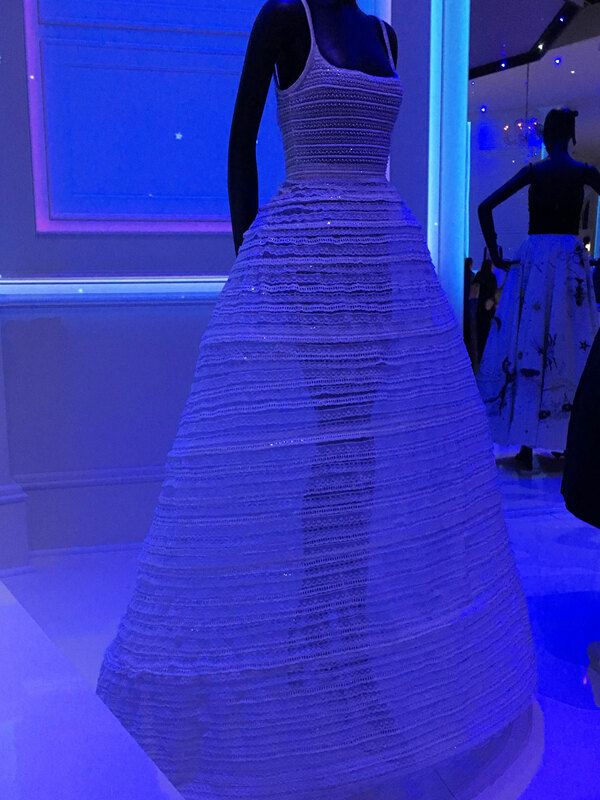 I love the underwater scene on this Zac Posen gown. 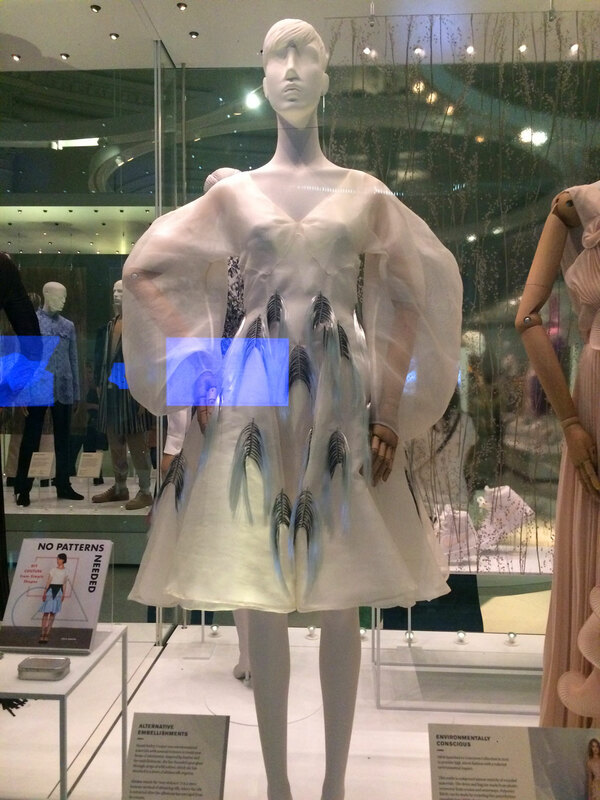 Since I found the real feather so creepy, I really liked the simplicity of the fake feathers on this dress. 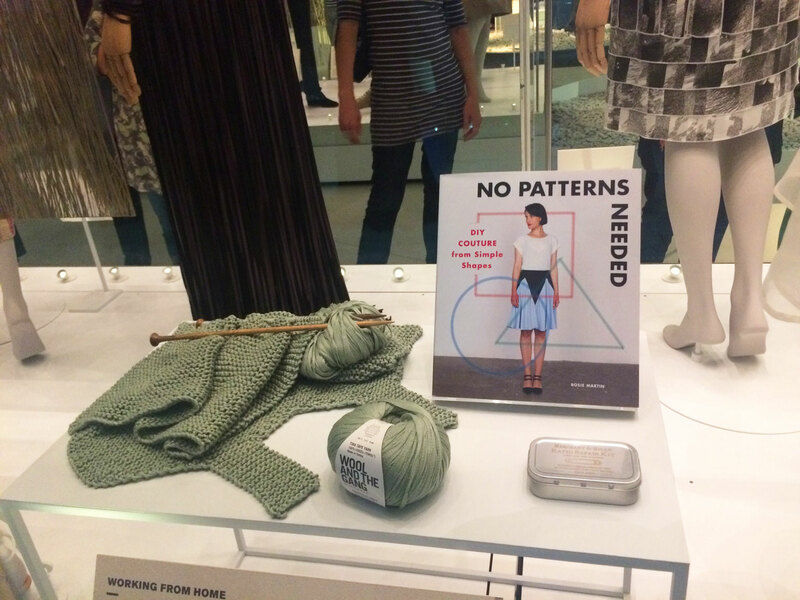 I was very excited to see No Patterns Needed and a shout out to the growing group of people who make their own clothes. 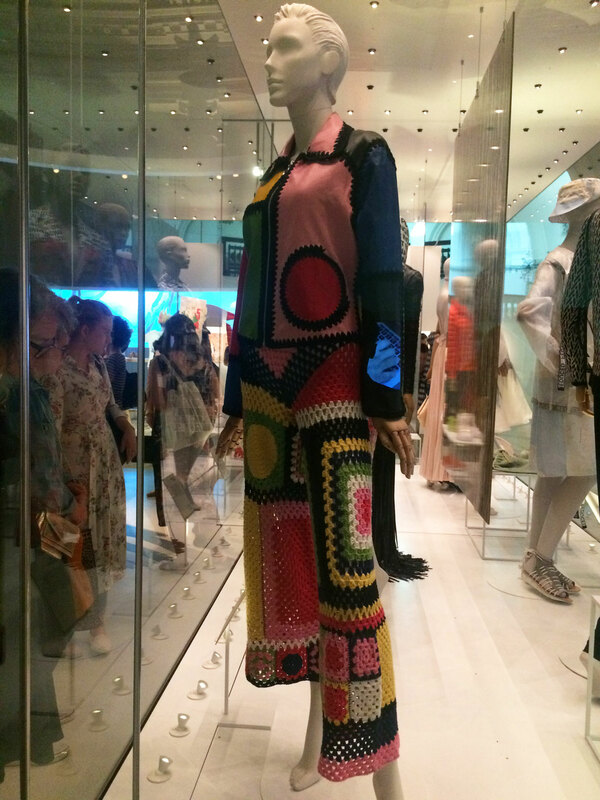 I’m not totally sold on this look but I can see the merit of the idea of using parts of crochet that no-one wanted to create a new garment. 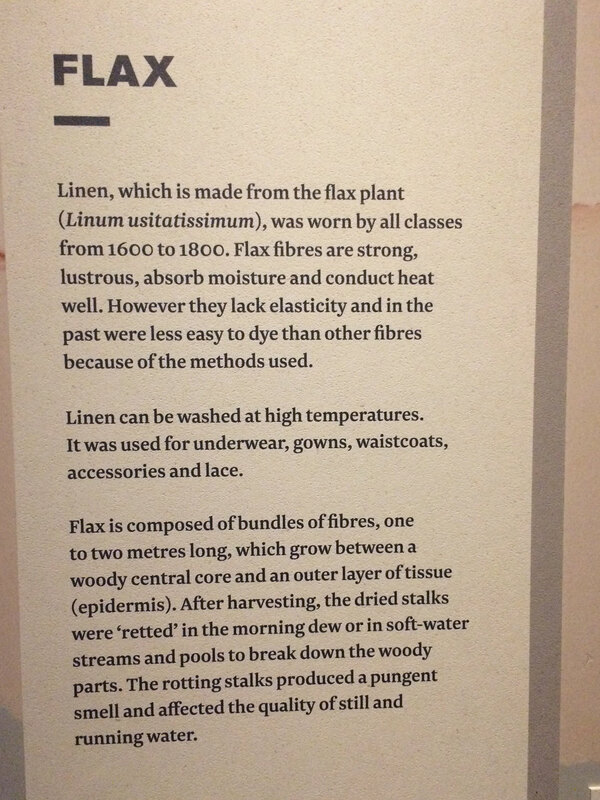 Apparently John Malkovich is a fashion designer, who uses flax as his preferred fibre, as it uses less water than other fabrics. 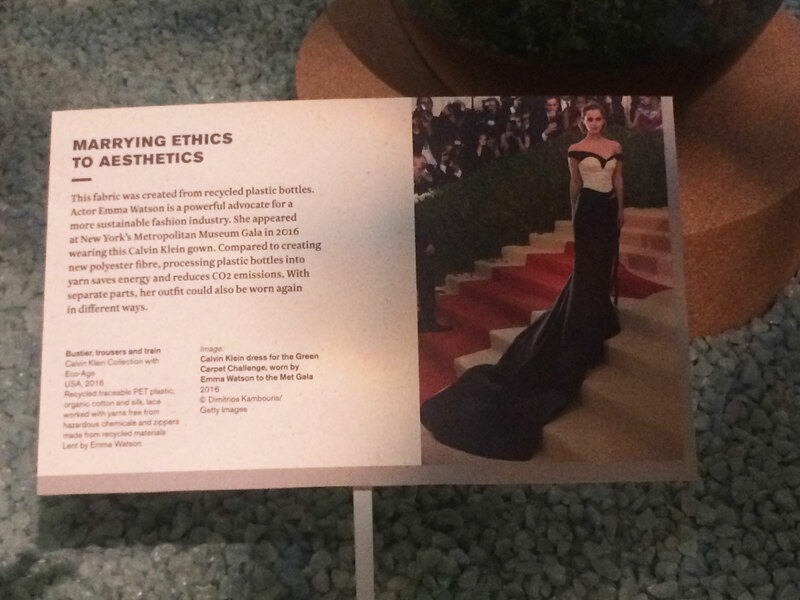 I was quite excited to see this outfit that Emma Watson wore to the Met Gala a couple of years ago as you will already know I love her style. 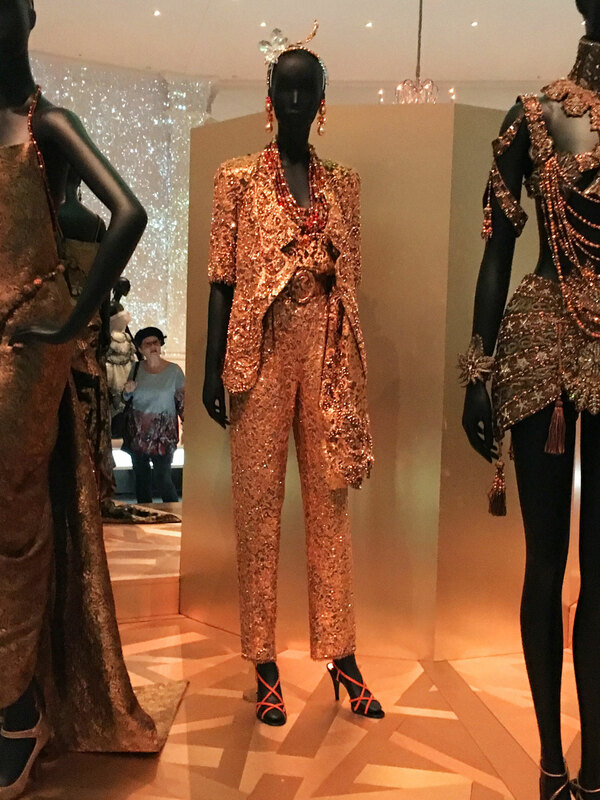 And I remember her wearing this outfit, which is made from 3 different components so she could wear them again in different outfits. 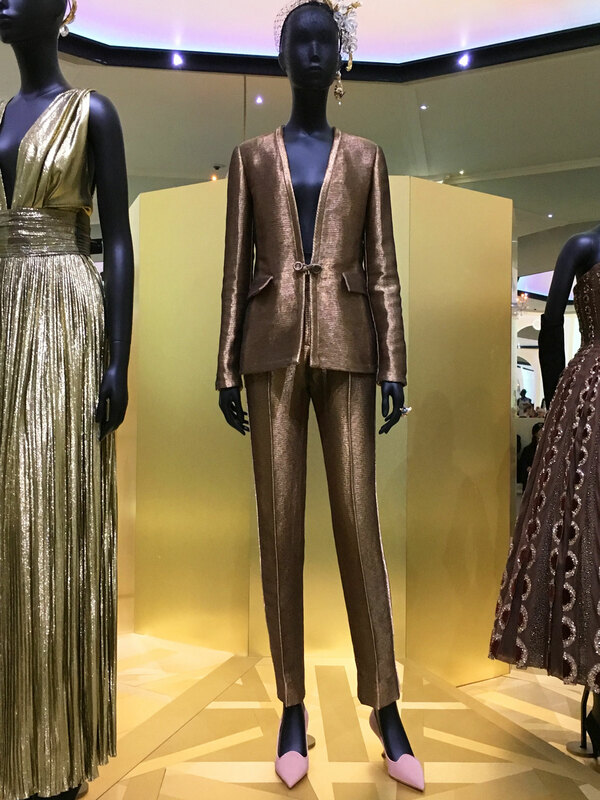 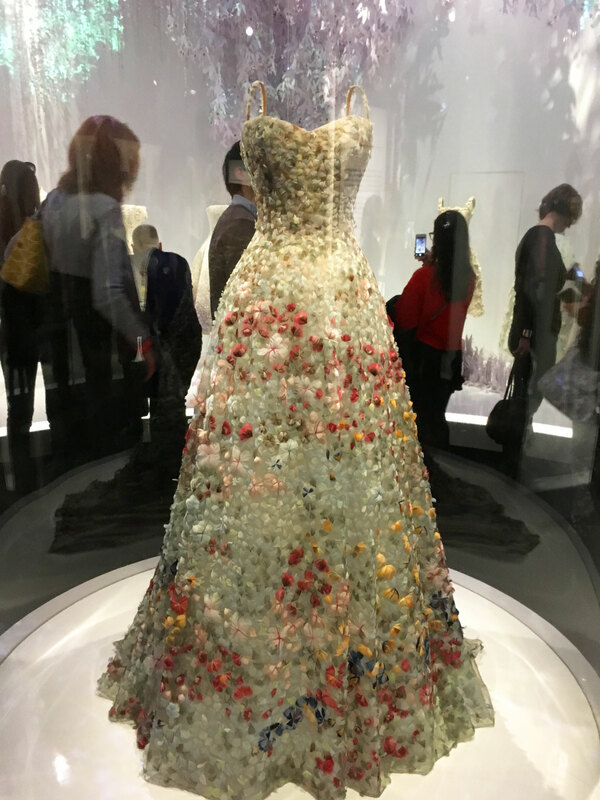 The fabric was also made from recycled materials – I like how she uses her very high profile to shout about sustainability and to support movements like the Green Carpet Challenge. 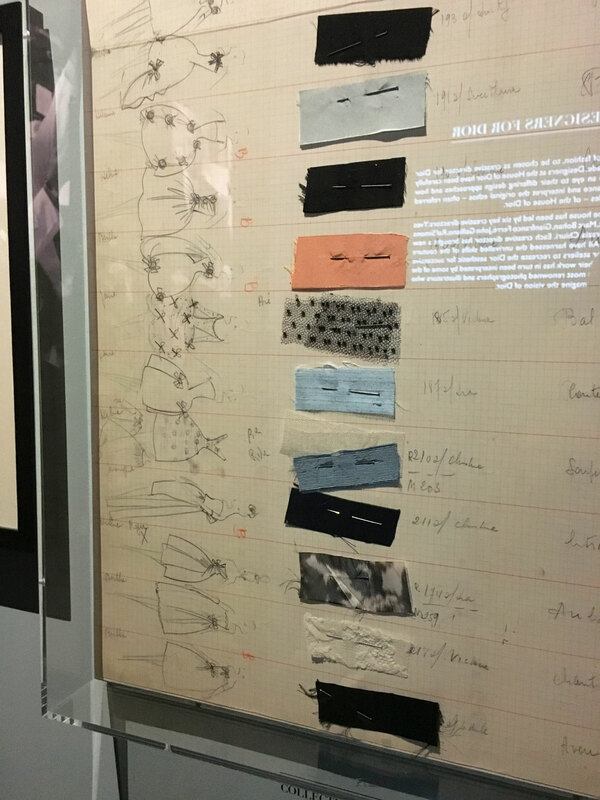 I found it really interesting to see that the stitching on the ties was white and not black. 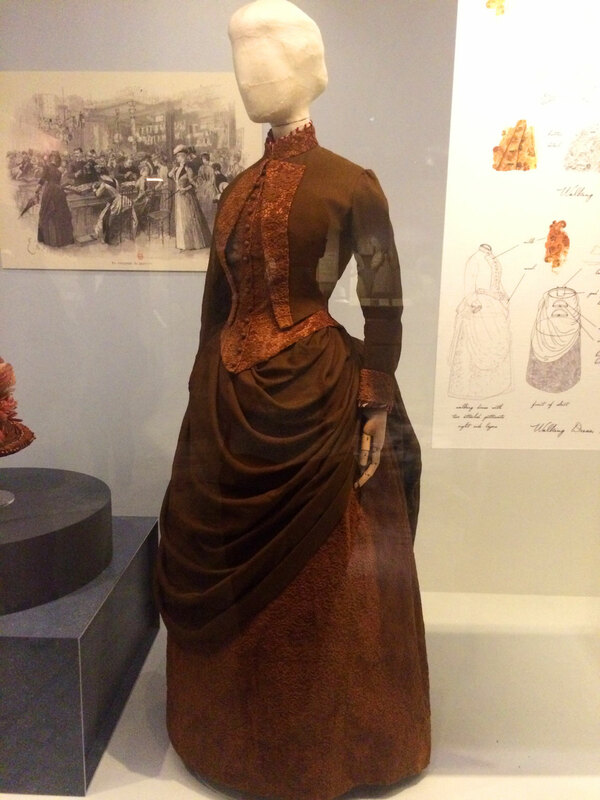 It was quite difficult to see how the outfit was assembled as it was a little dark. 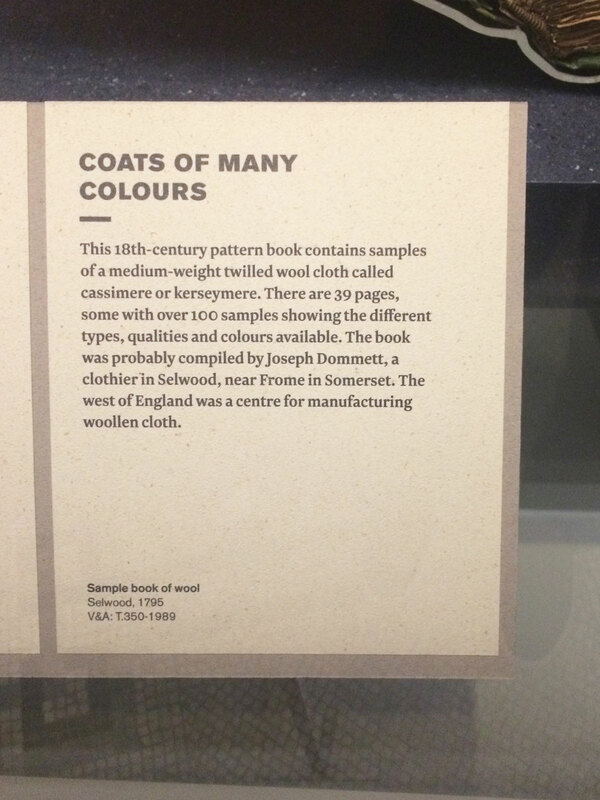 I enjoyed the exhibition so much I treated myself to the book, which I will get around to reading (and maybe reviewing) at some point in the future, when I magically have loads of spare time! 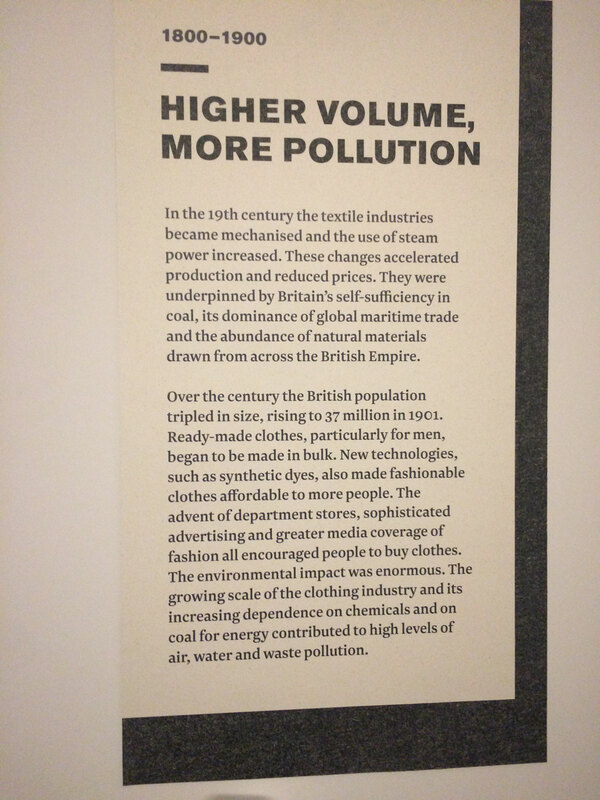 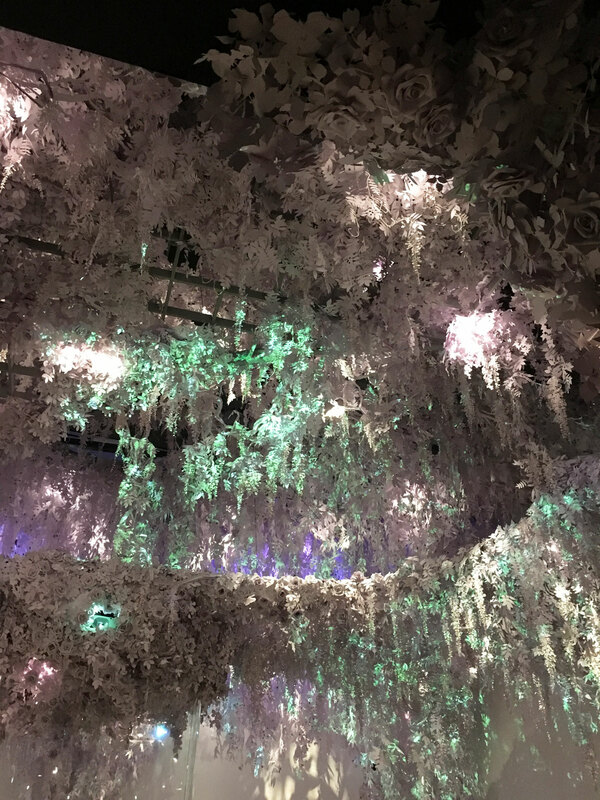 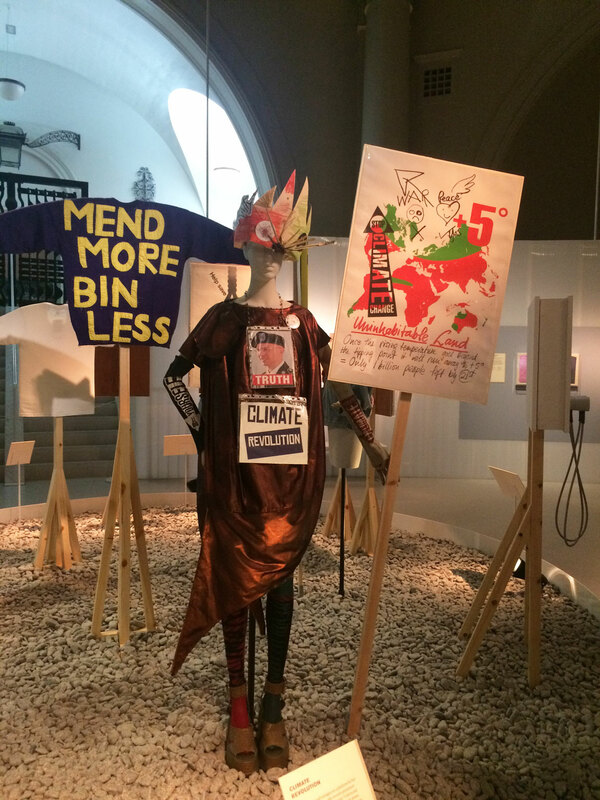 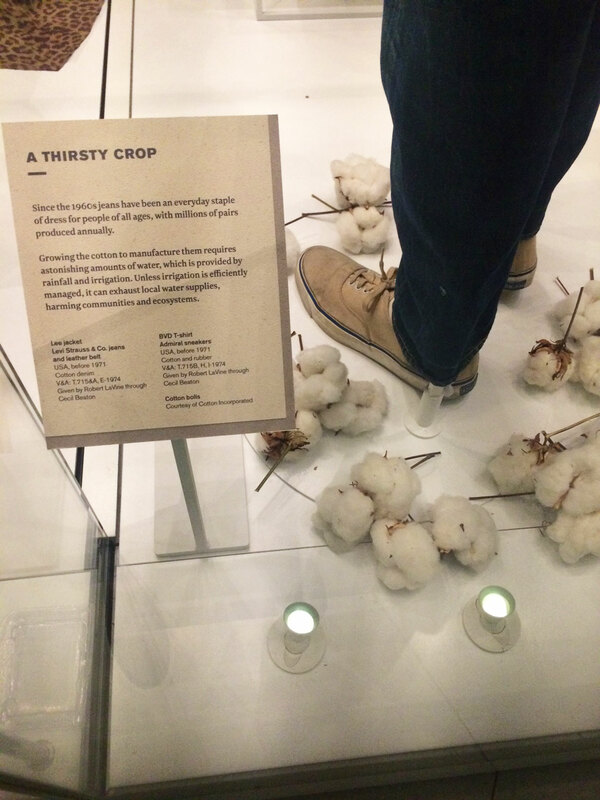 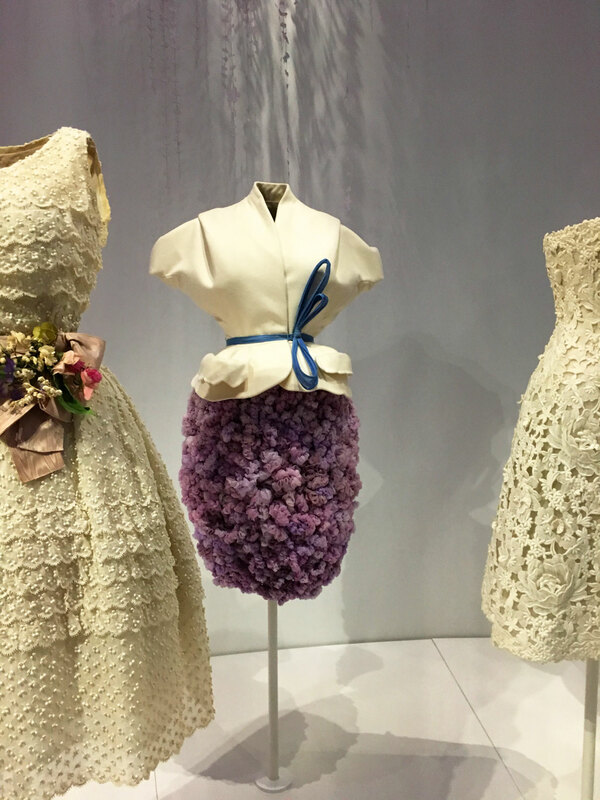 This exhibition really inspired me, along with the Love To Sew Podcast episodes on sustainability to be more mindful about my consumption of fabric and the kinds of fibres I use. 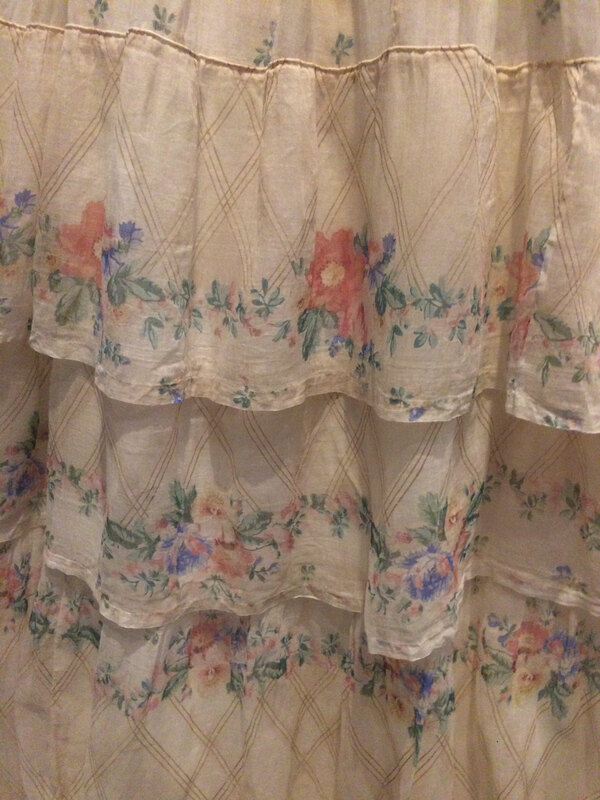 I always look in charity shops for fabric but they never seem to have anything good, but I’ll keep looking. 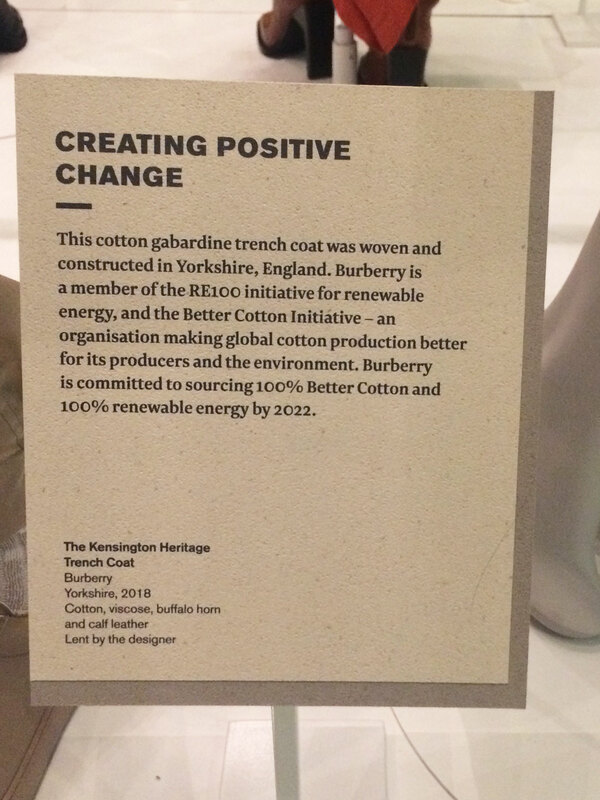 I also want to try to buy fabrics that are a bit less evil for the environment and the people who live where they are produced. 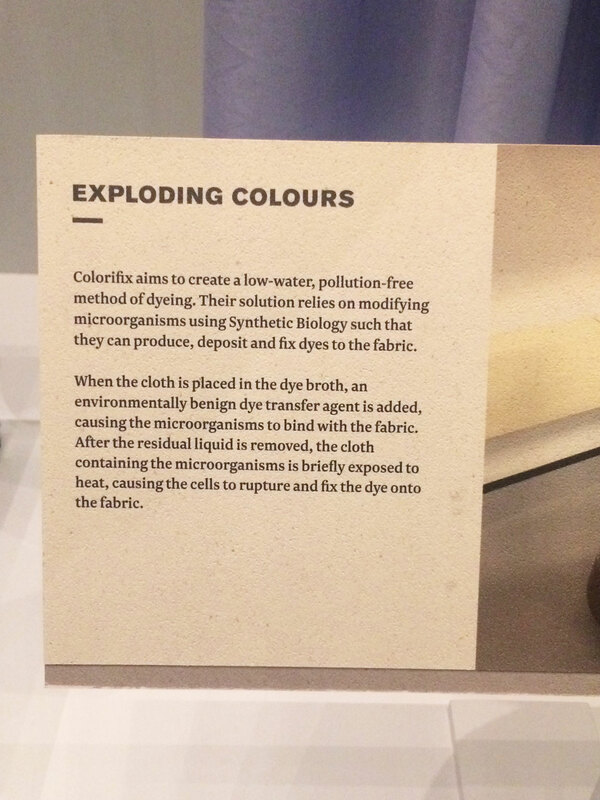 Do you think you’ll make it to the exhibition?